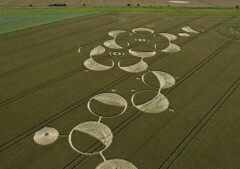 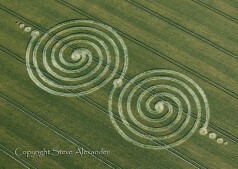 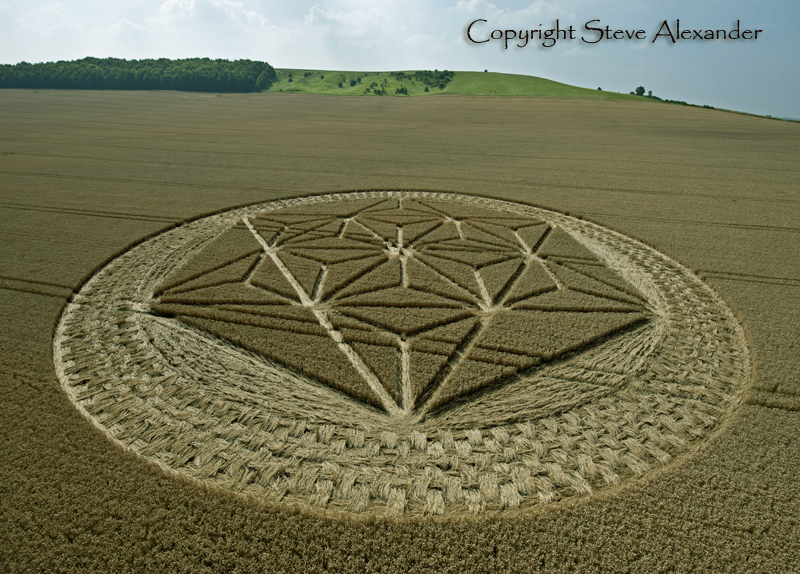 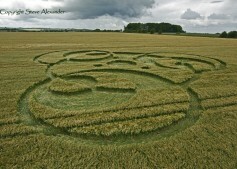 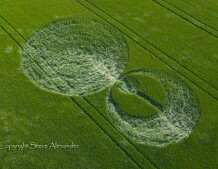 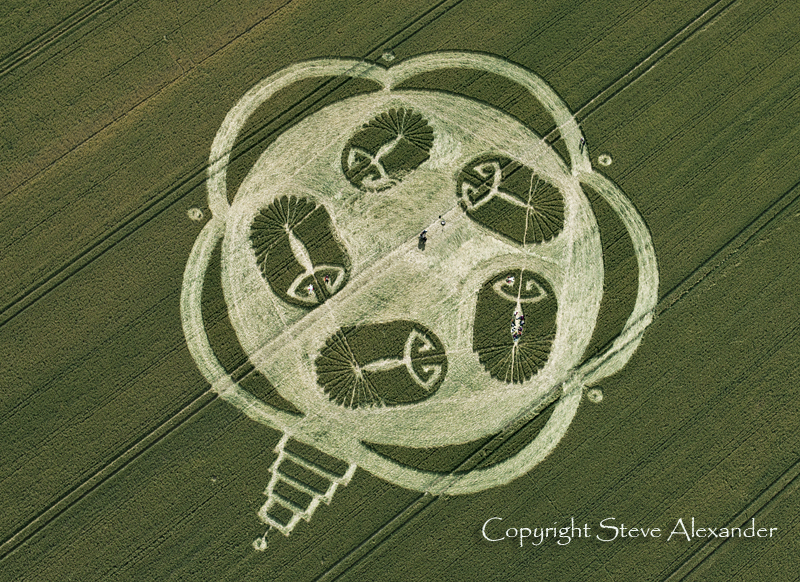 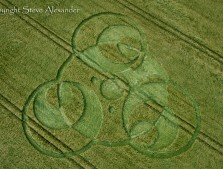 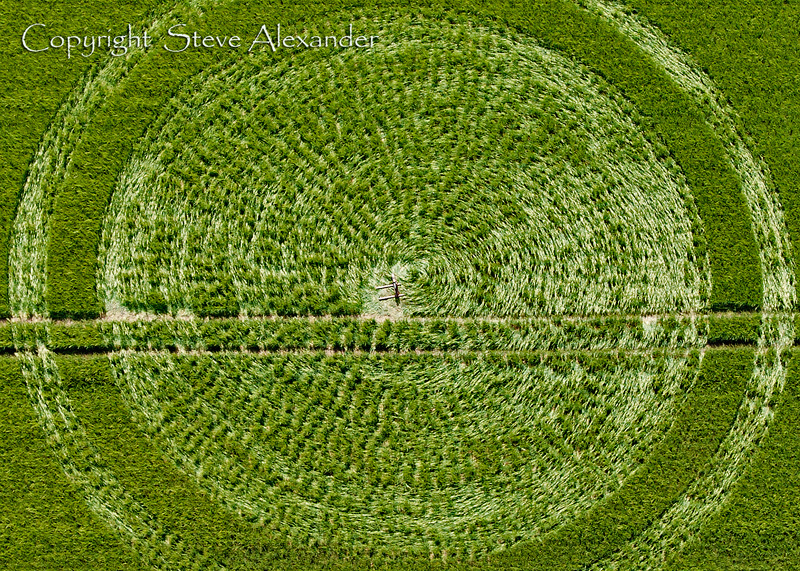 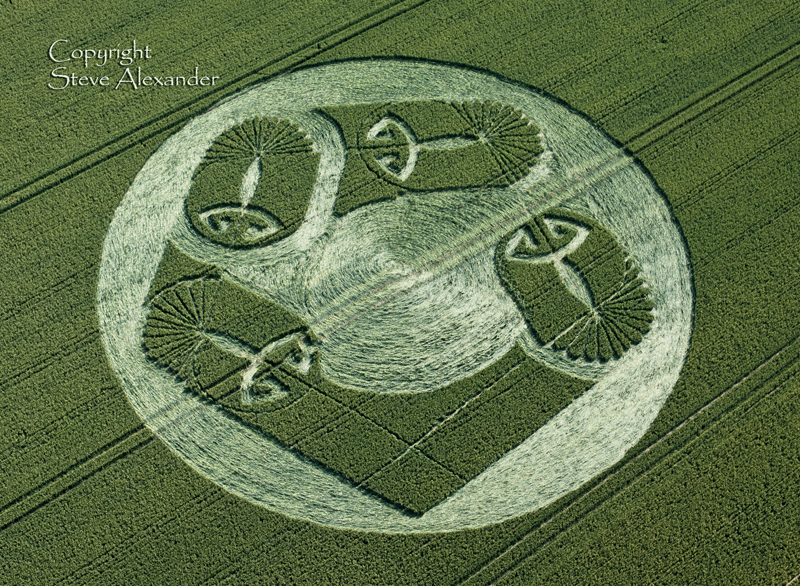 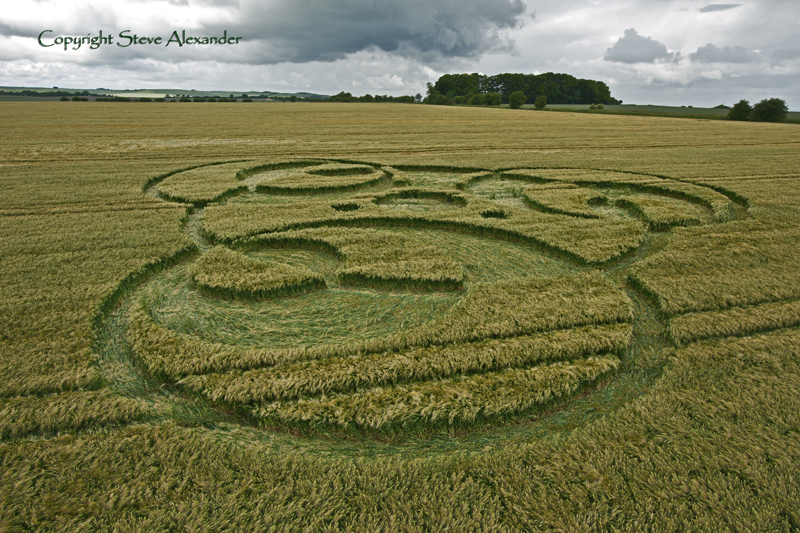 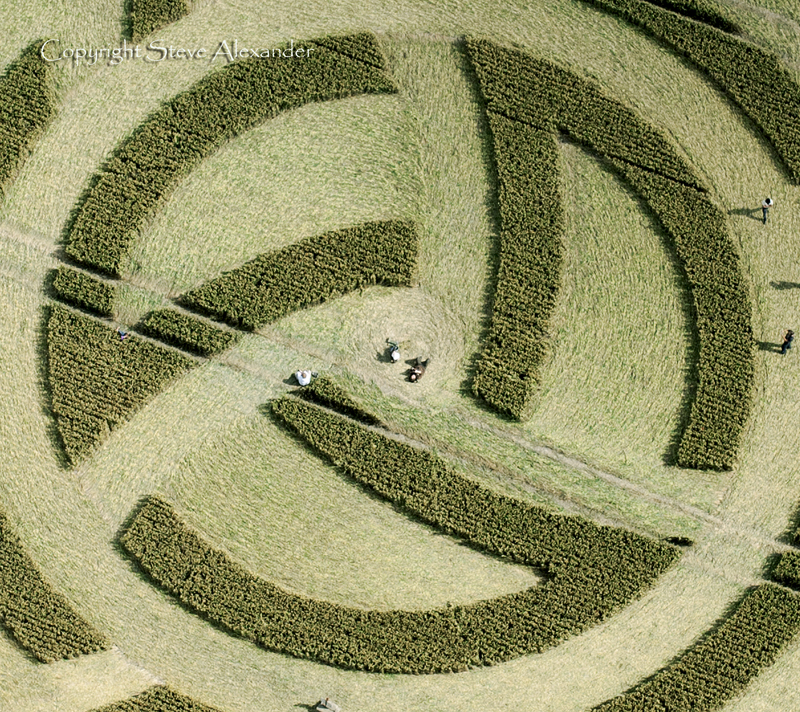 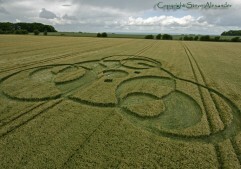 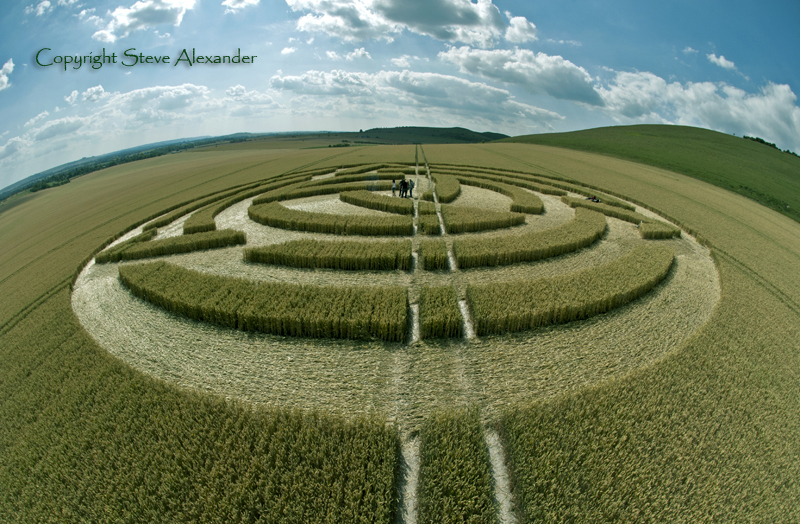 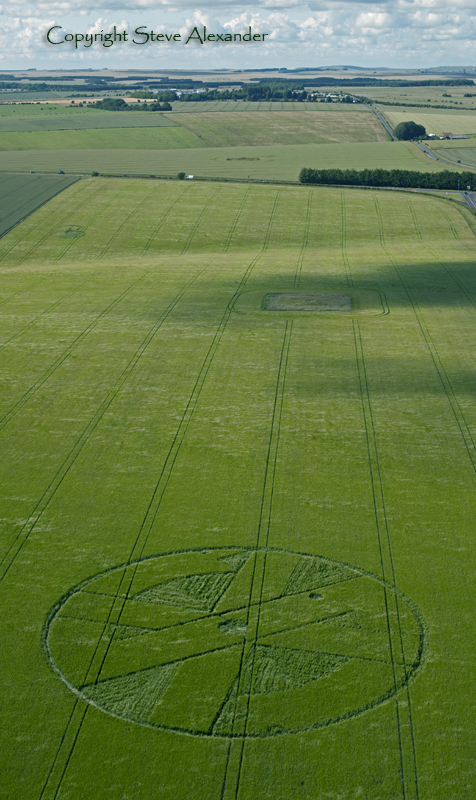 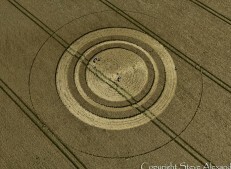 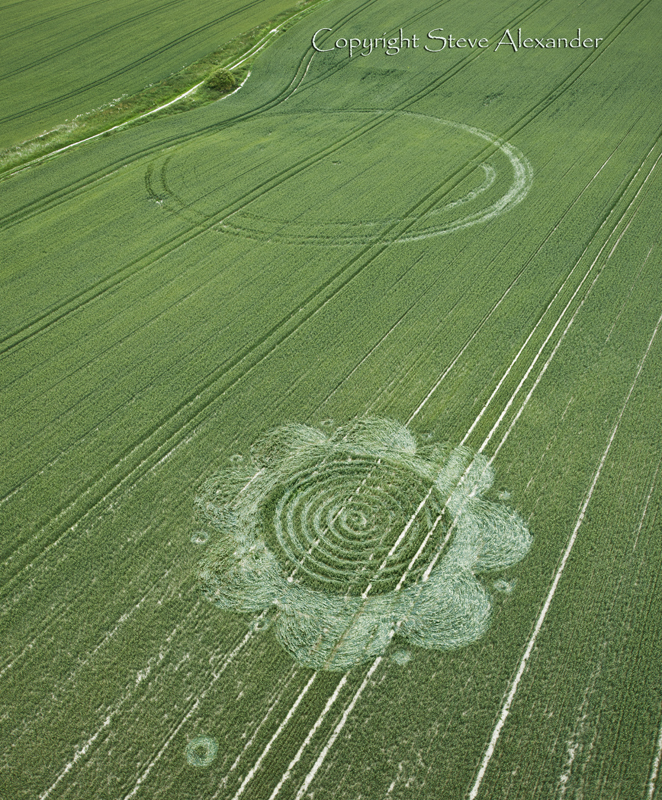 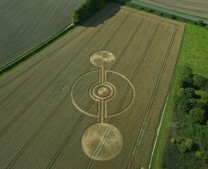 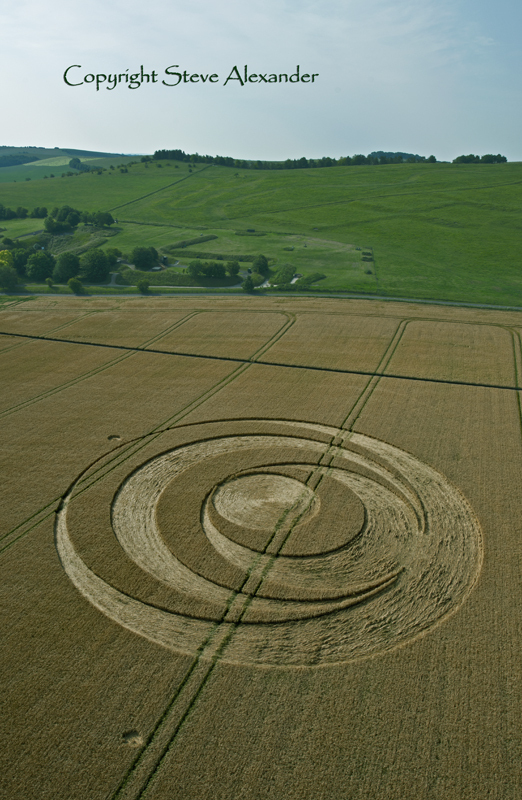 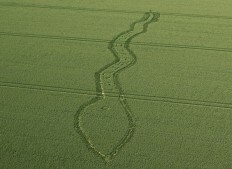 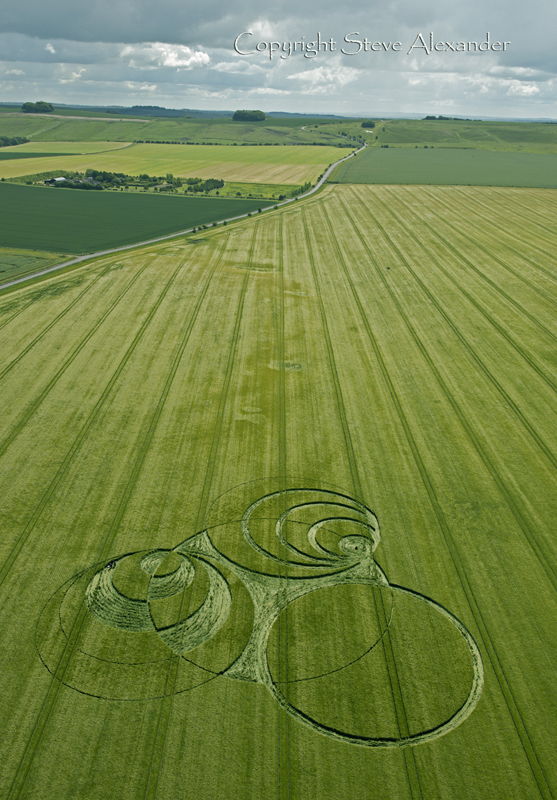 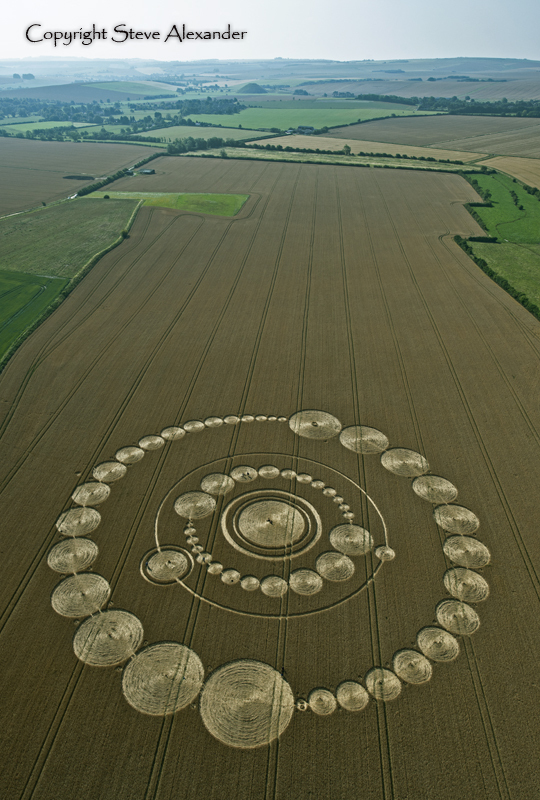 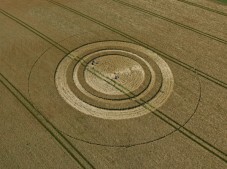 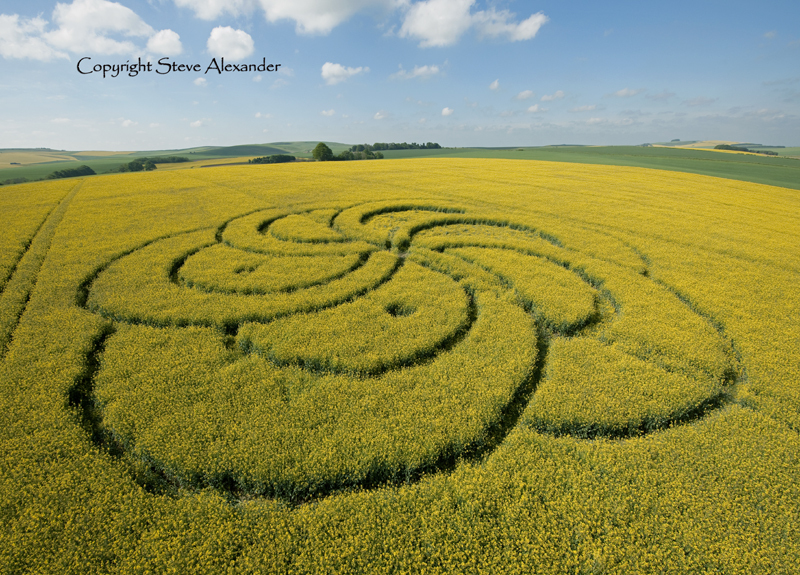 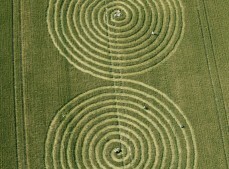 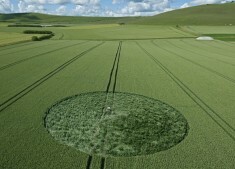 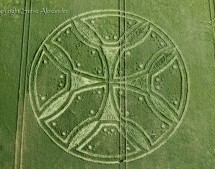 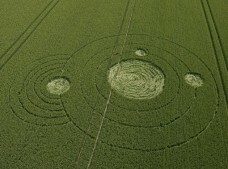 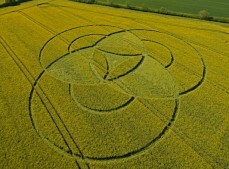 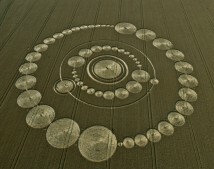 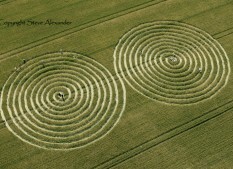 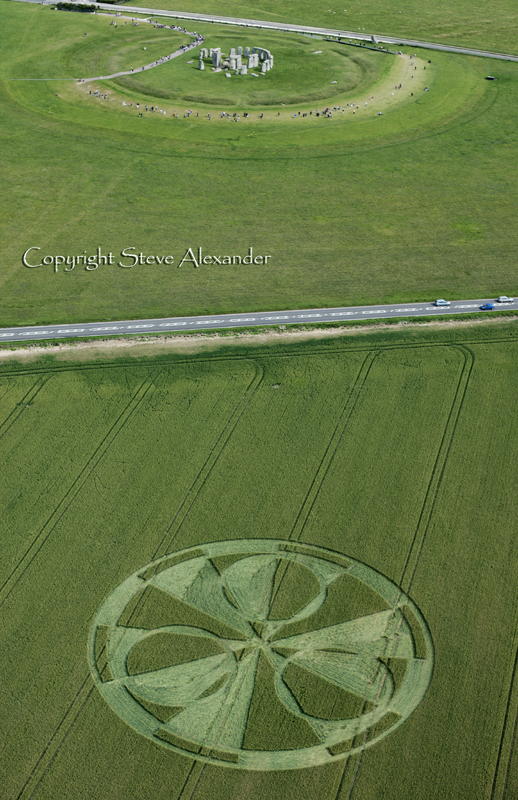 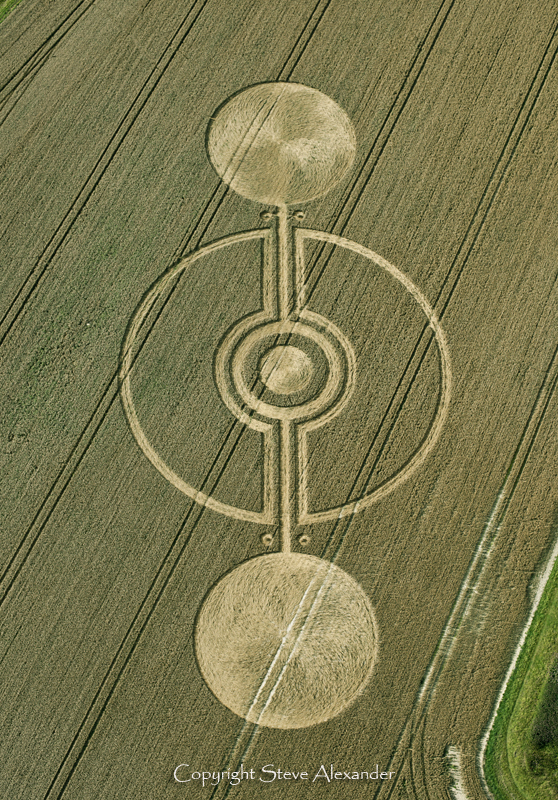 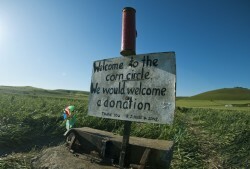 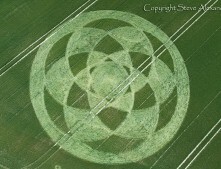 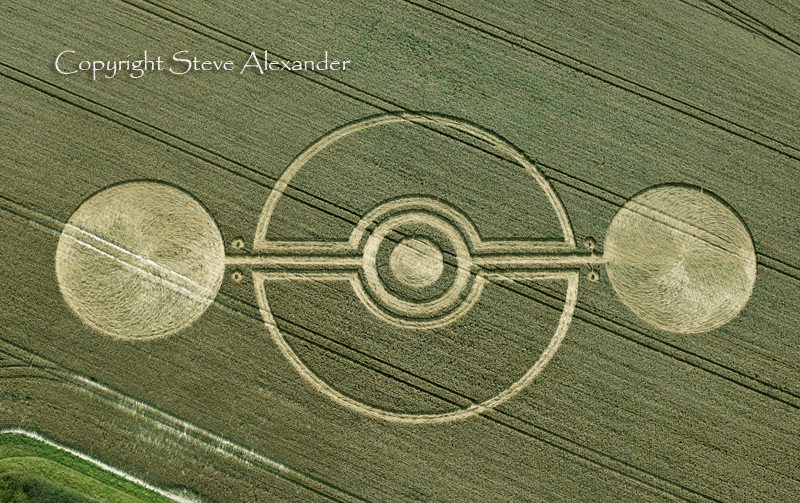 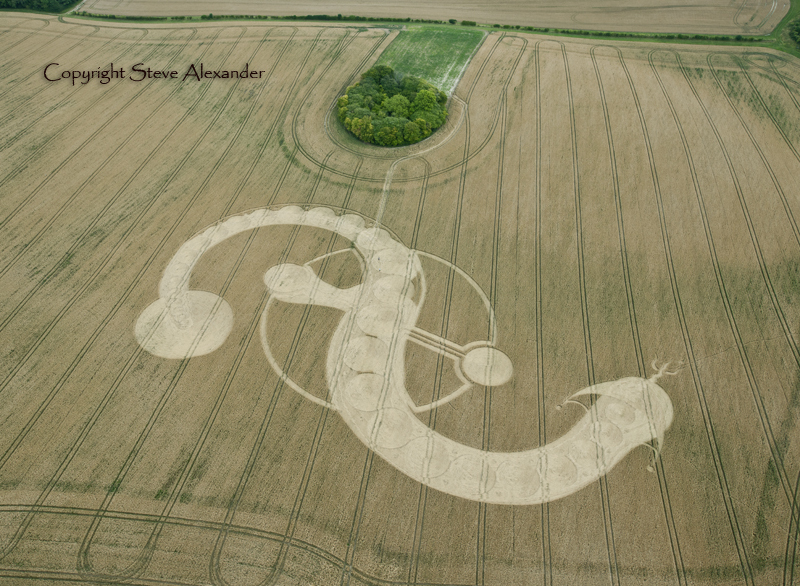 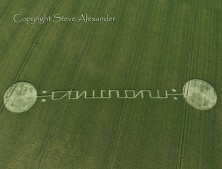 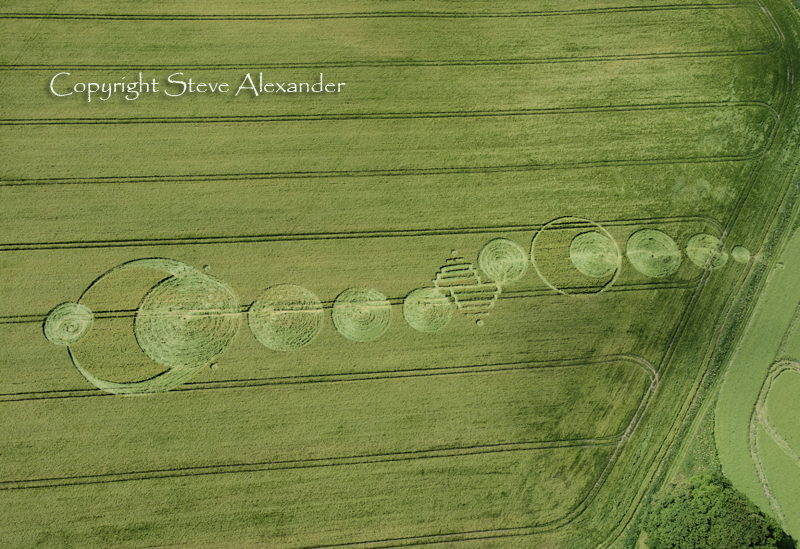 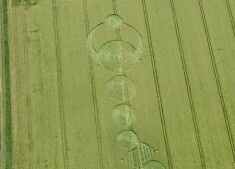 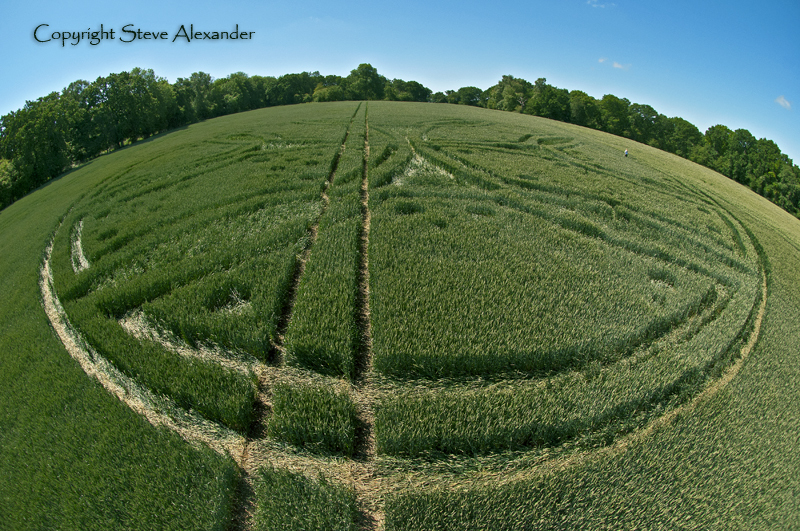 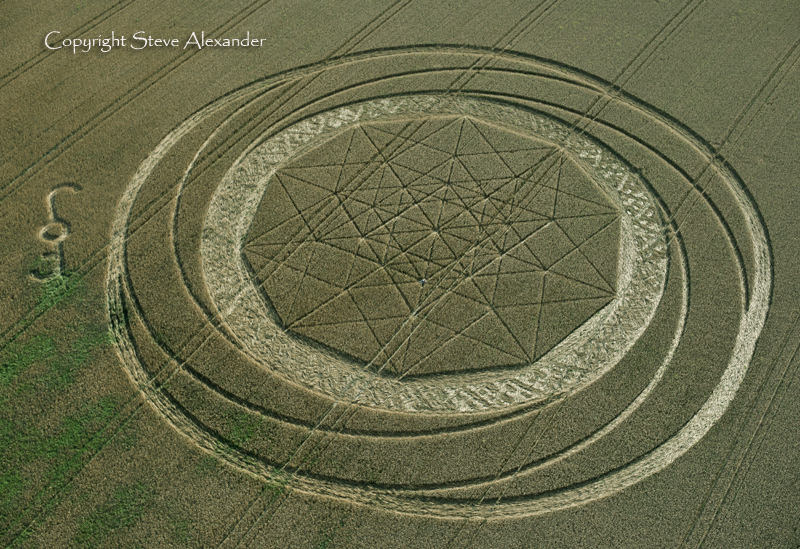 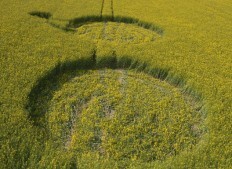 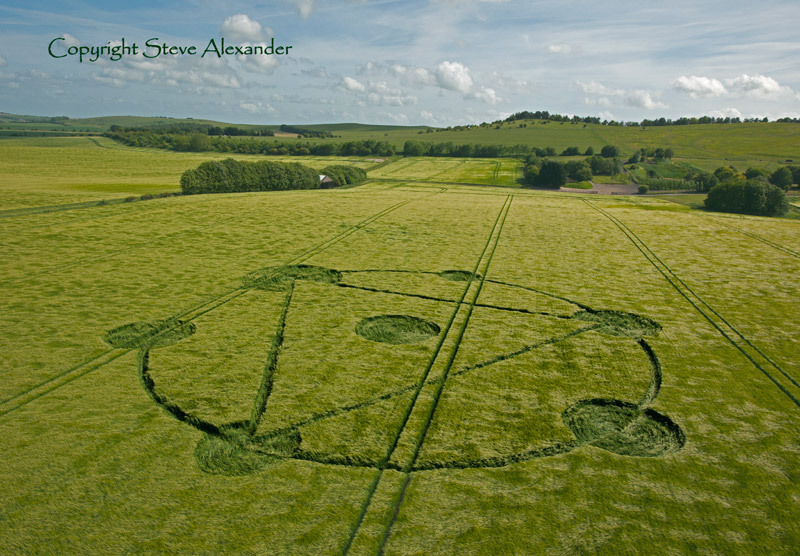 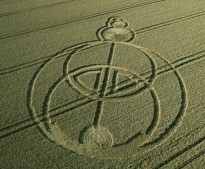 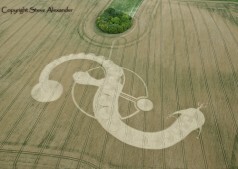 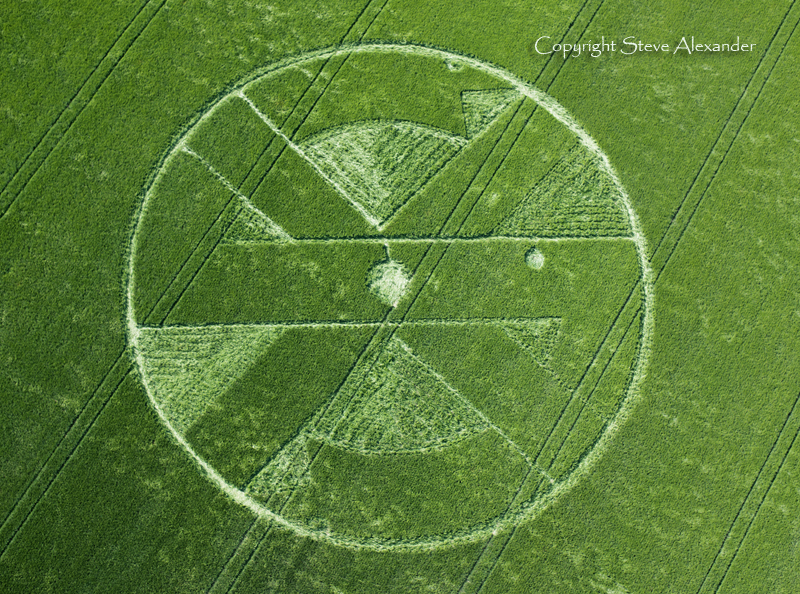 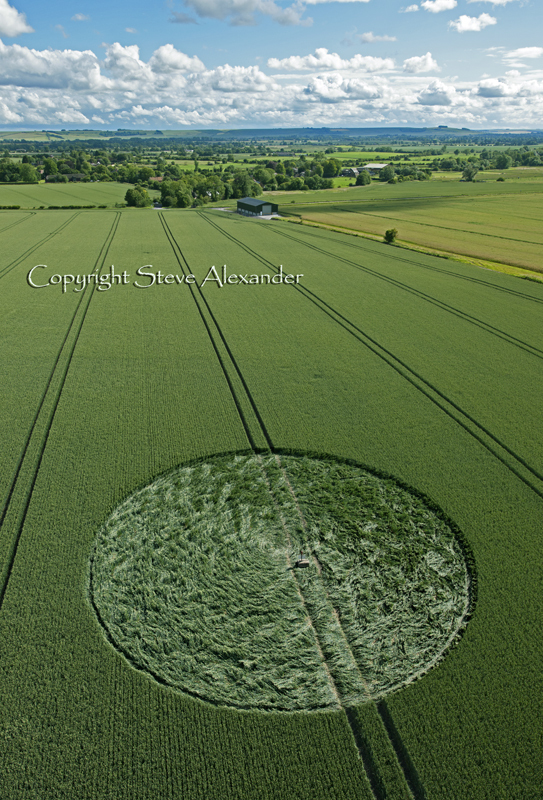 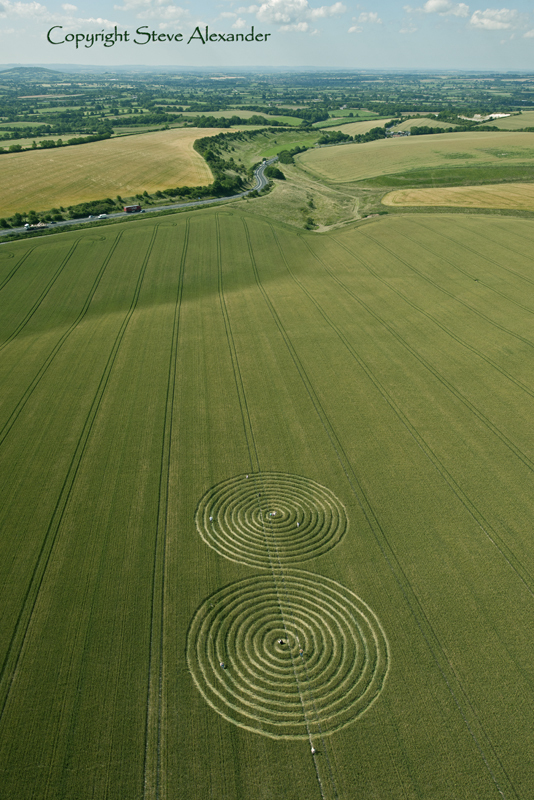 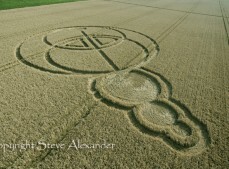 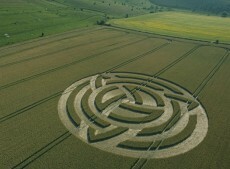 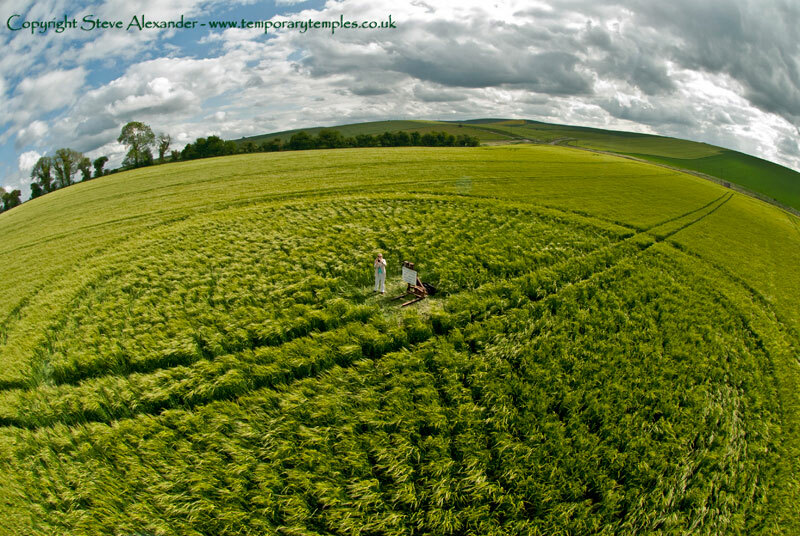 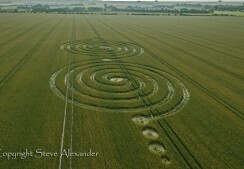 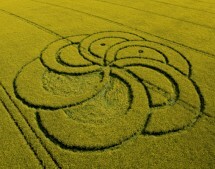 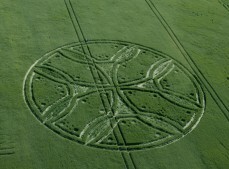 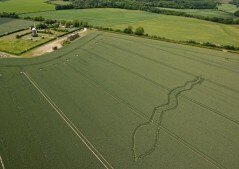 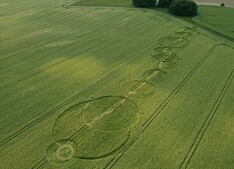 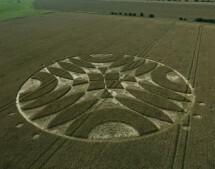 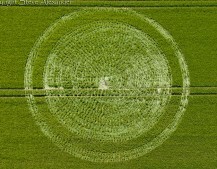 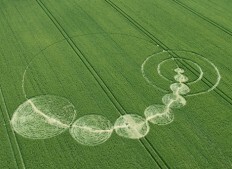 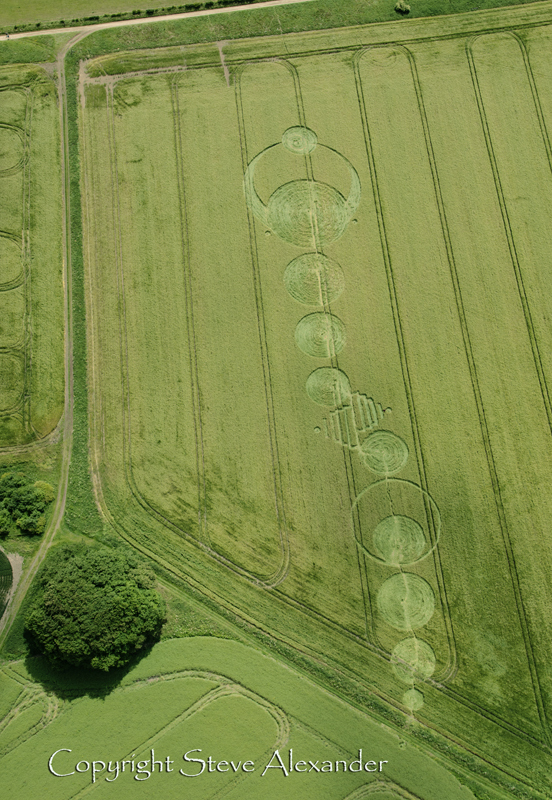 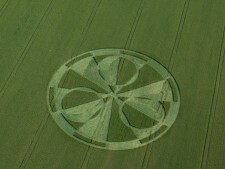 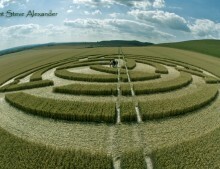 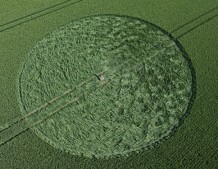 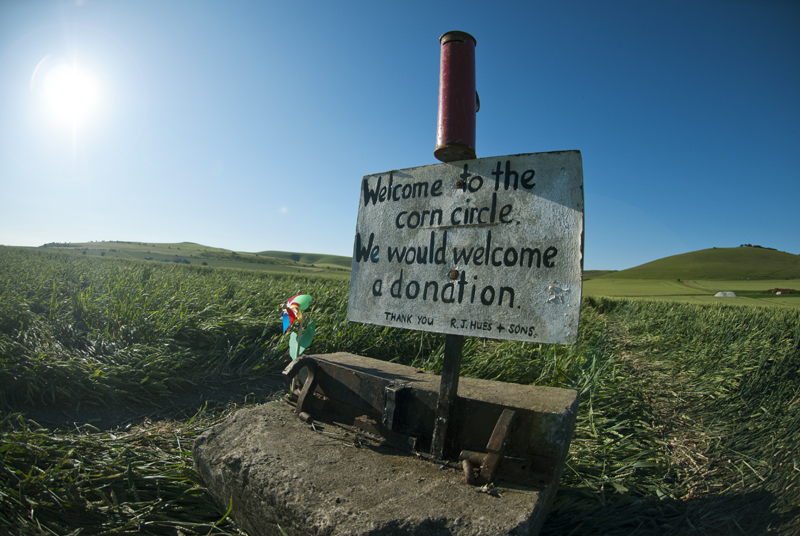 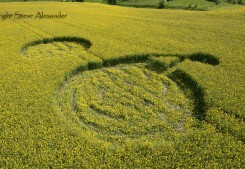 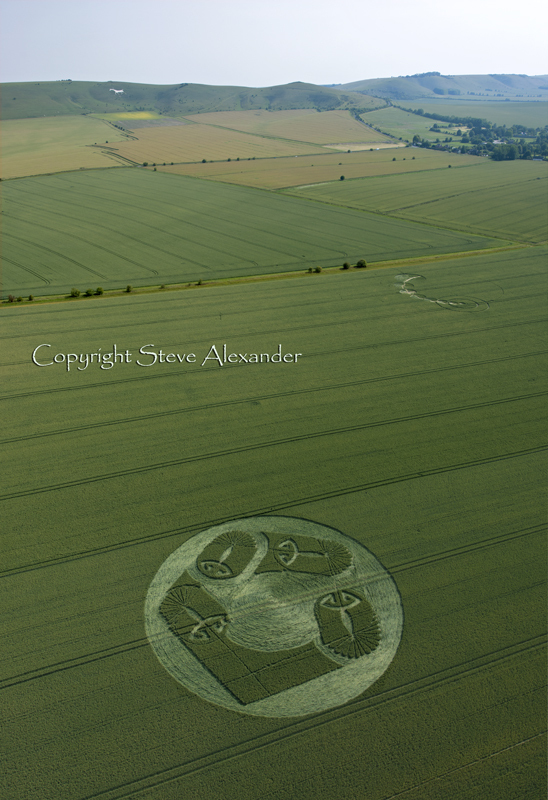 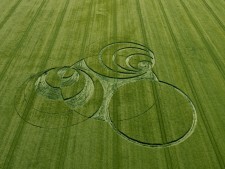 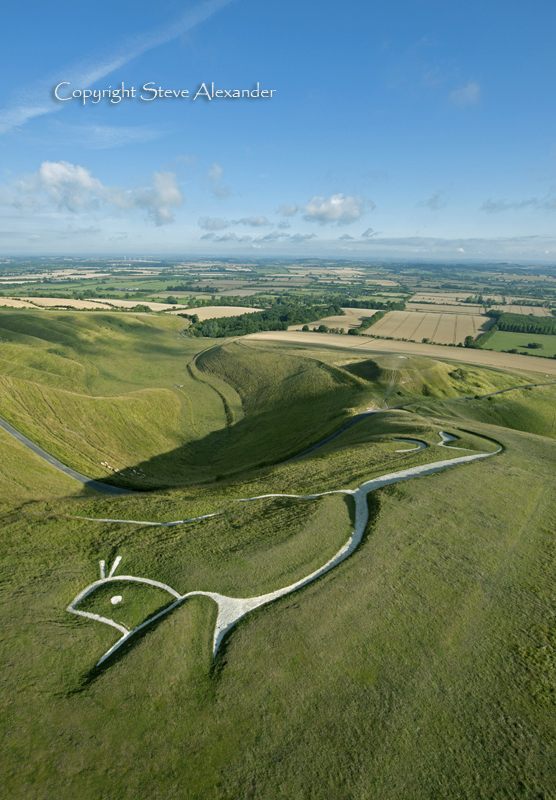 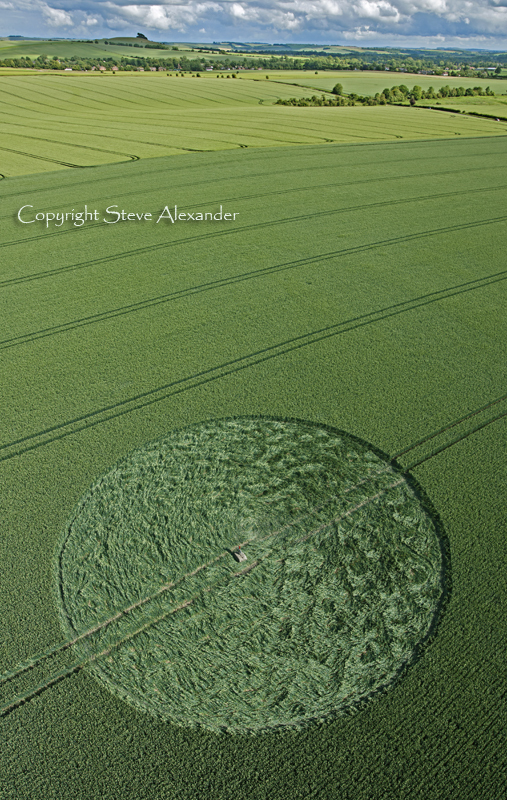 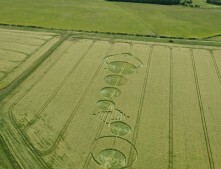 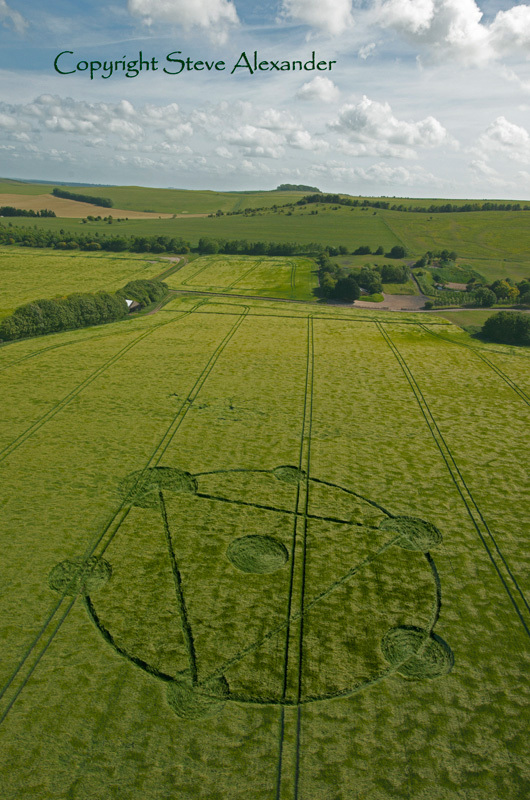 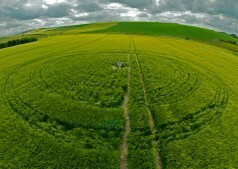 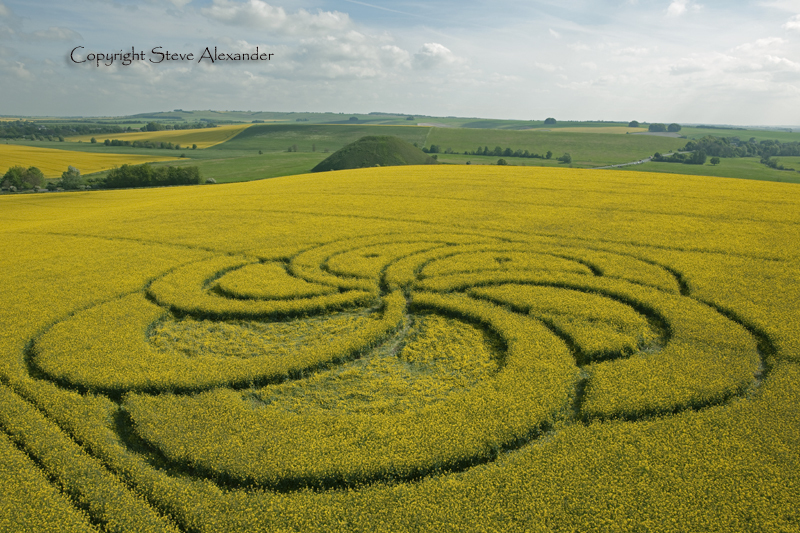 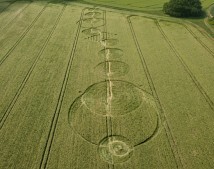 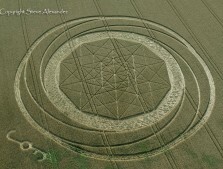 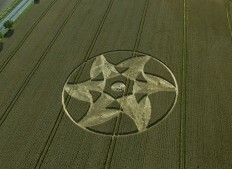 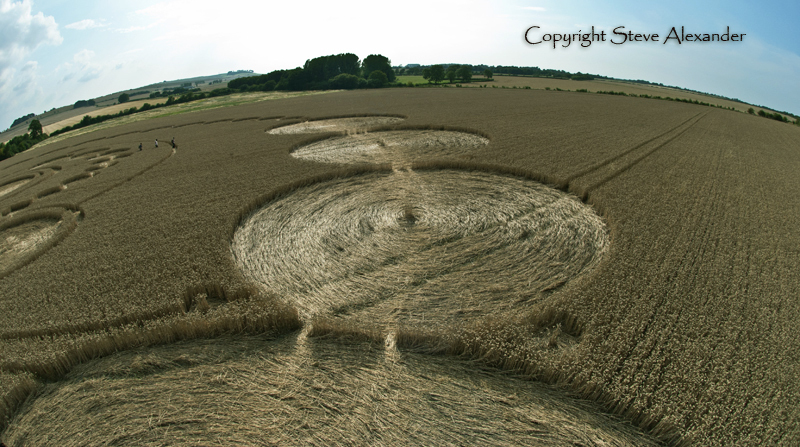 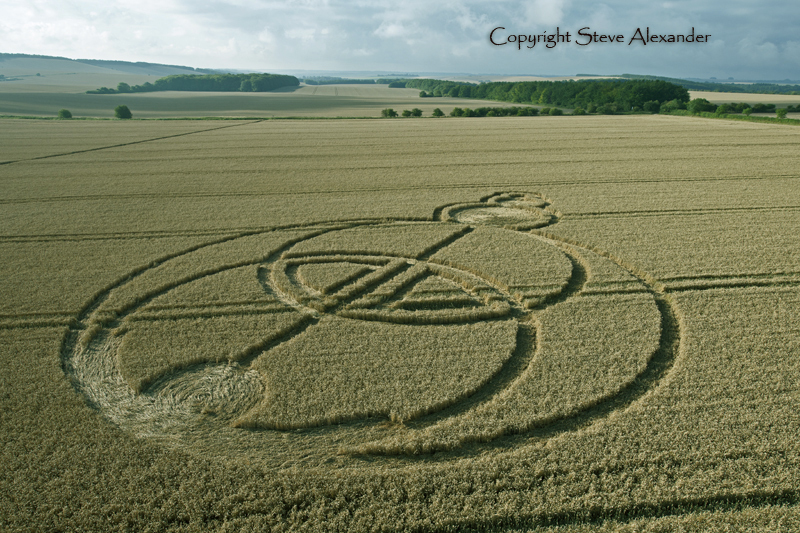 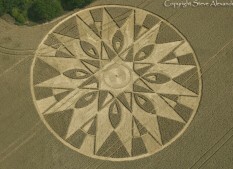 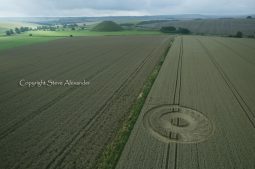 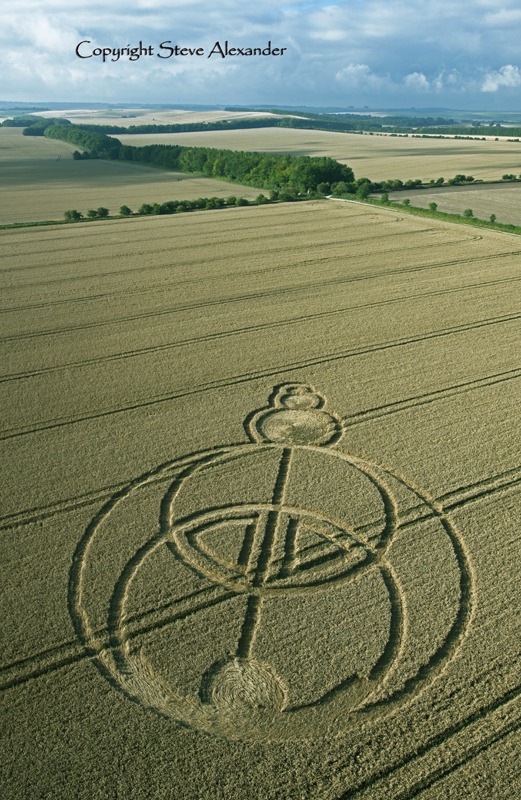 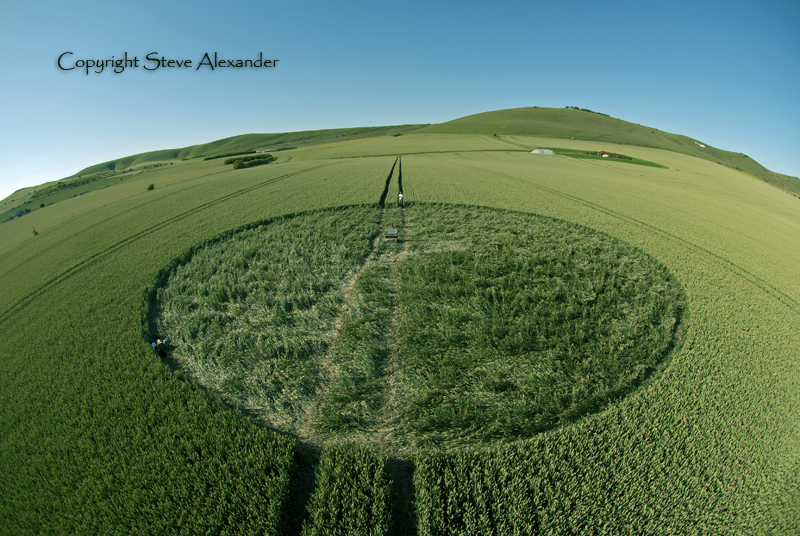 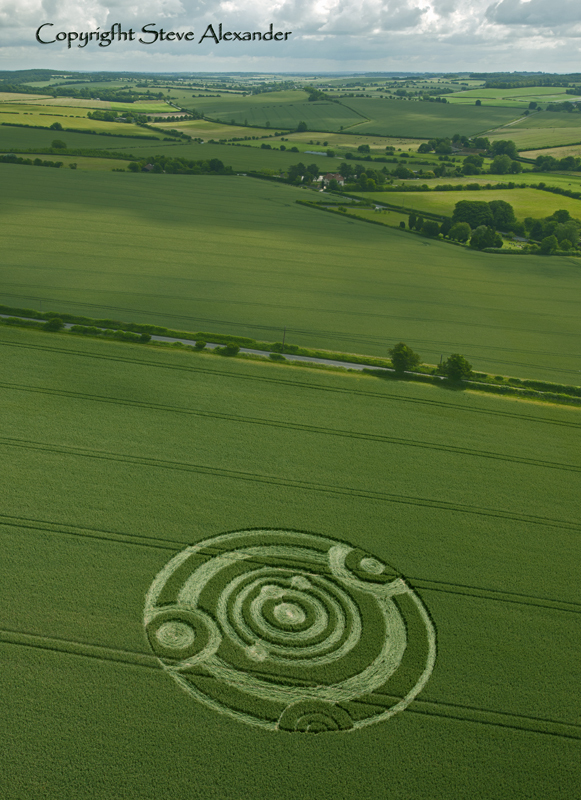 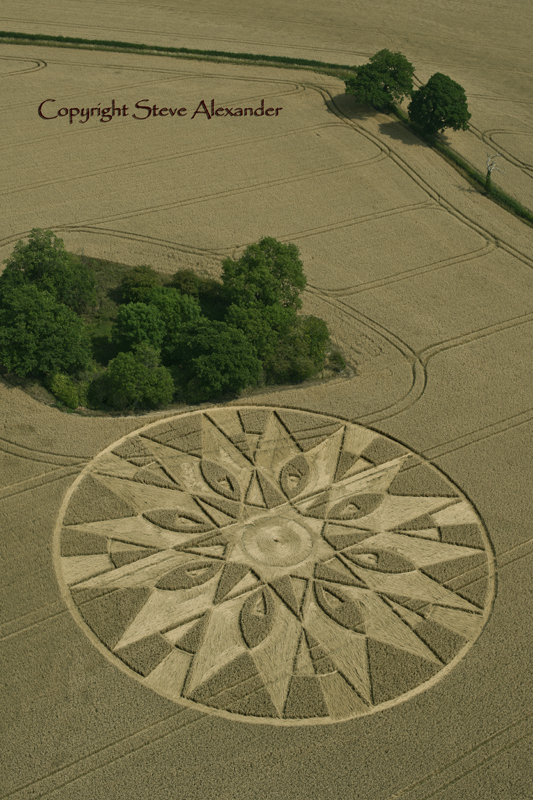 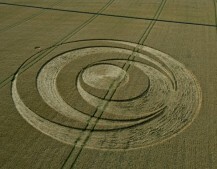 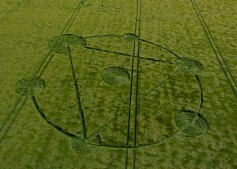 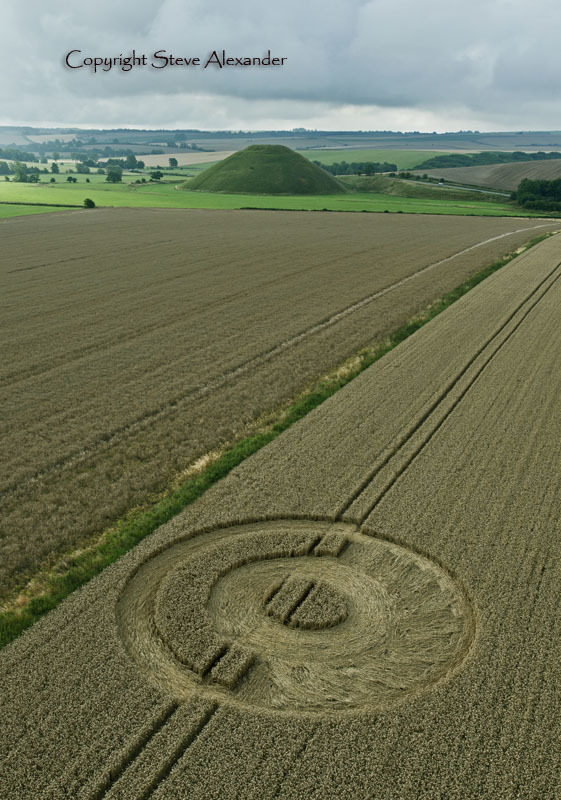 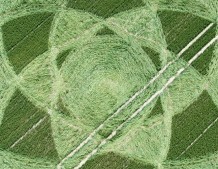 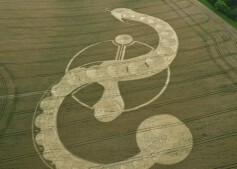 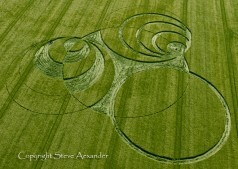 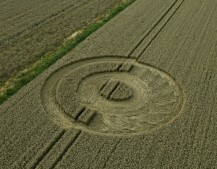 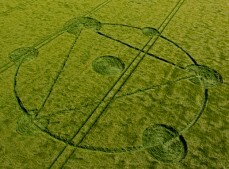 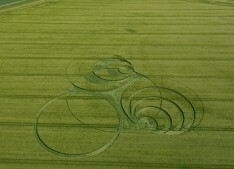 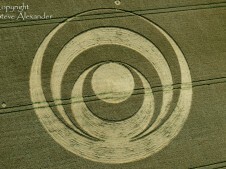 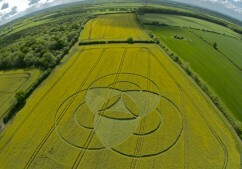 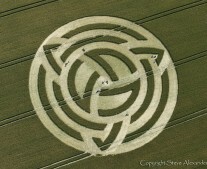 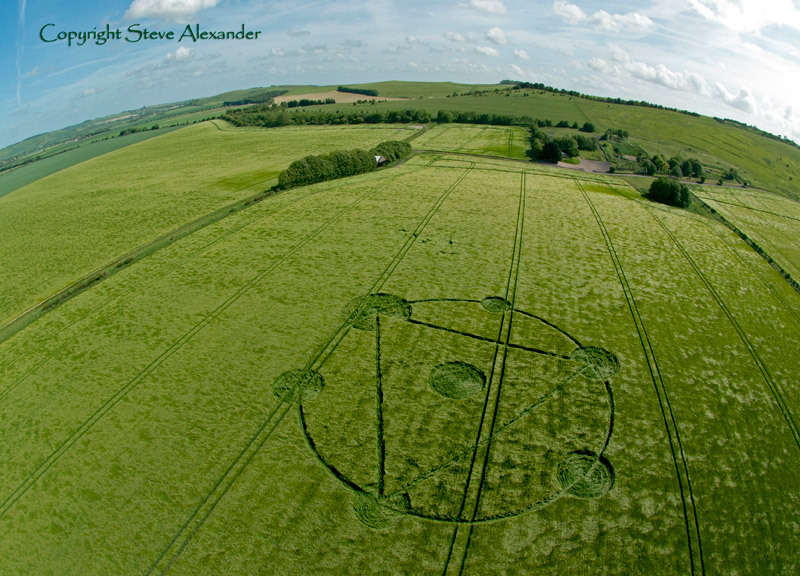 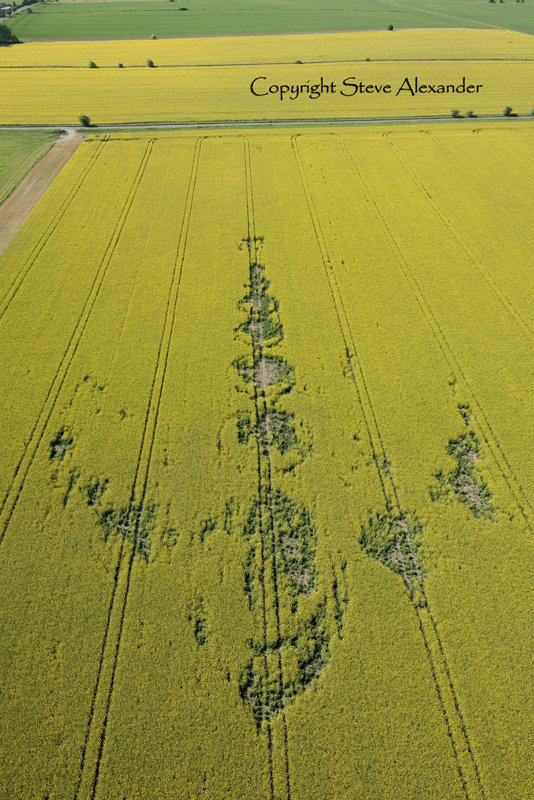 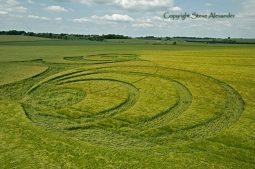 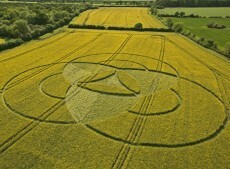 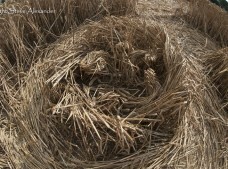 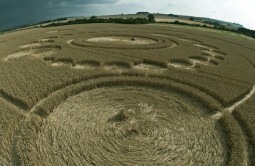 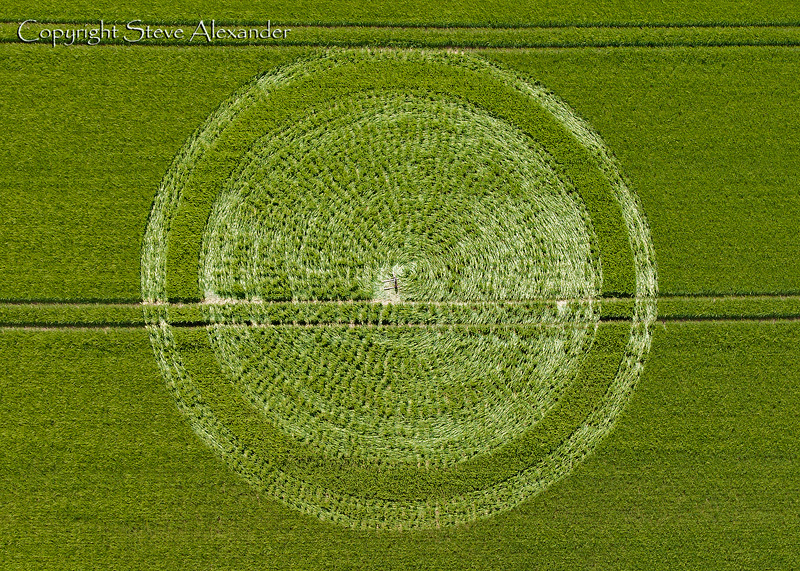 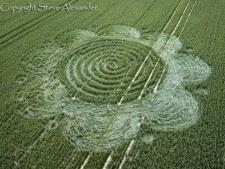 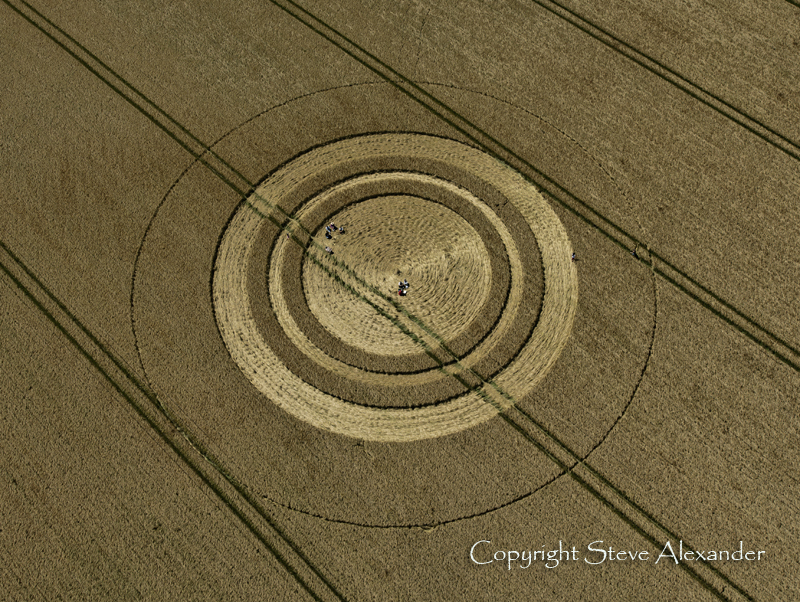 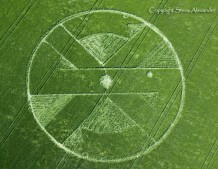 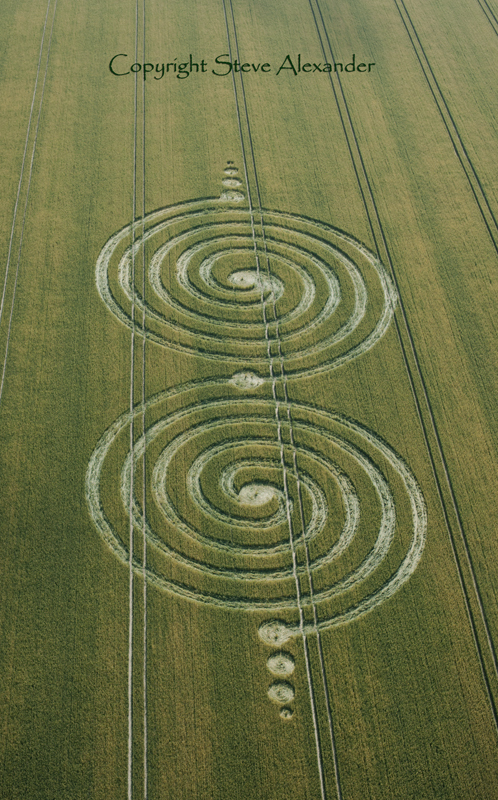 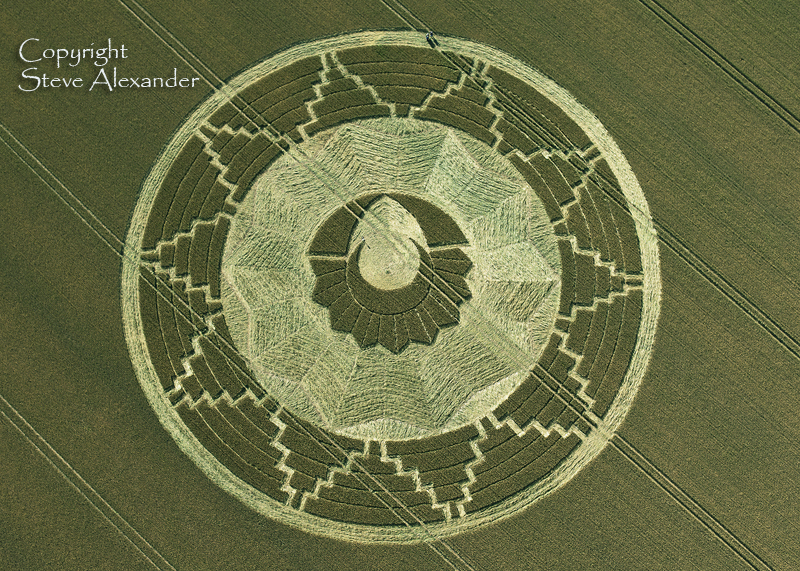 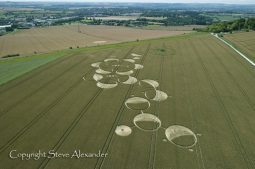 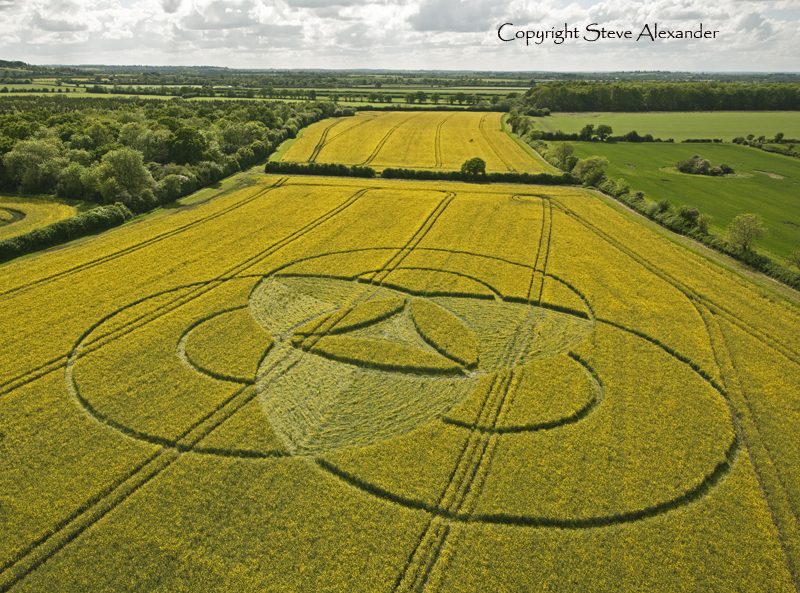 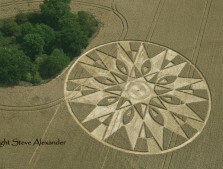 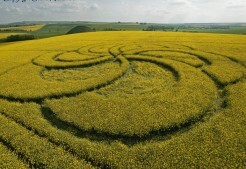 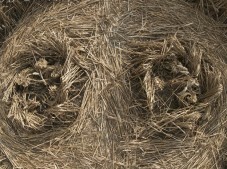 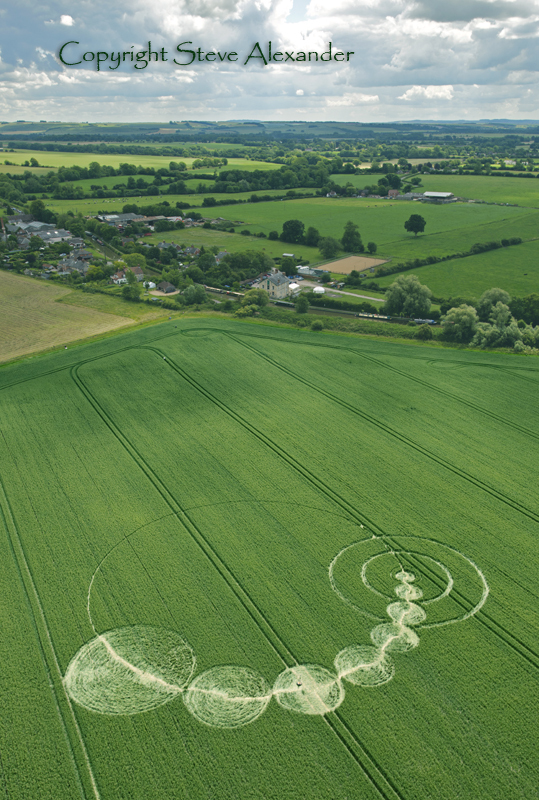 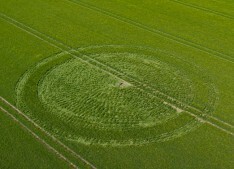 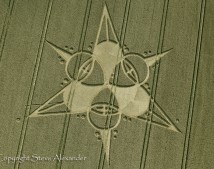 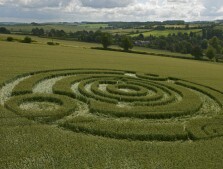 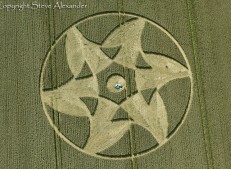 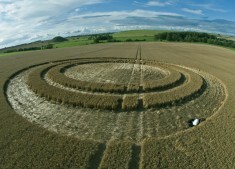 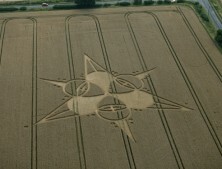 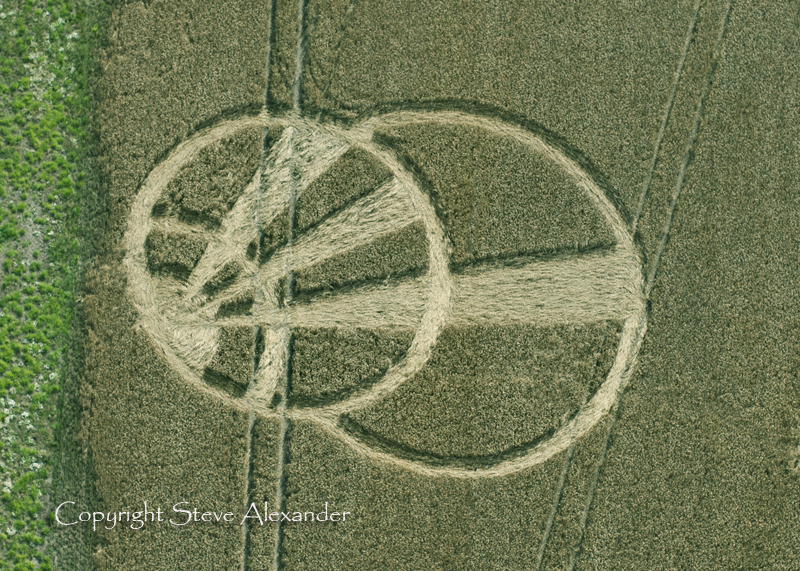 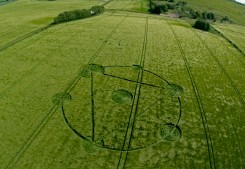 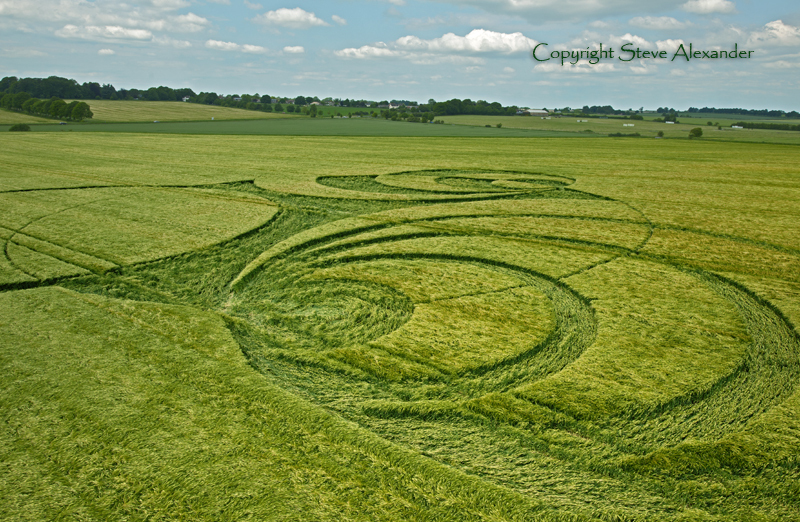 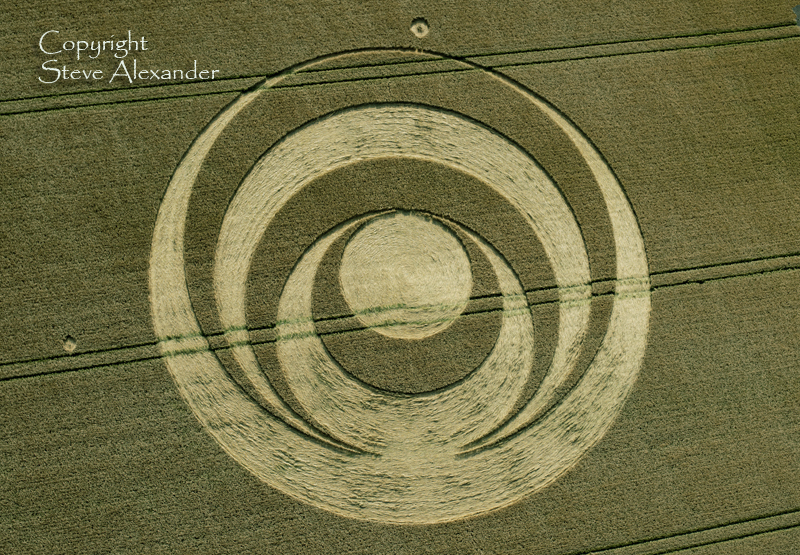 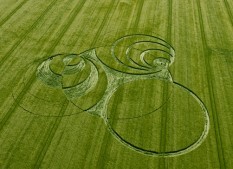 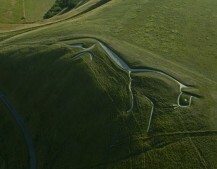 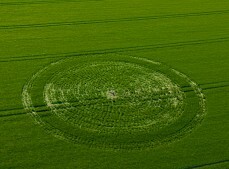 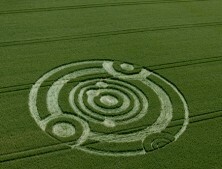 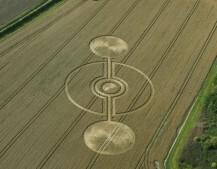 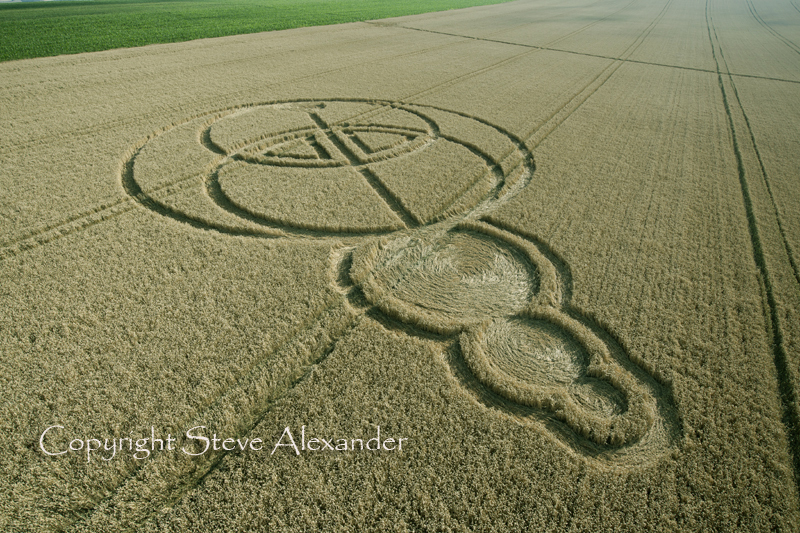 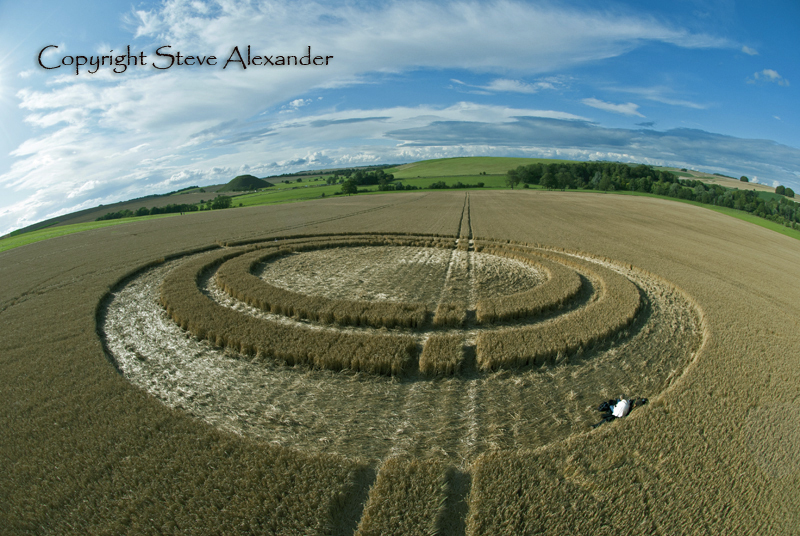 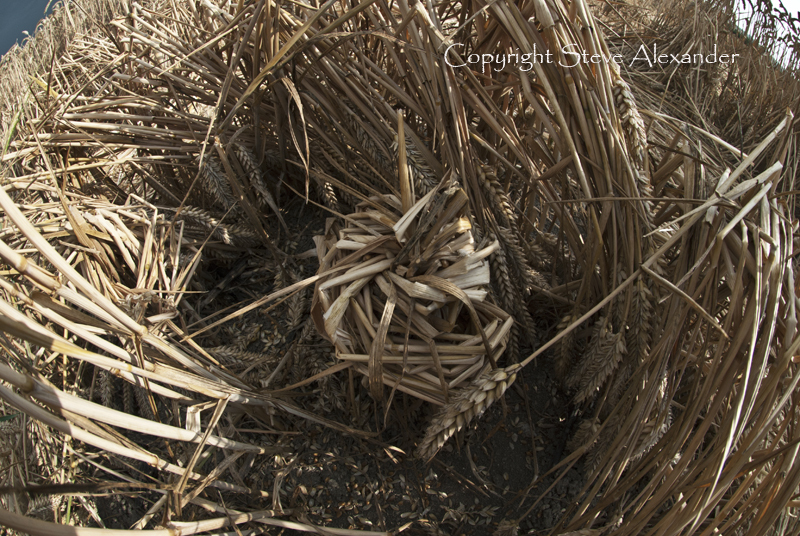 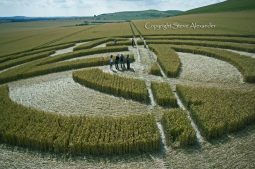 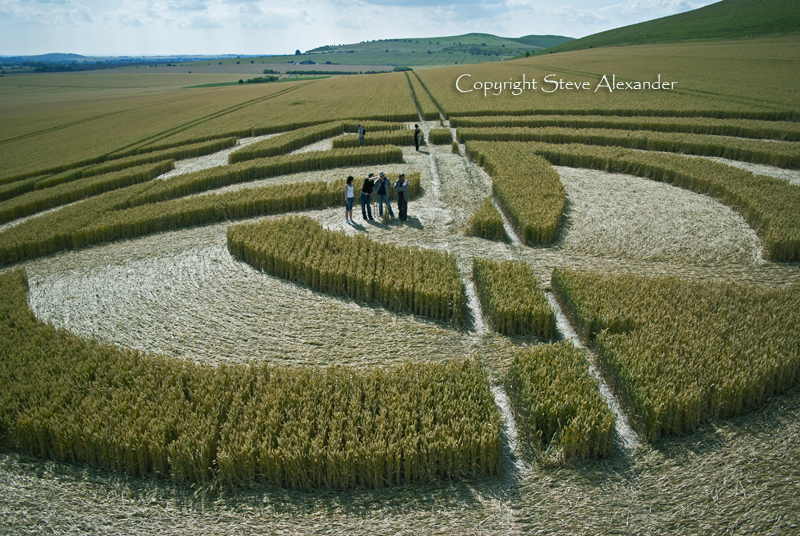 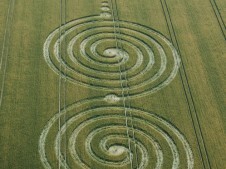 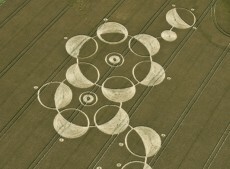 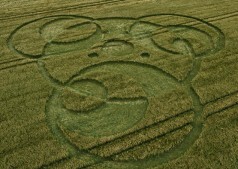 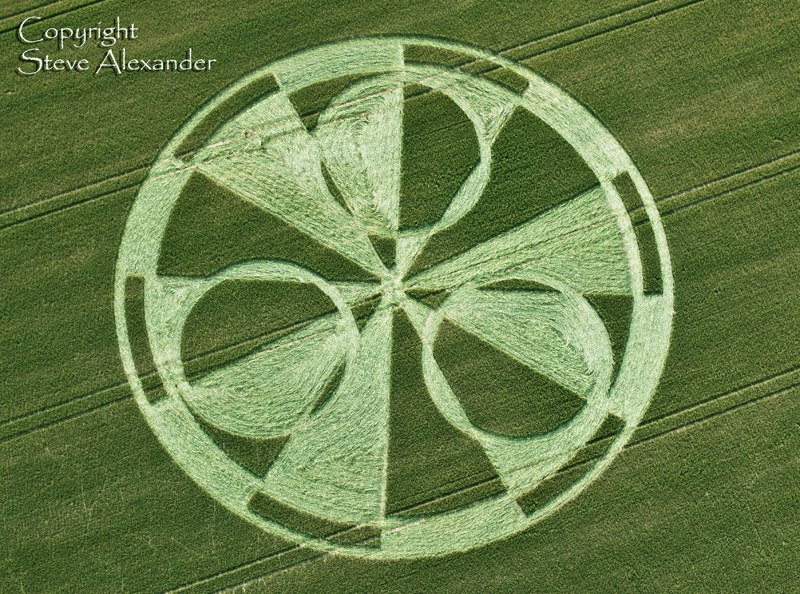 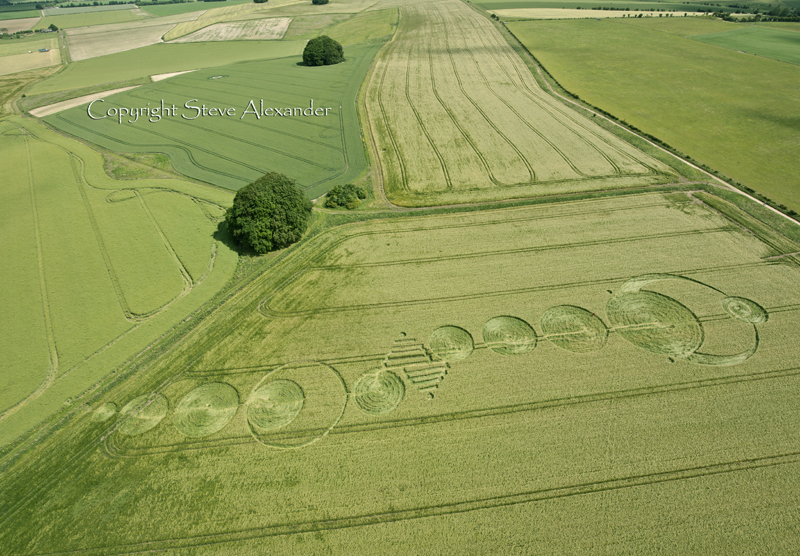 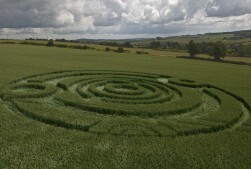 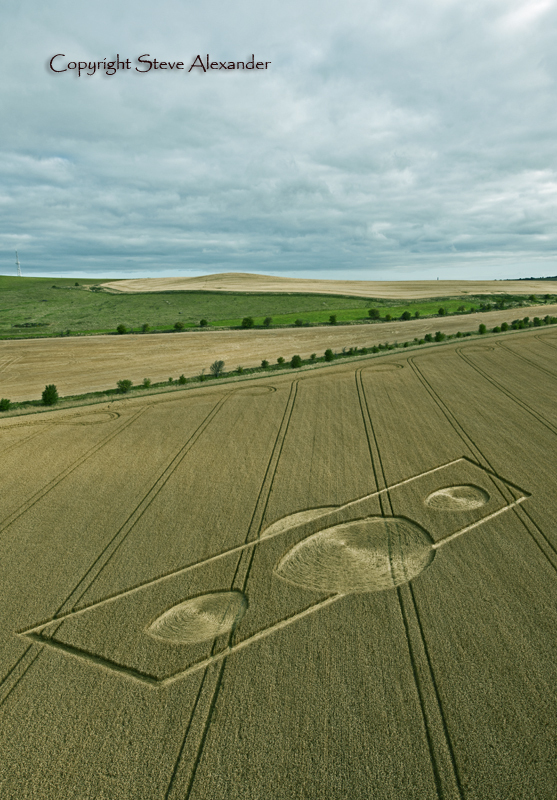 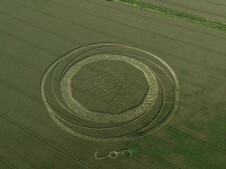 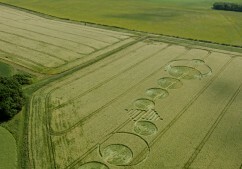 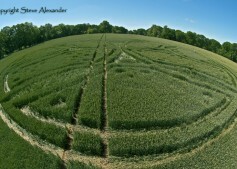 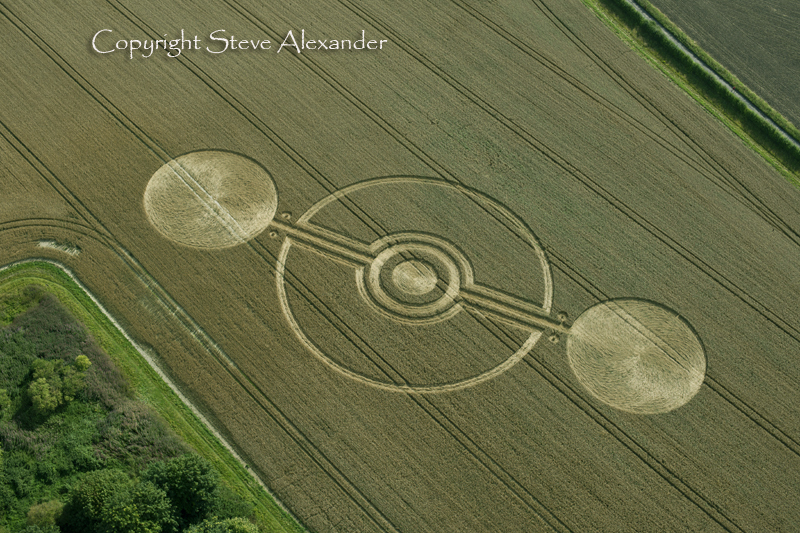 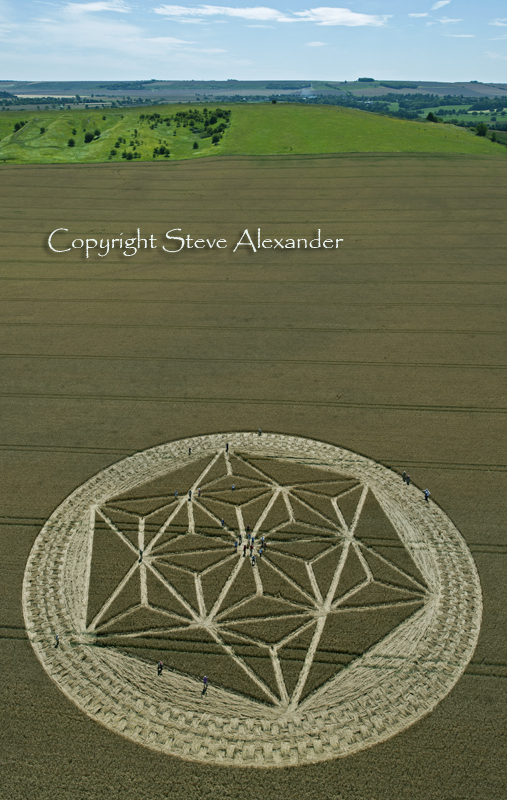 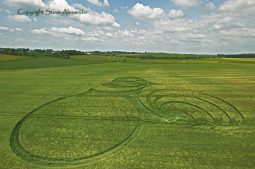 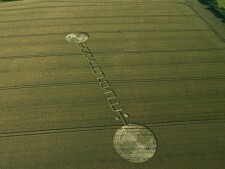 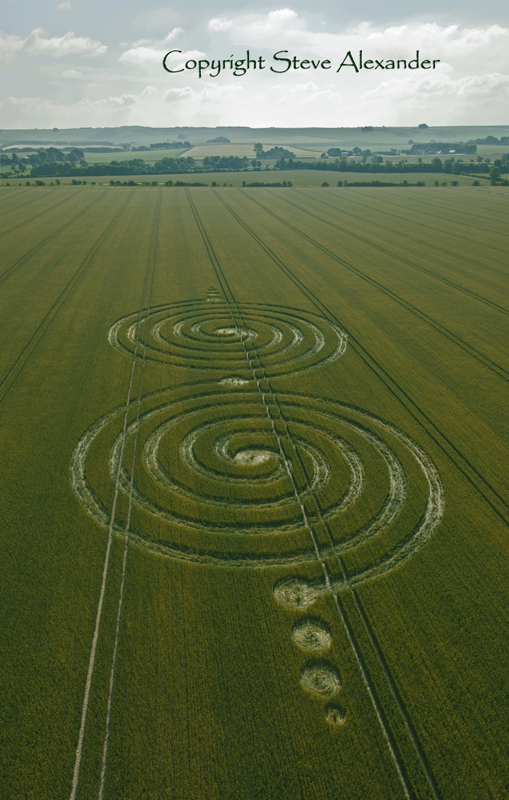 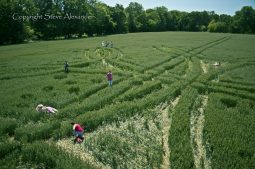 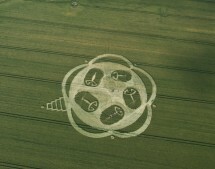 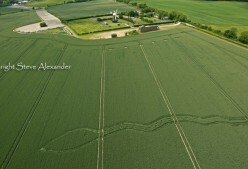 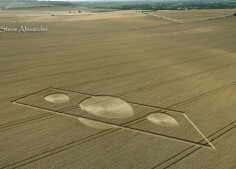 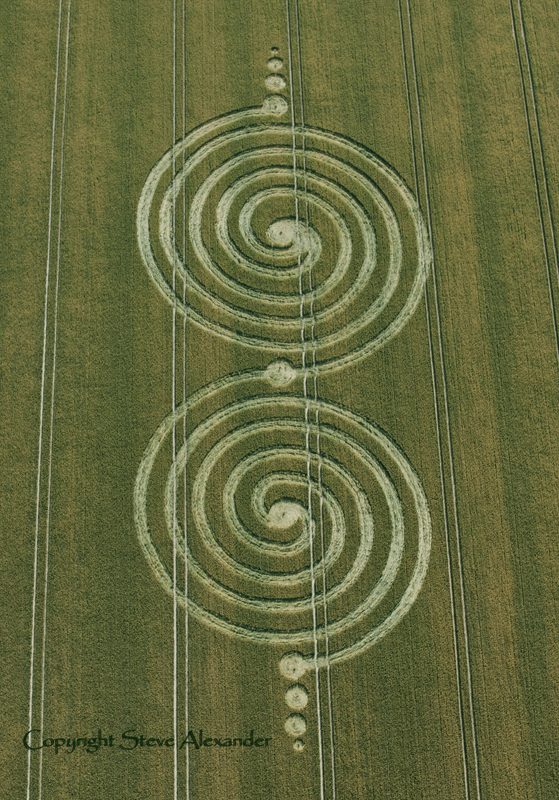 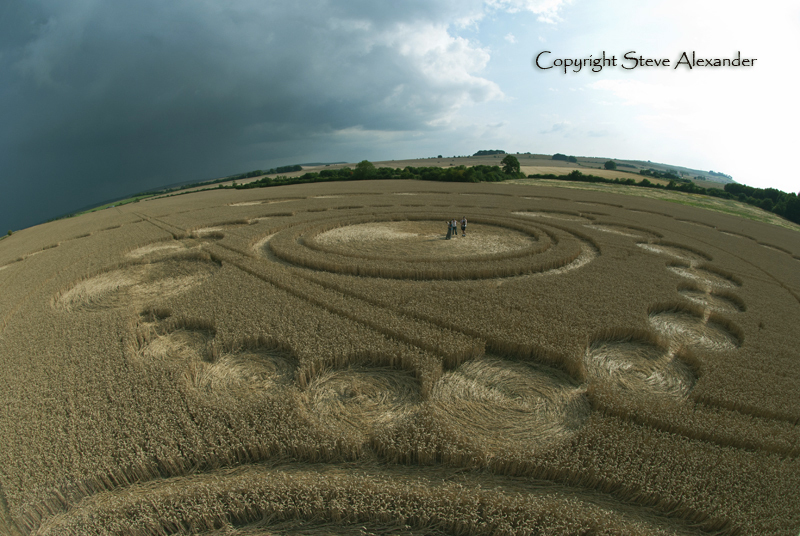 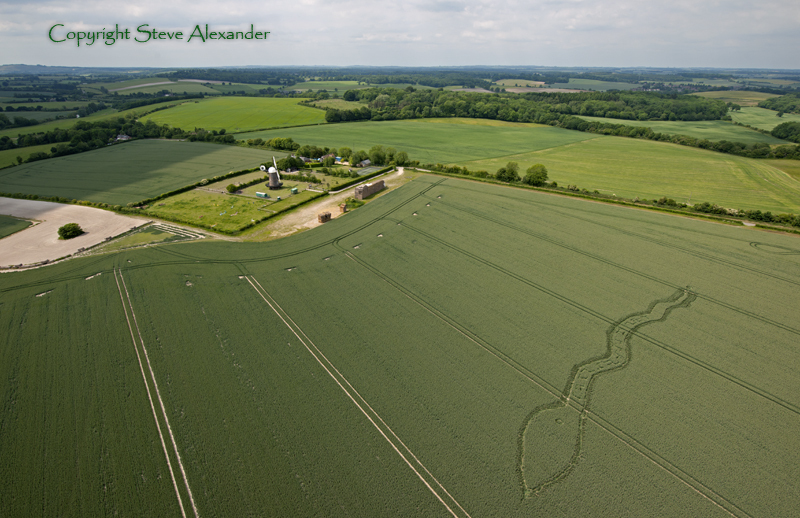 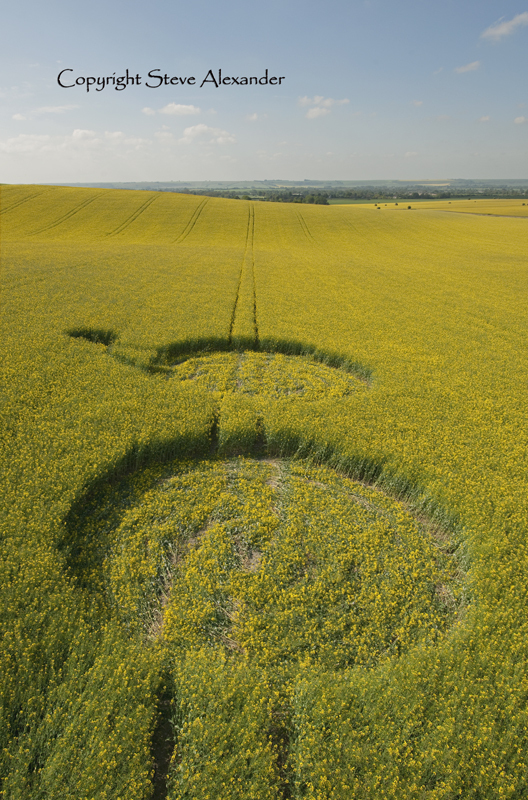 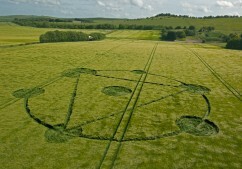 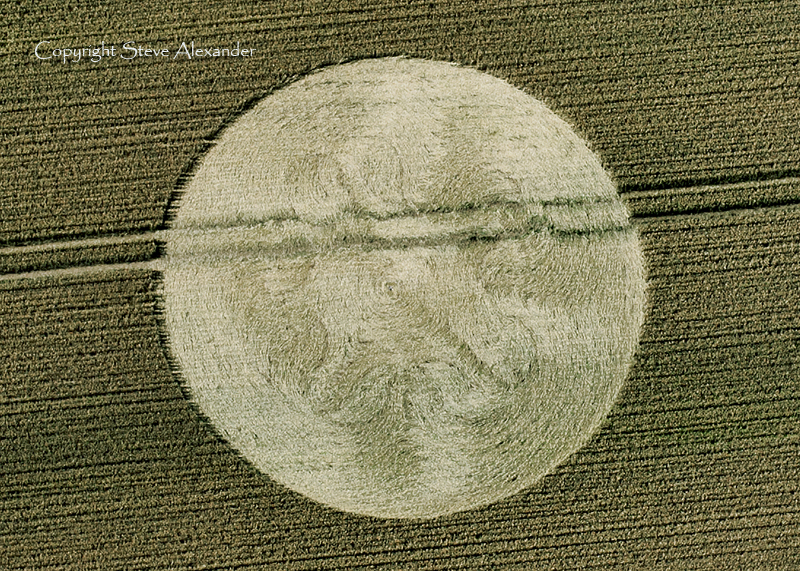 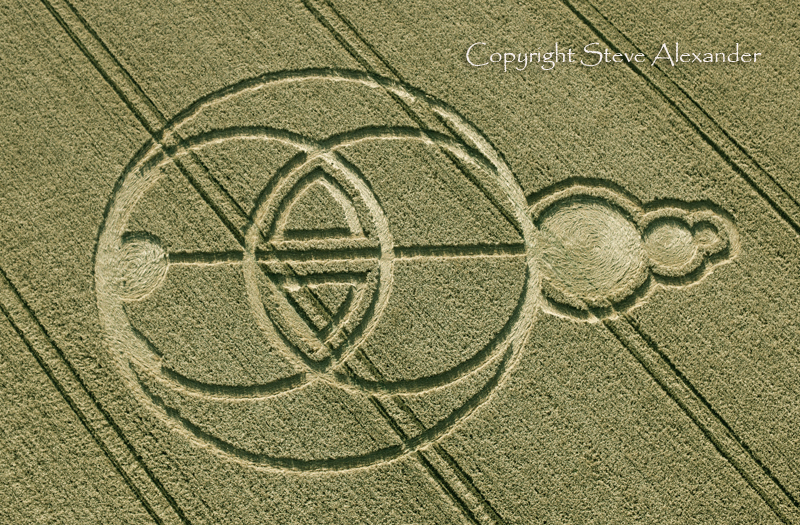 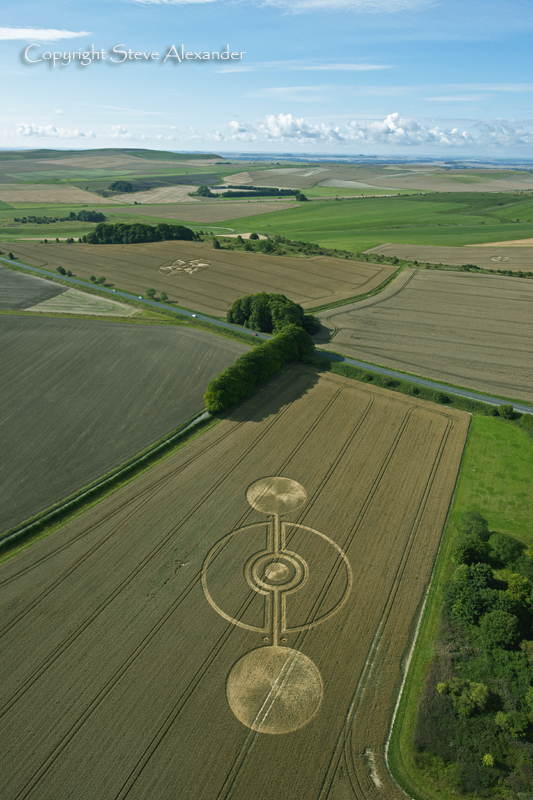 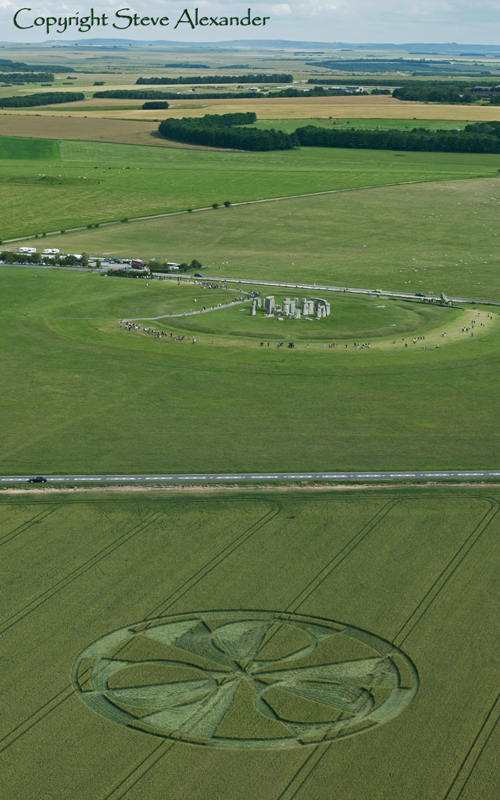 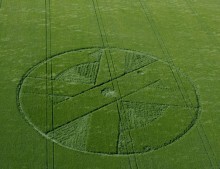 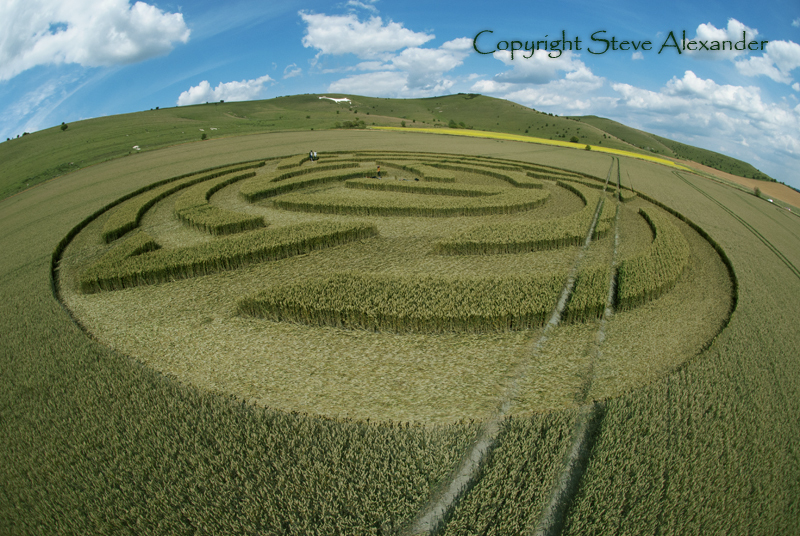 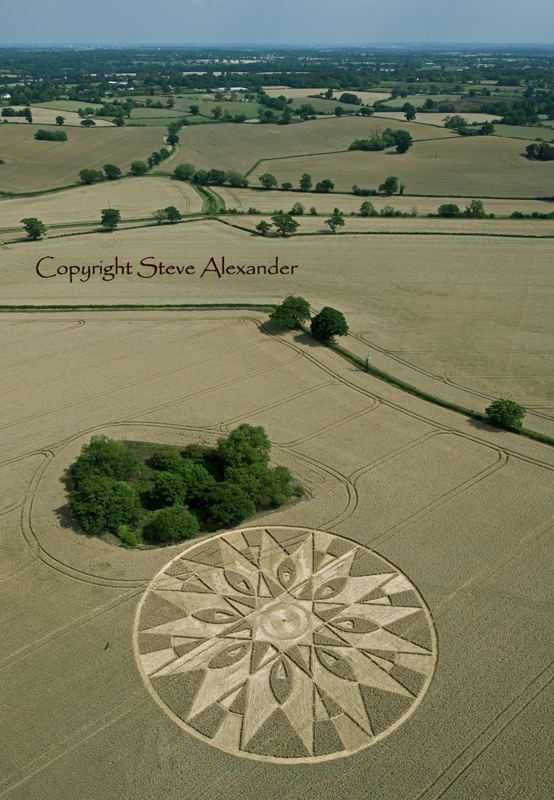 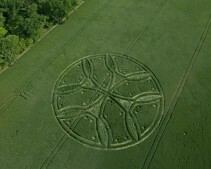 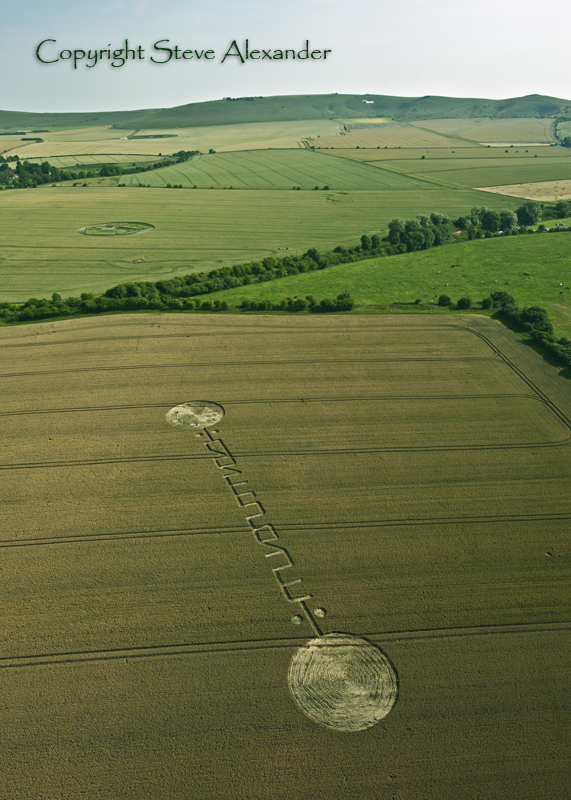 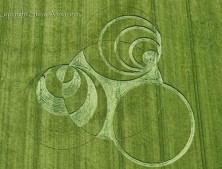 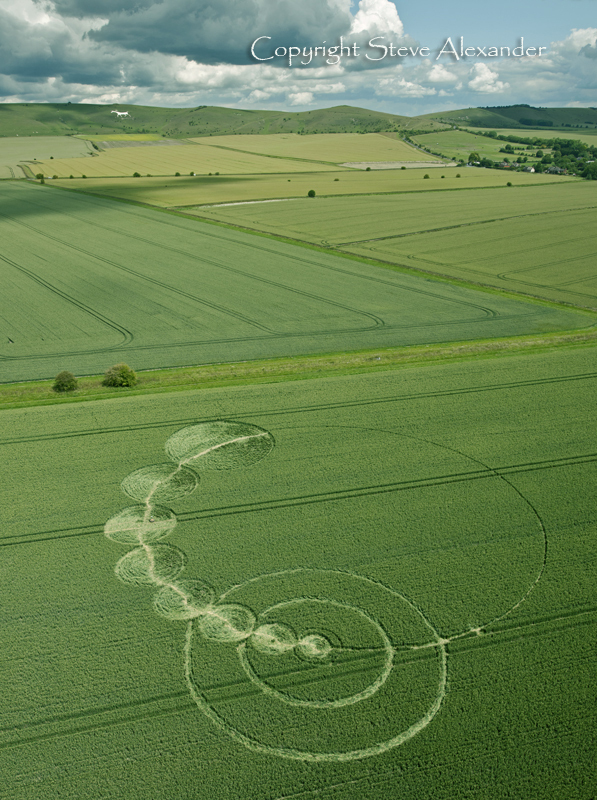 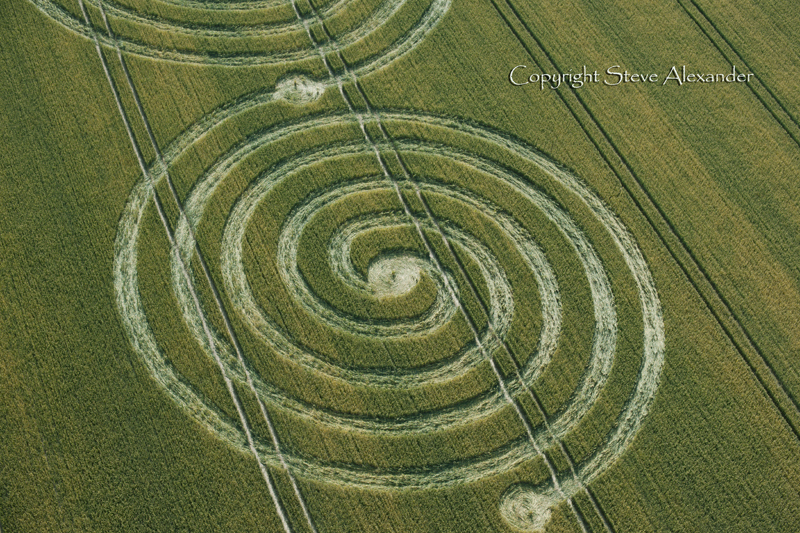 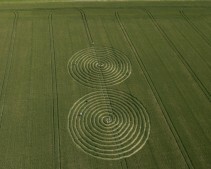 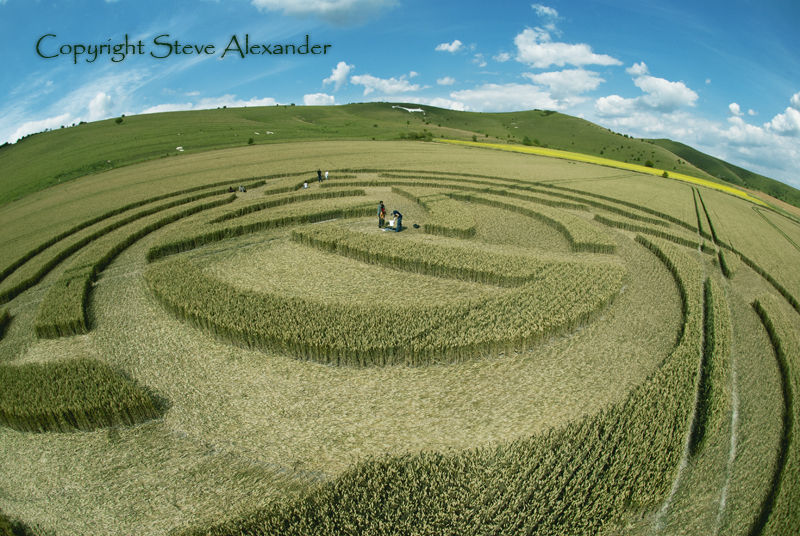 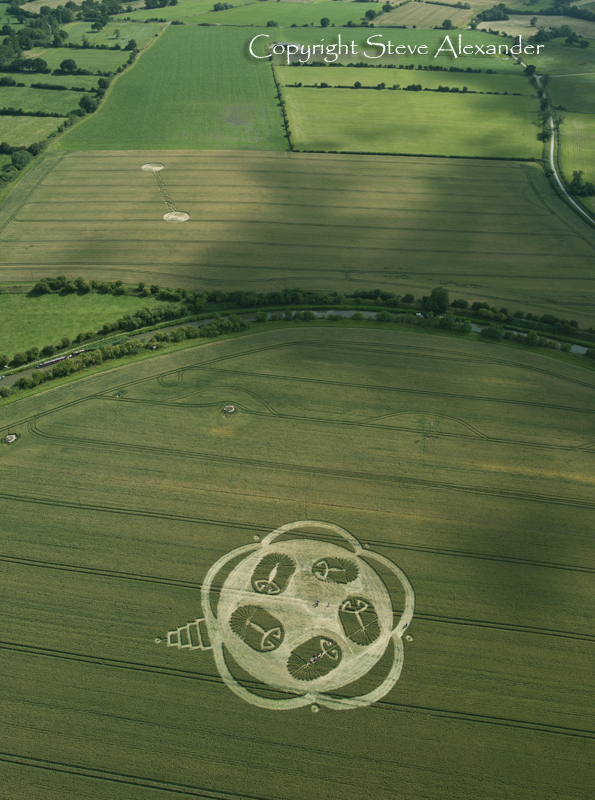 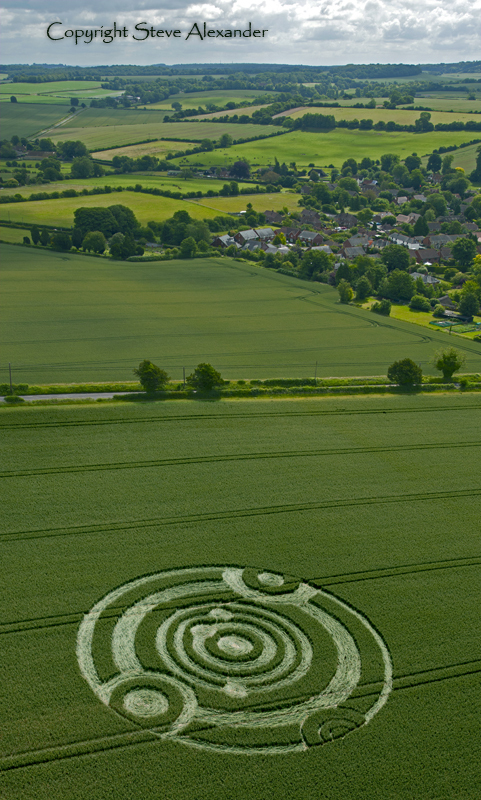 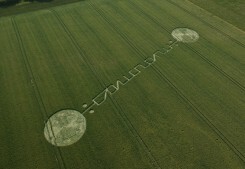 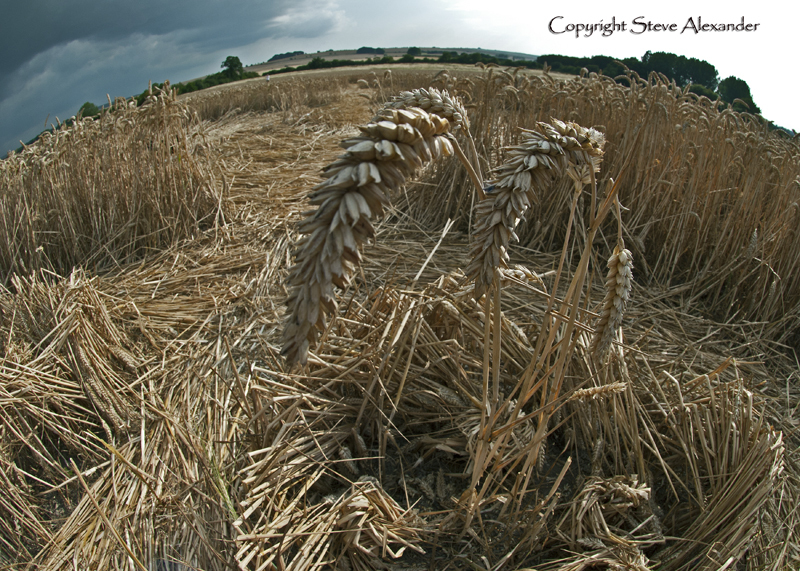 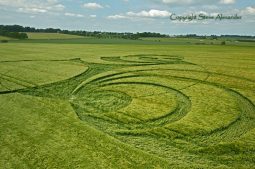 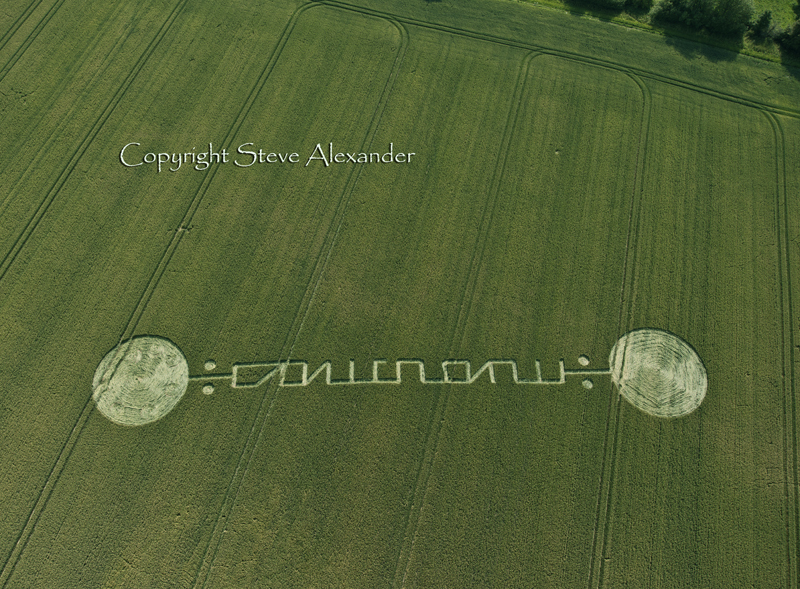 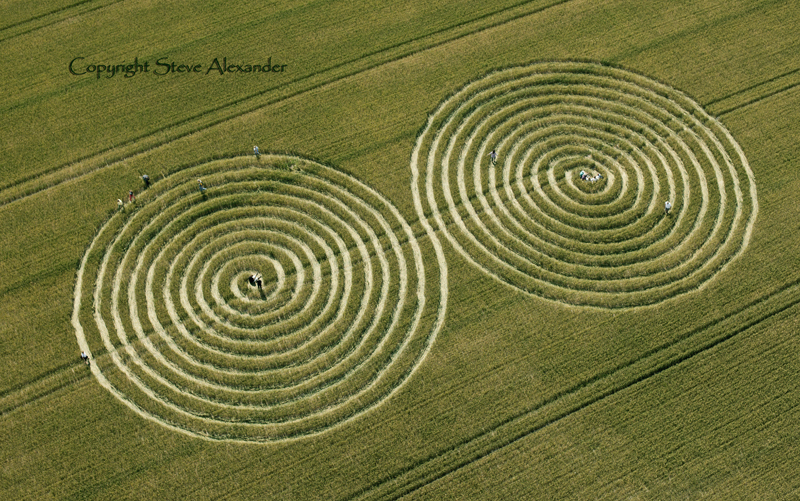 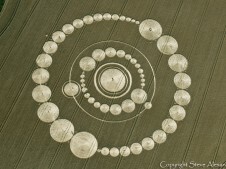 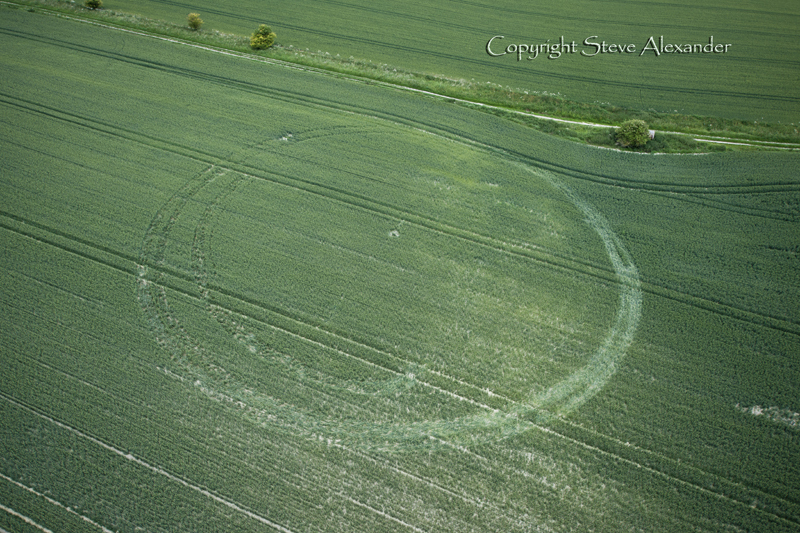 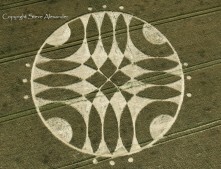 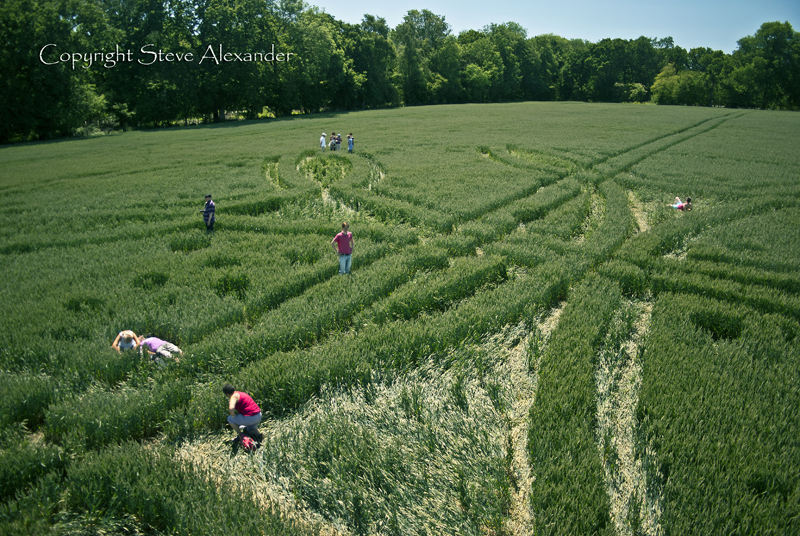 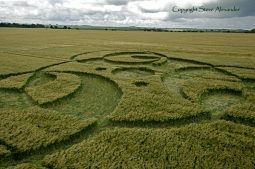 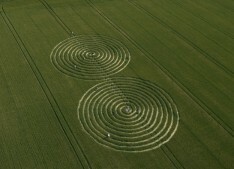 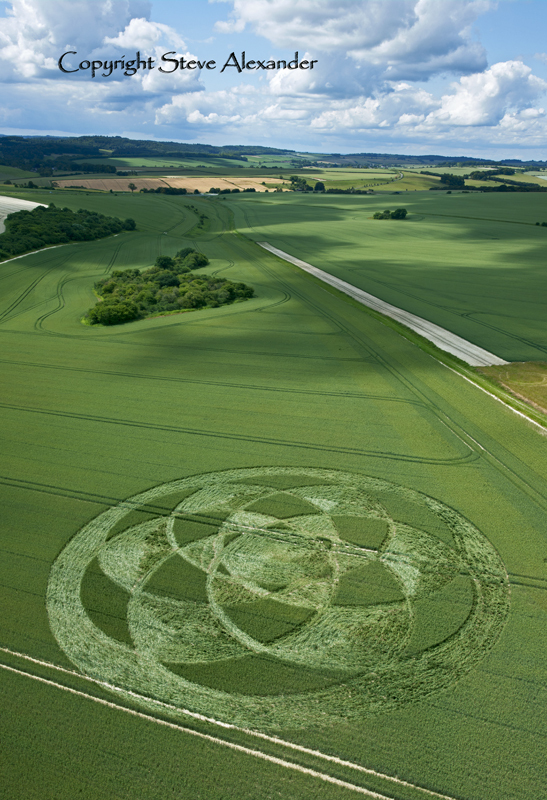 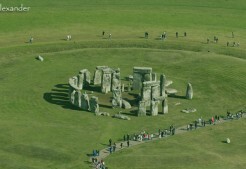 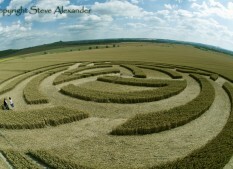 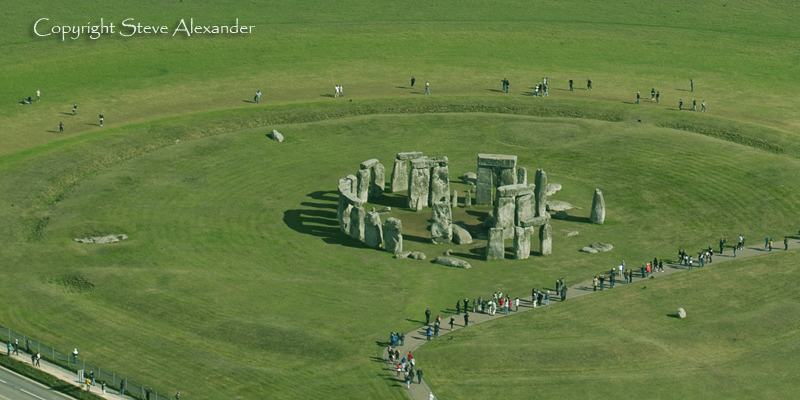 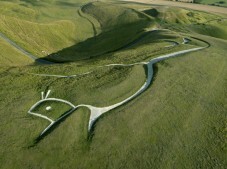 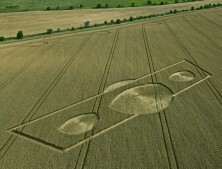 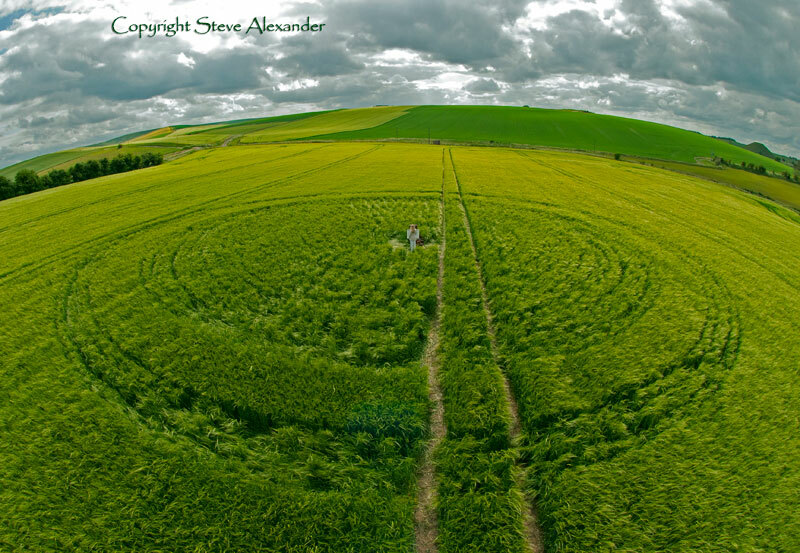 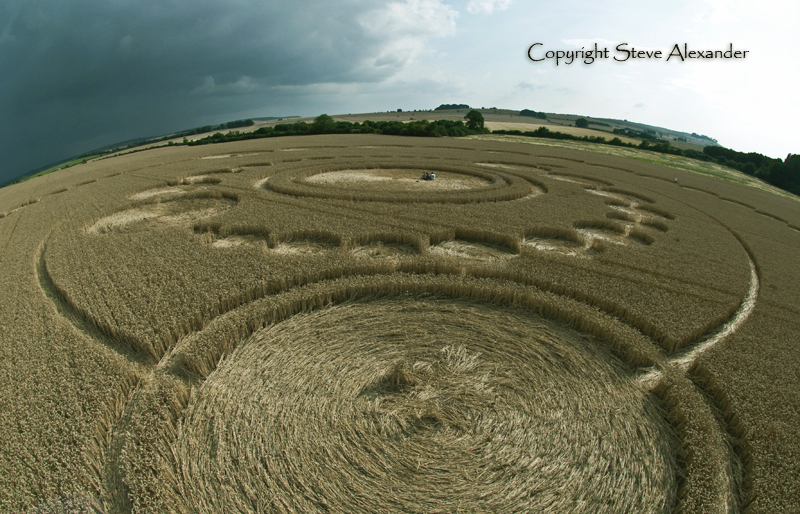 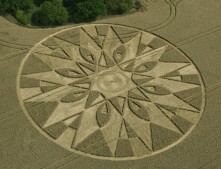 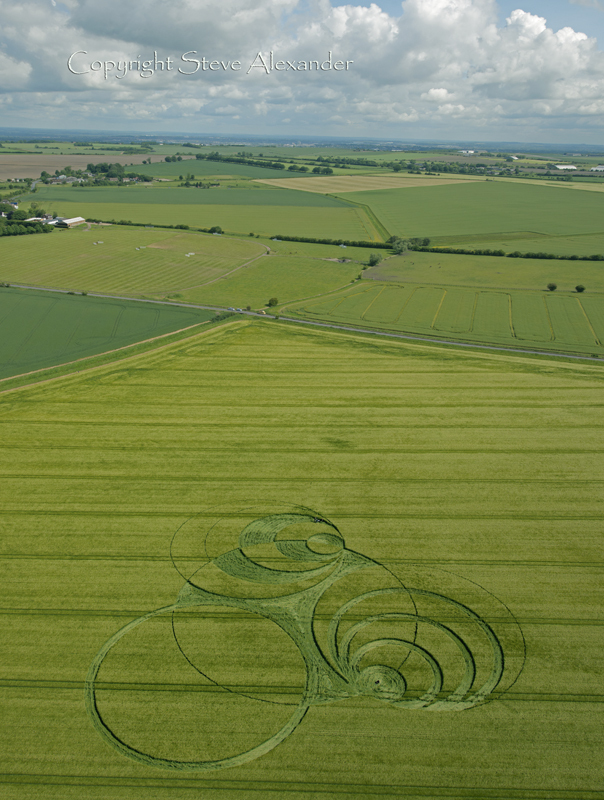 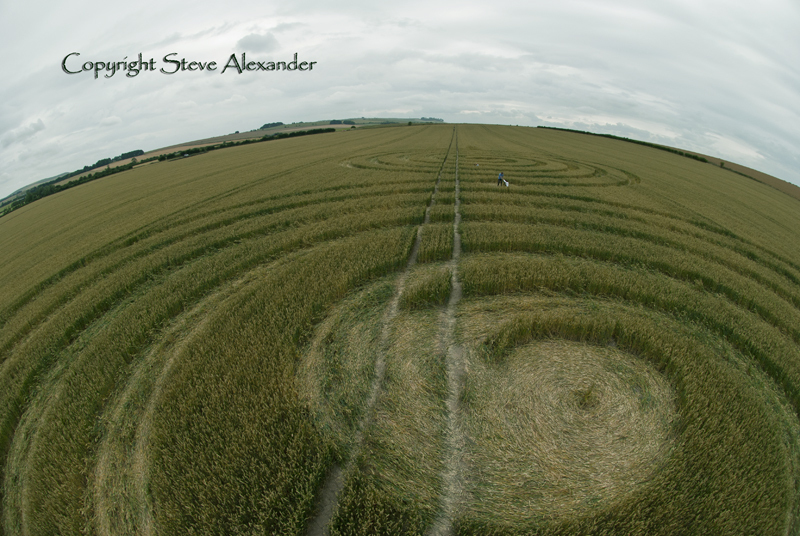 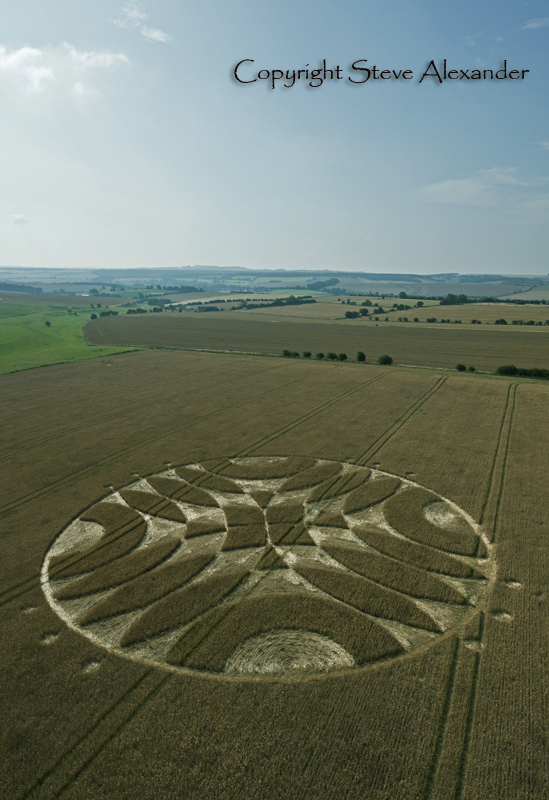 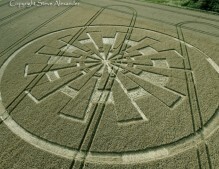 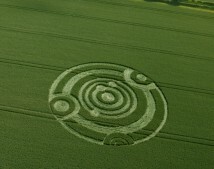 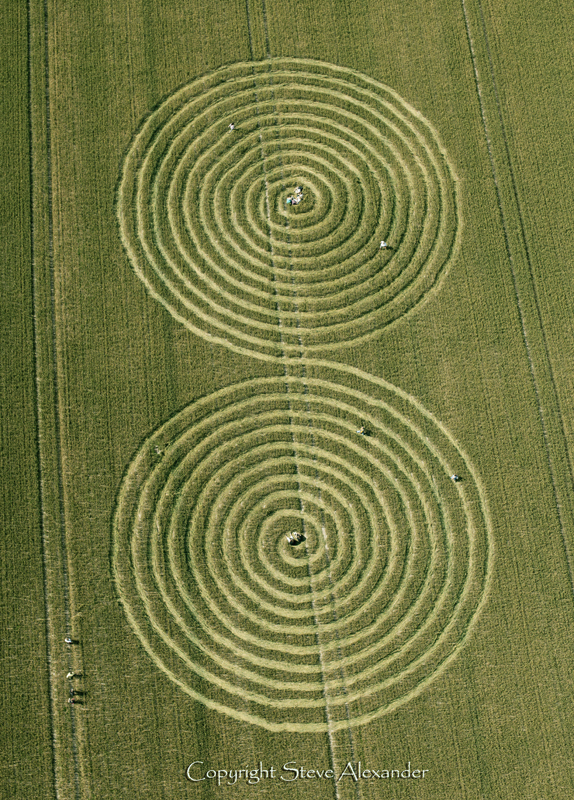 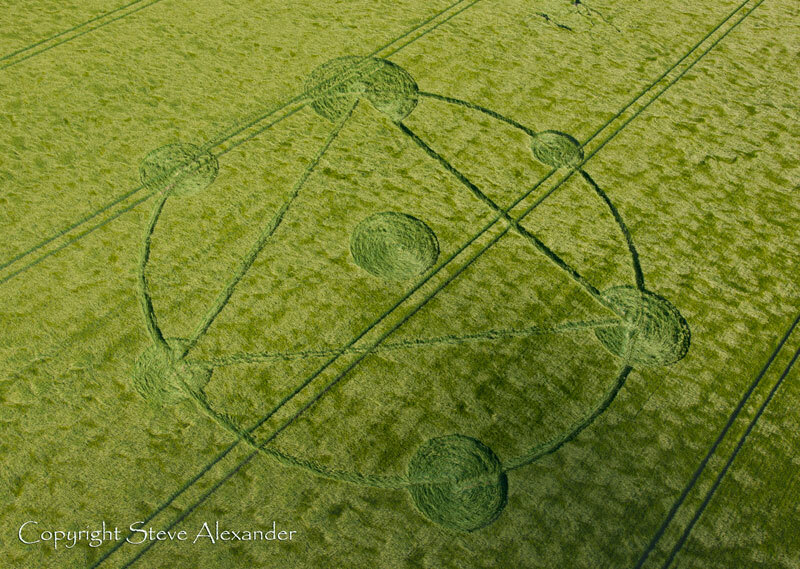 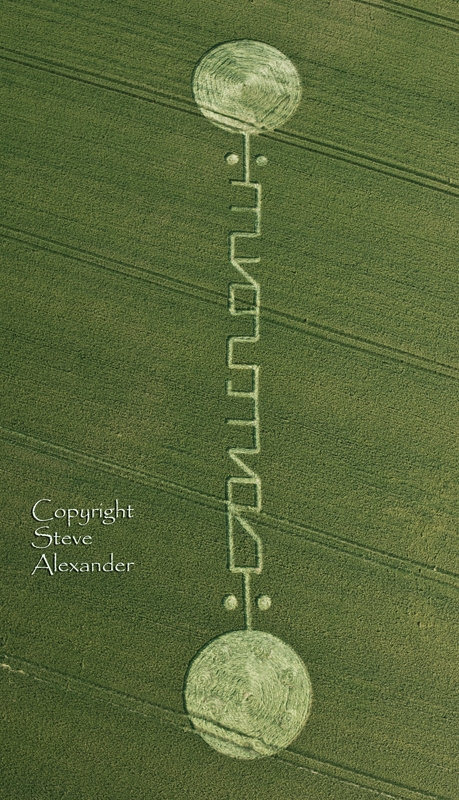 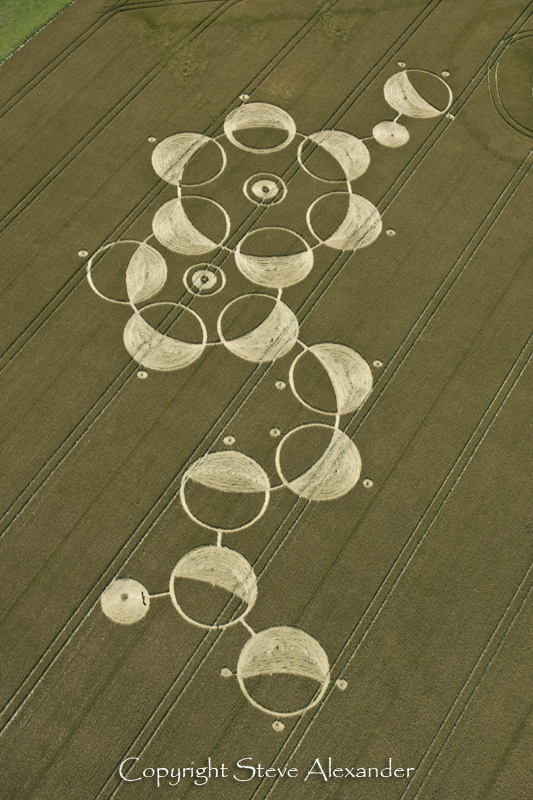 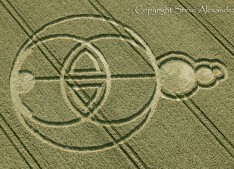 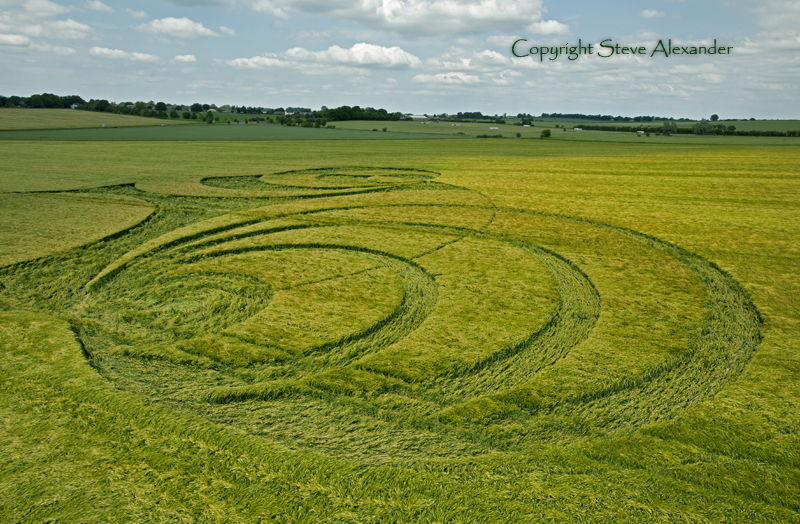 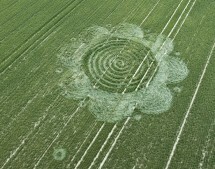 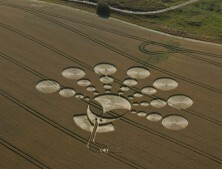 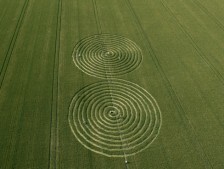 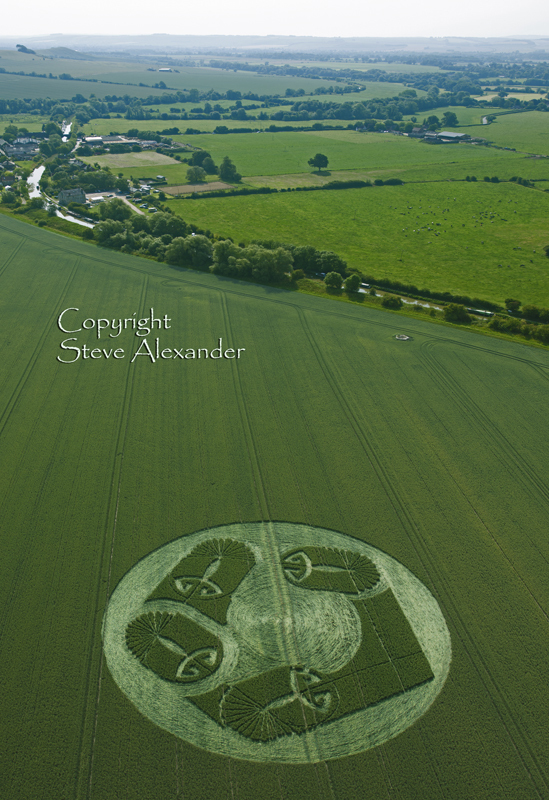 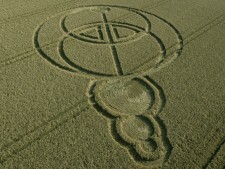 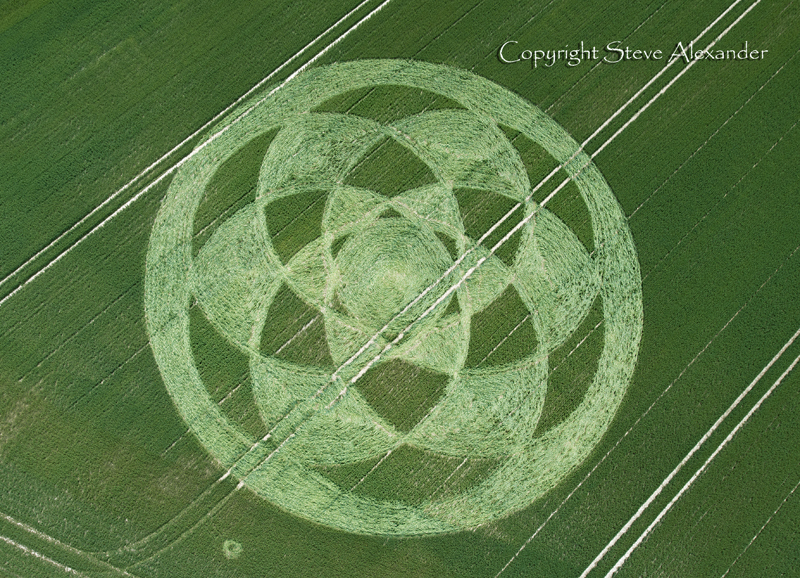 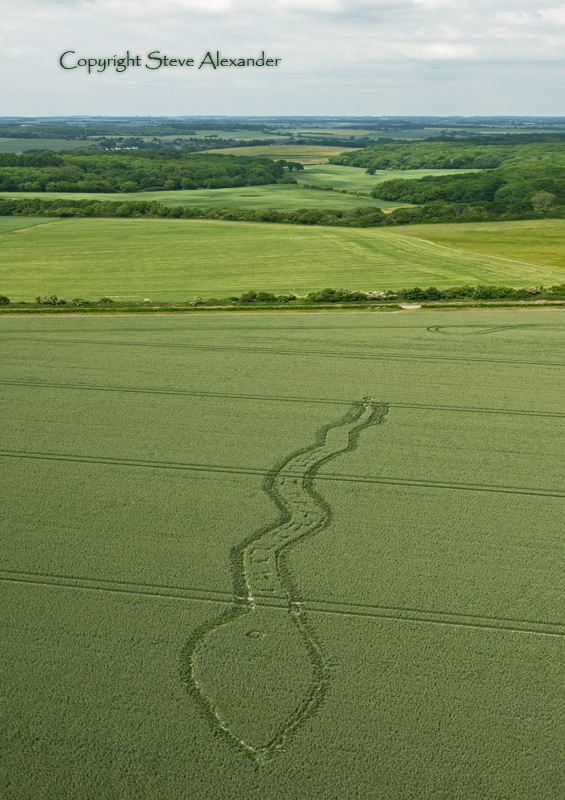 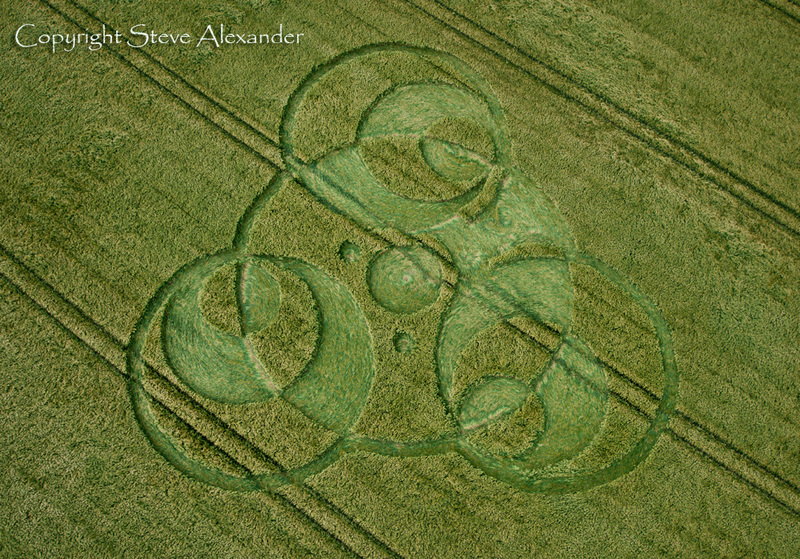 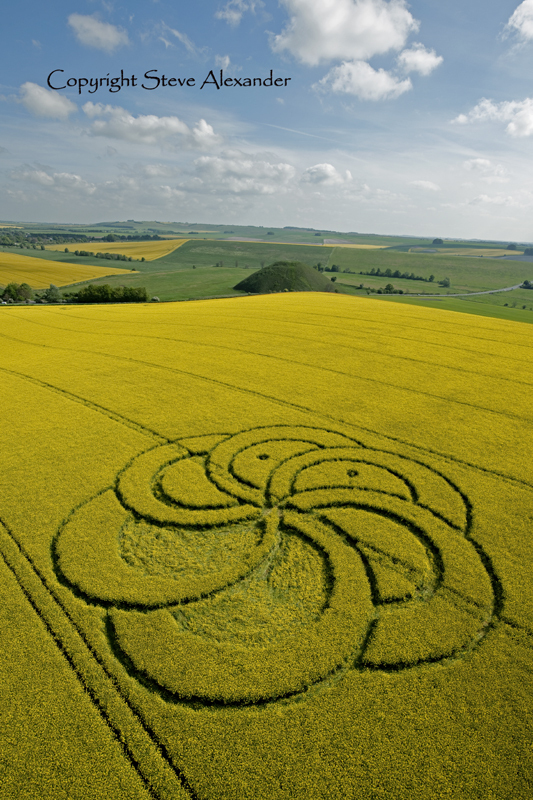 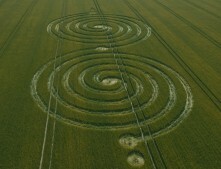 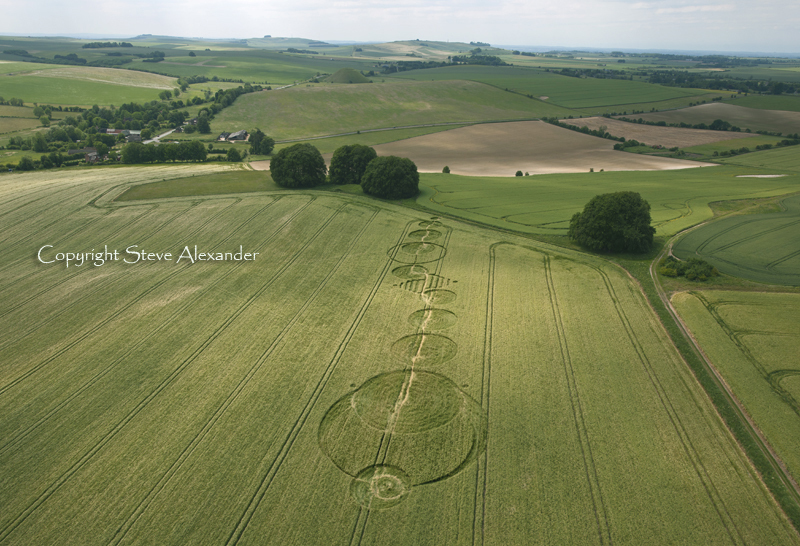 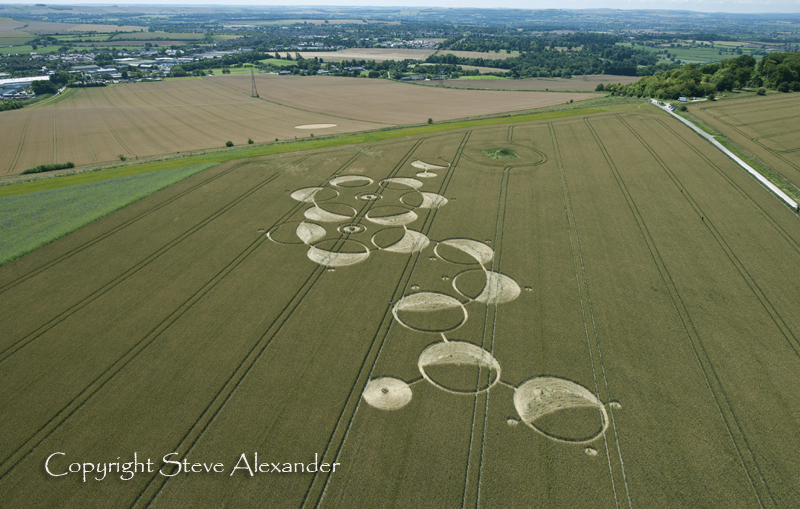 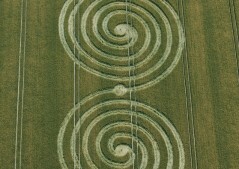 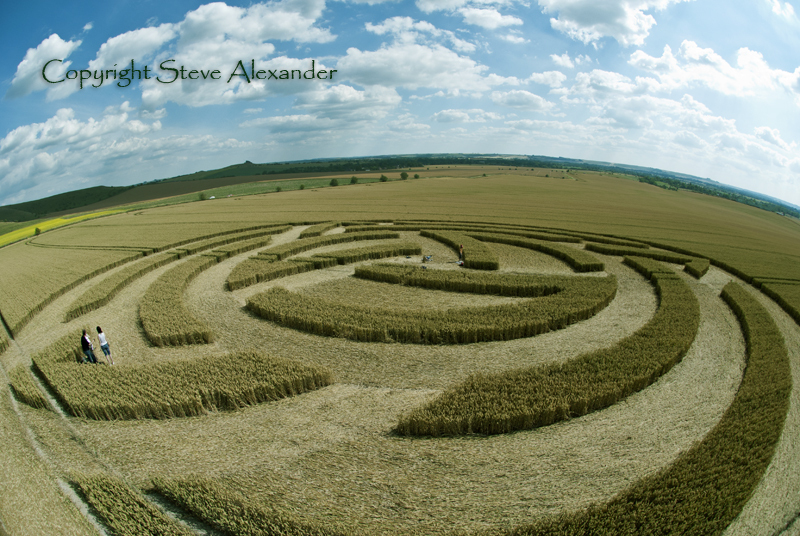 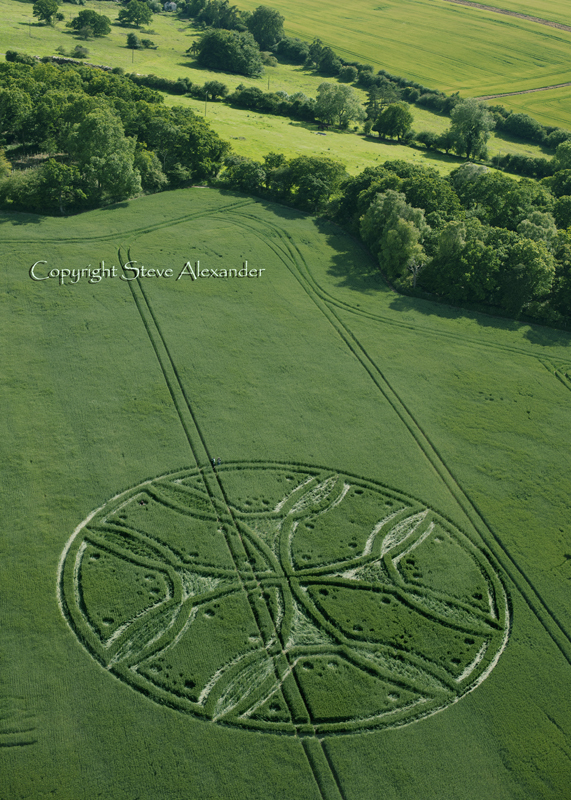 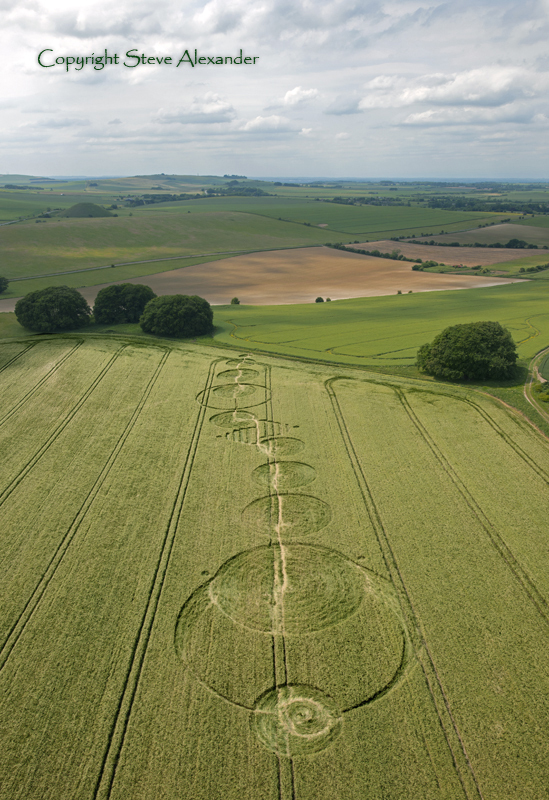 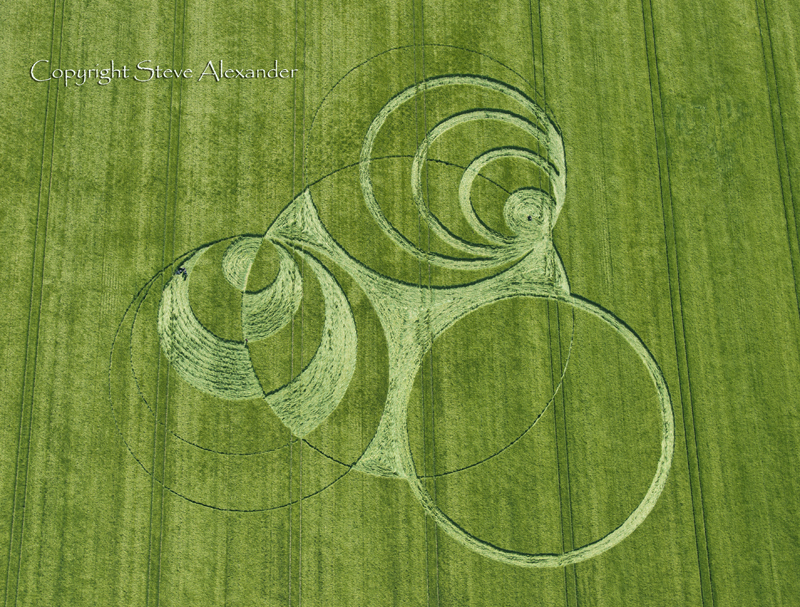 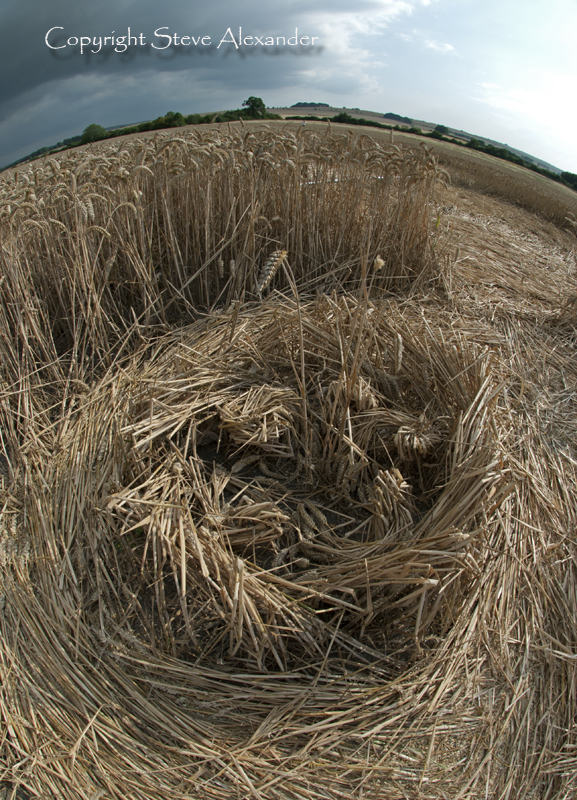 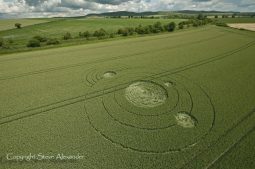 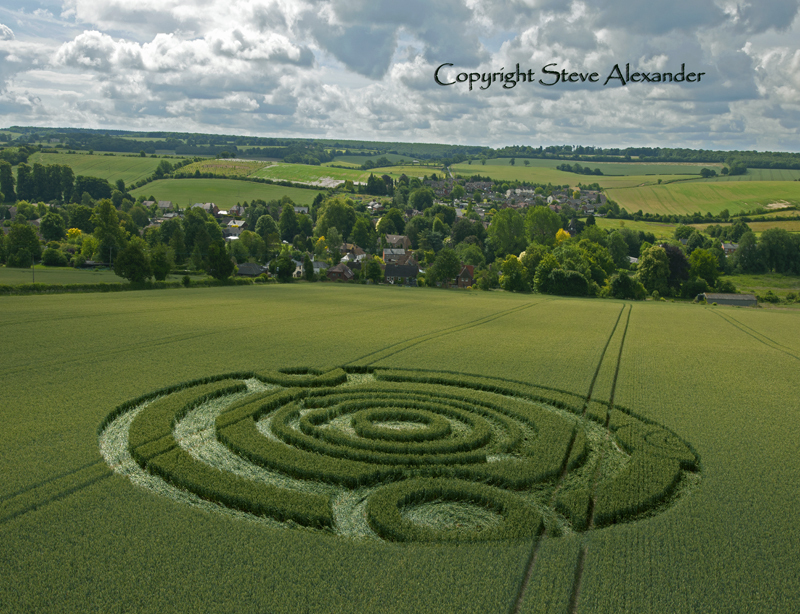 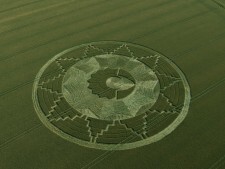 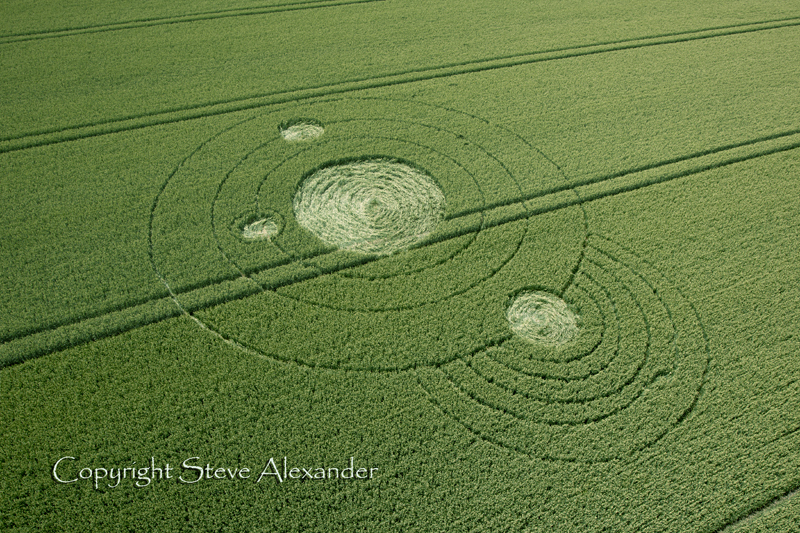 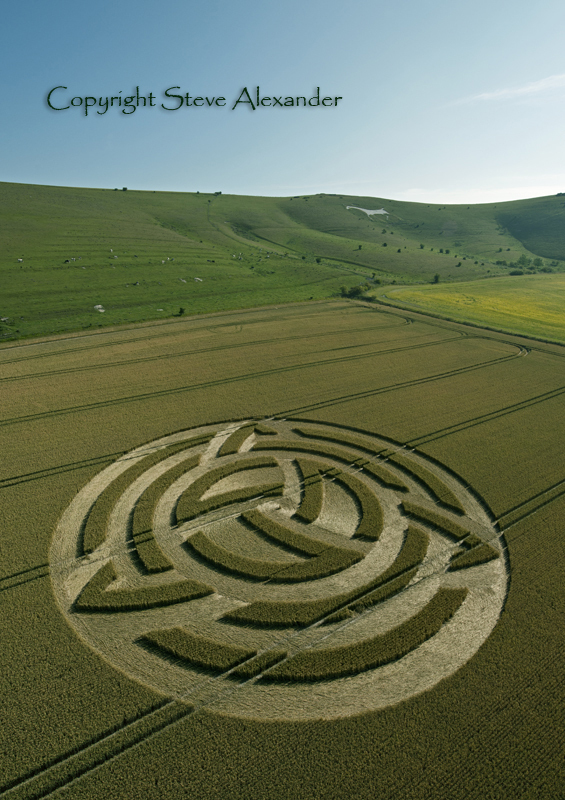 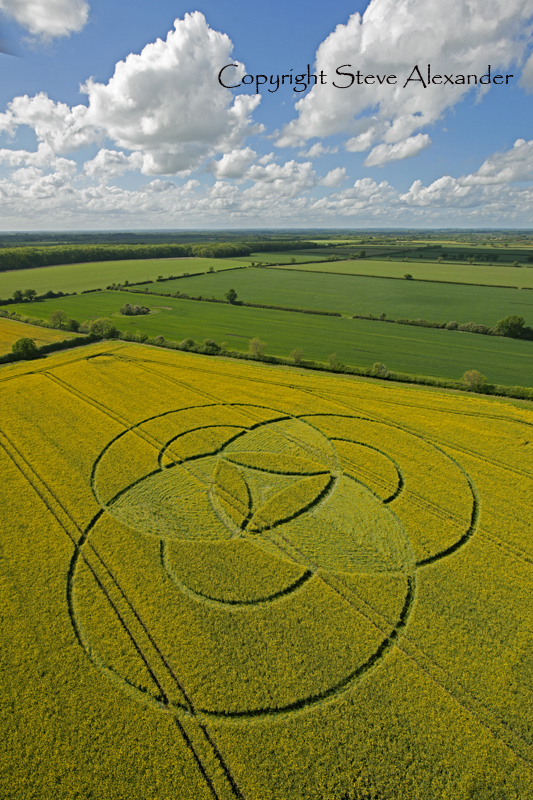 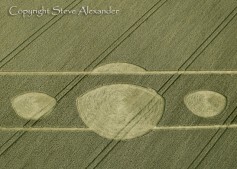 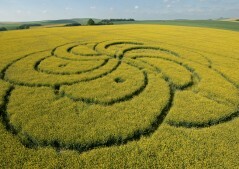 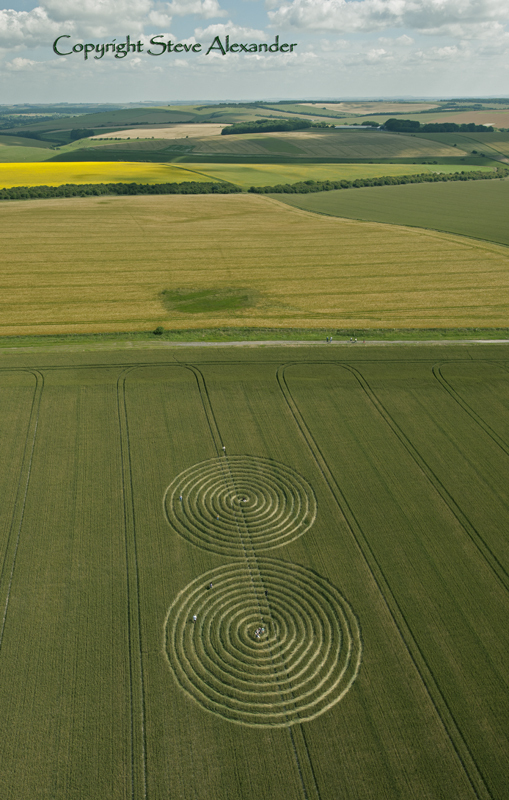 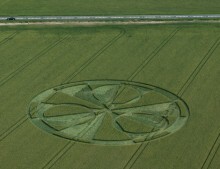 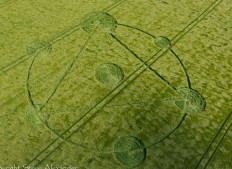 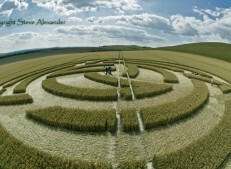 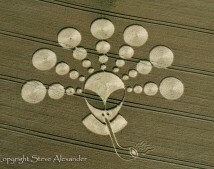 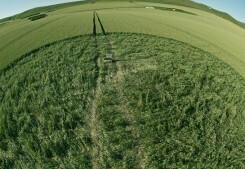 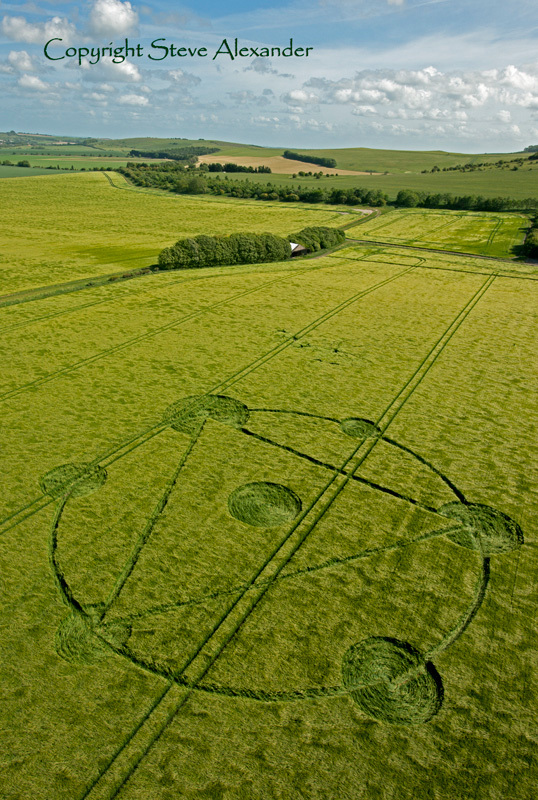 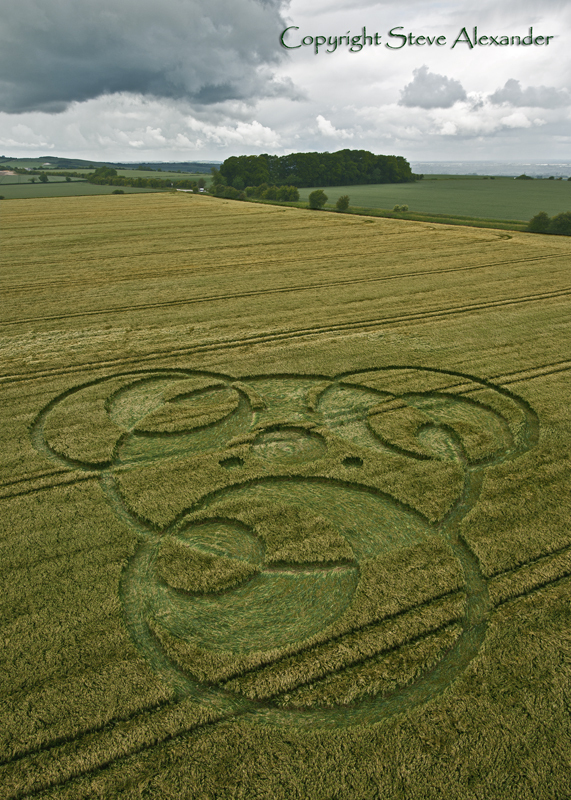 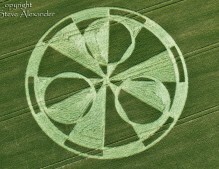 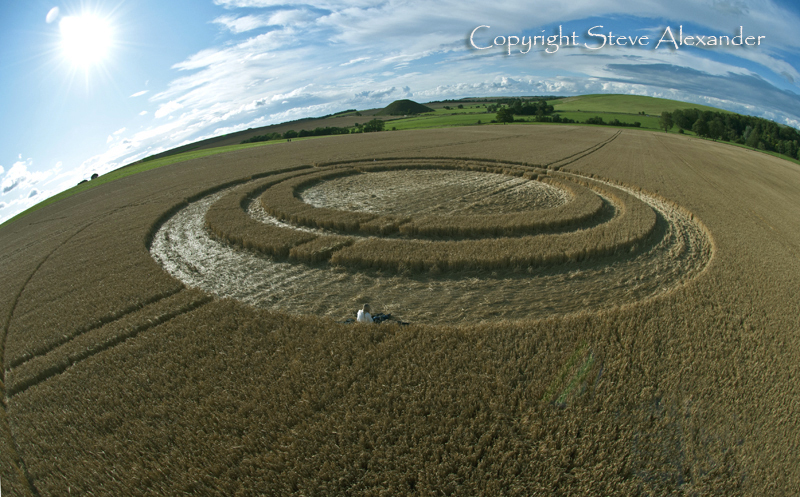 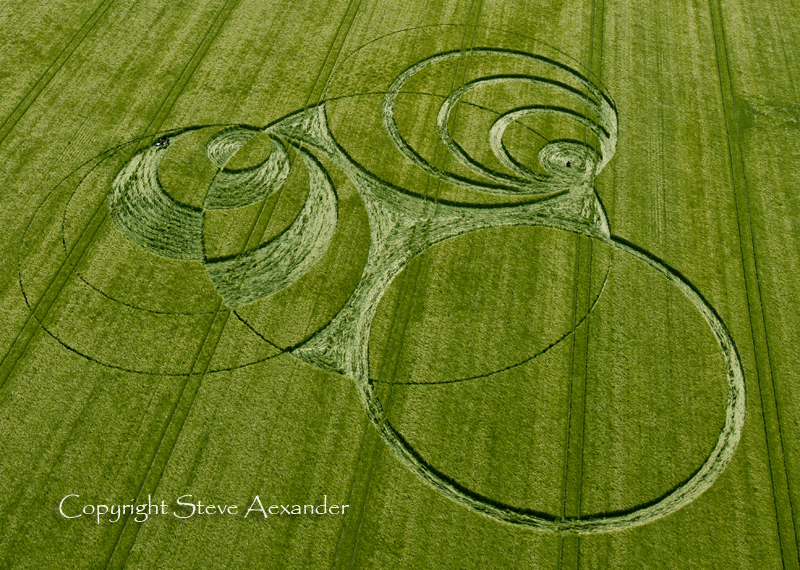 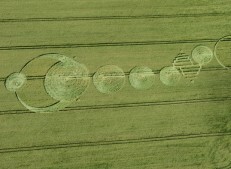 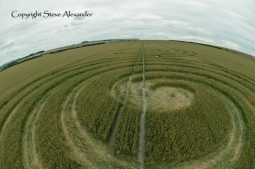 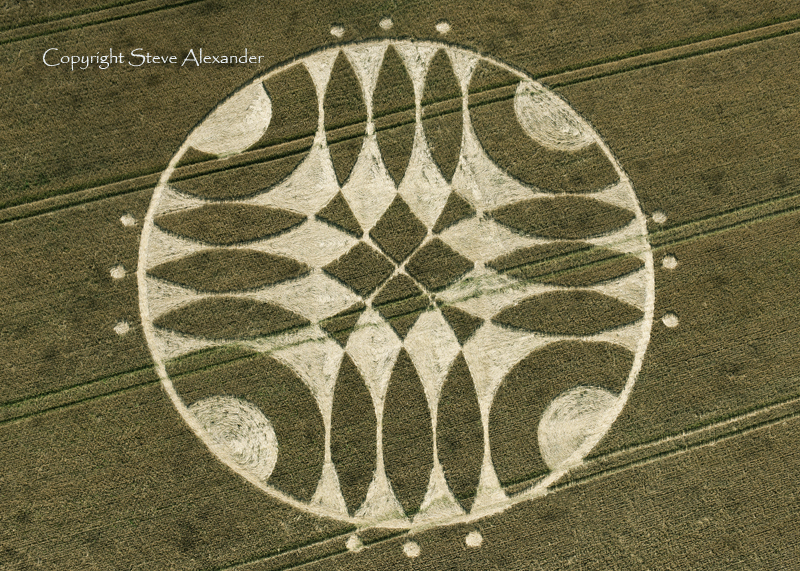 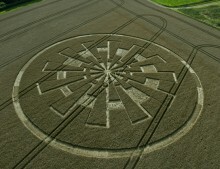 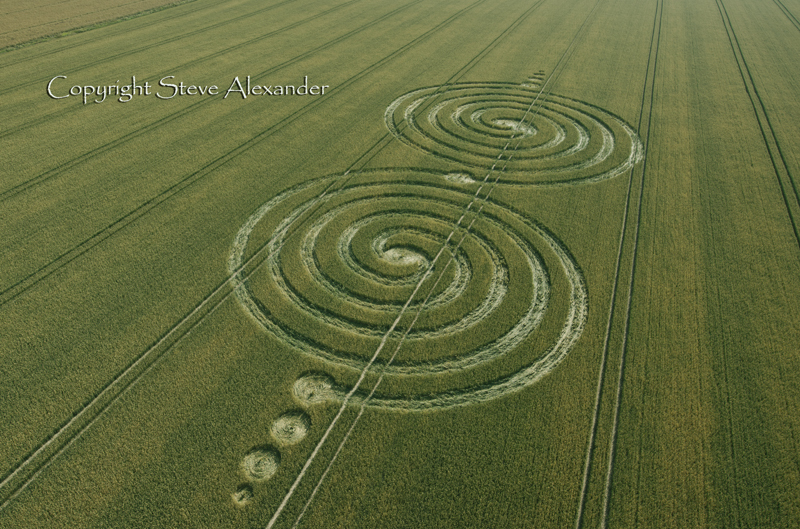 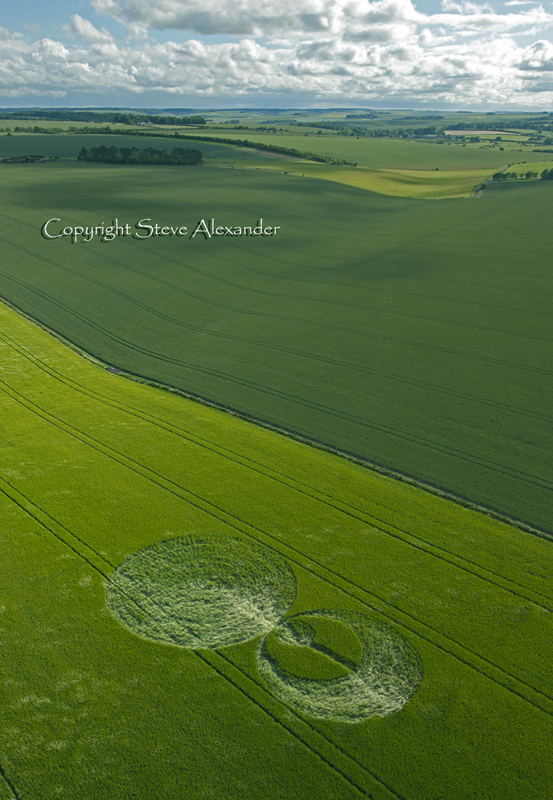 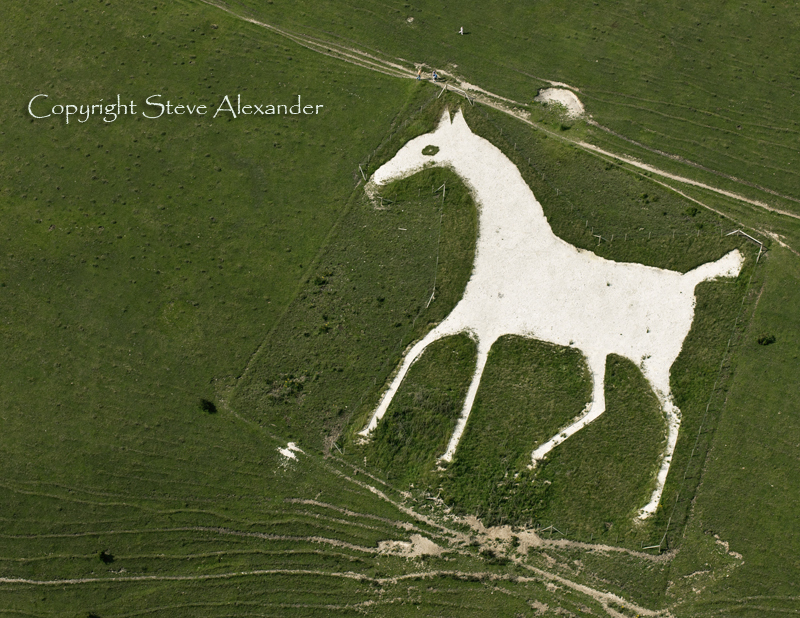 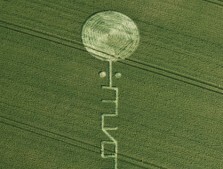 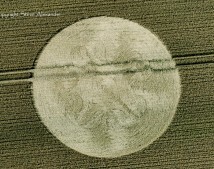 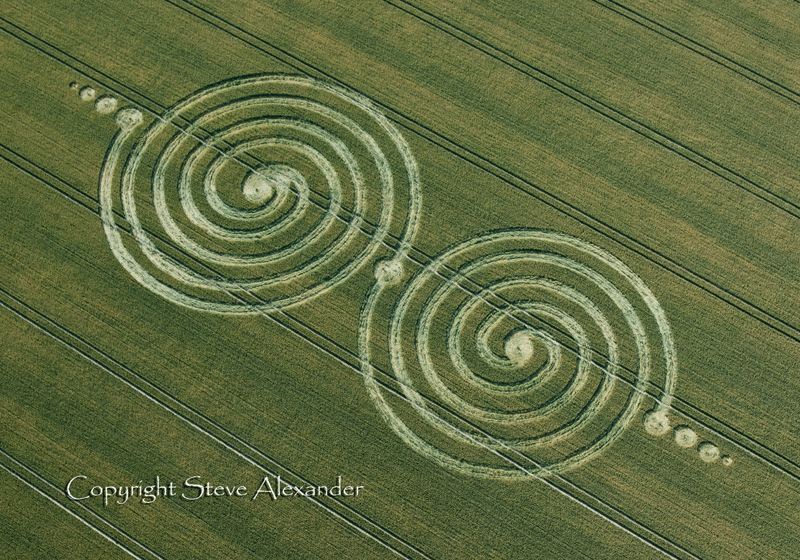 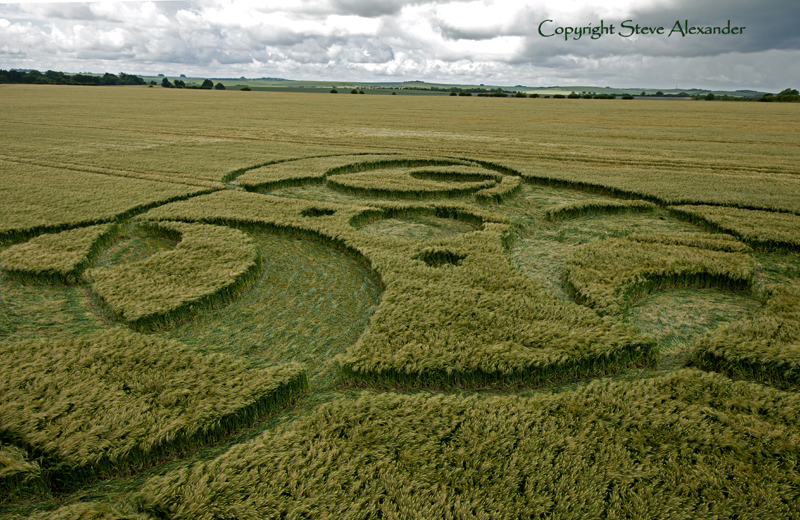 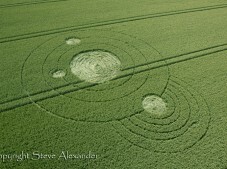 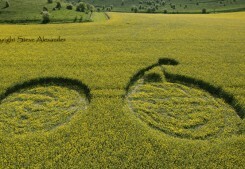 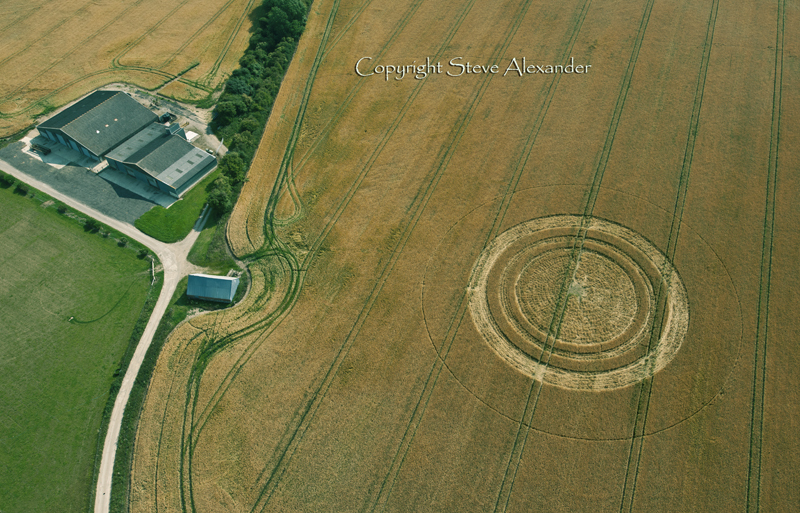 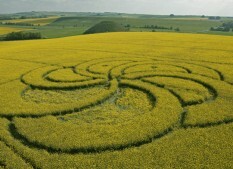 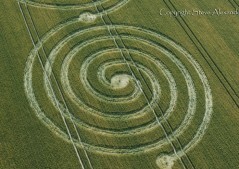 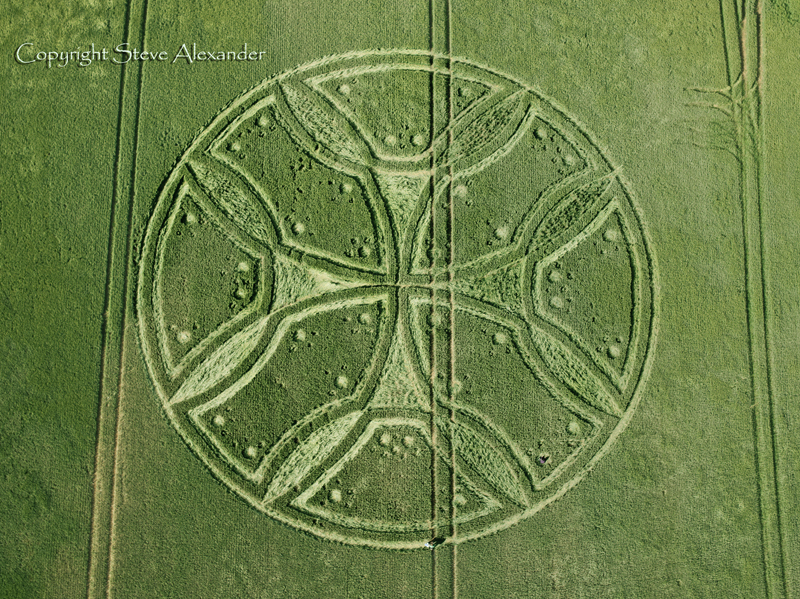 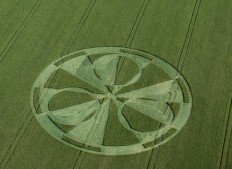 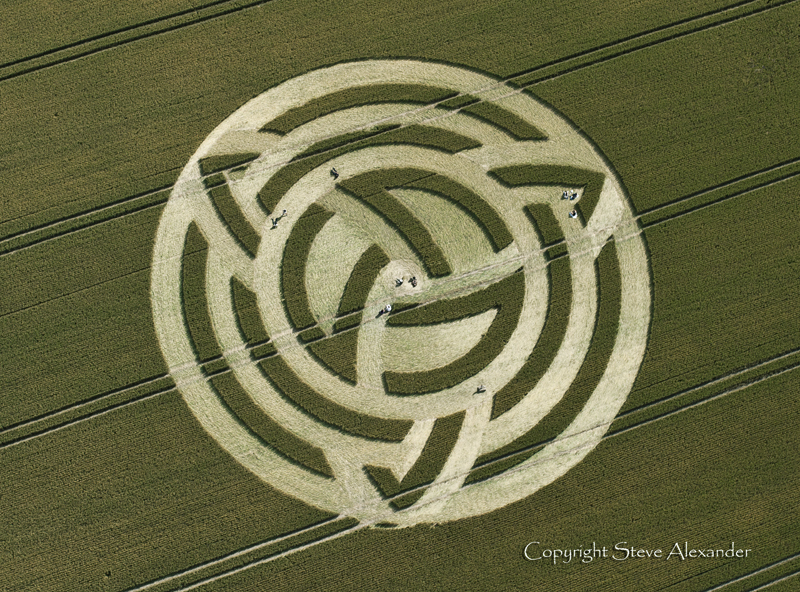 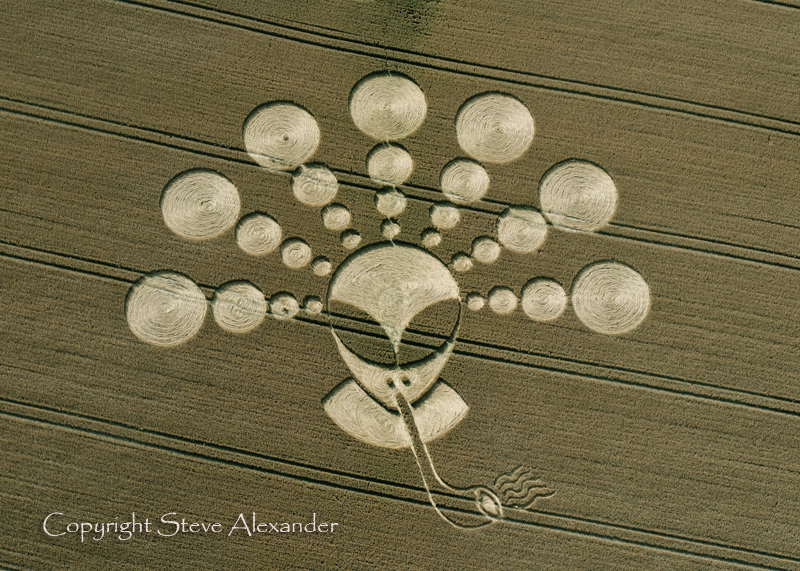 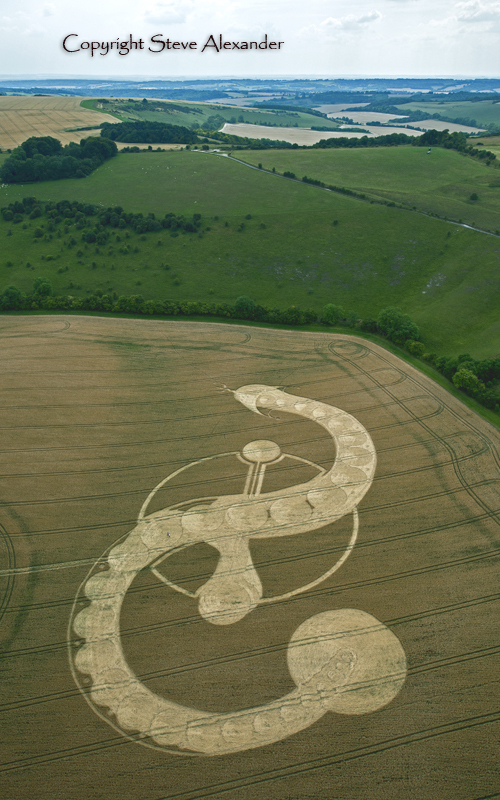 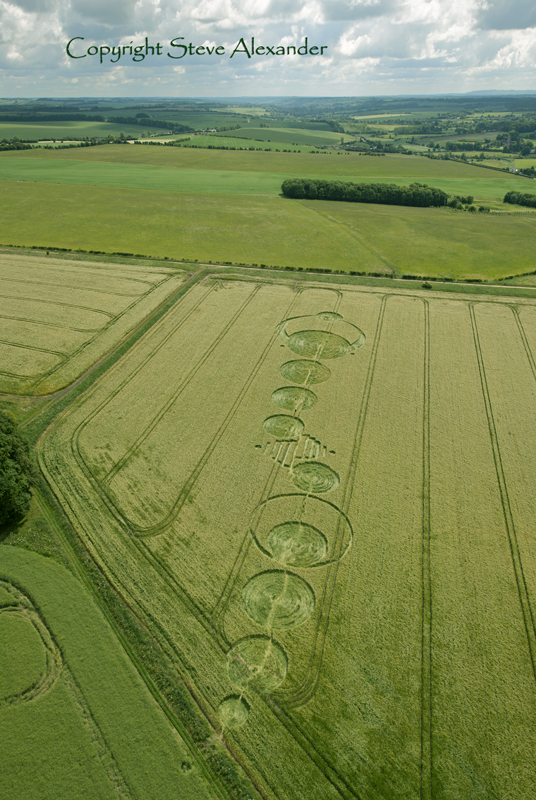 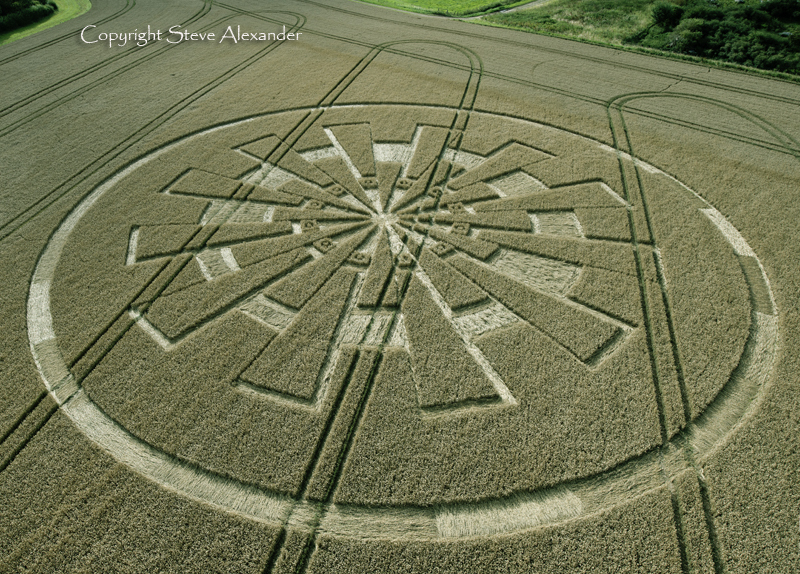 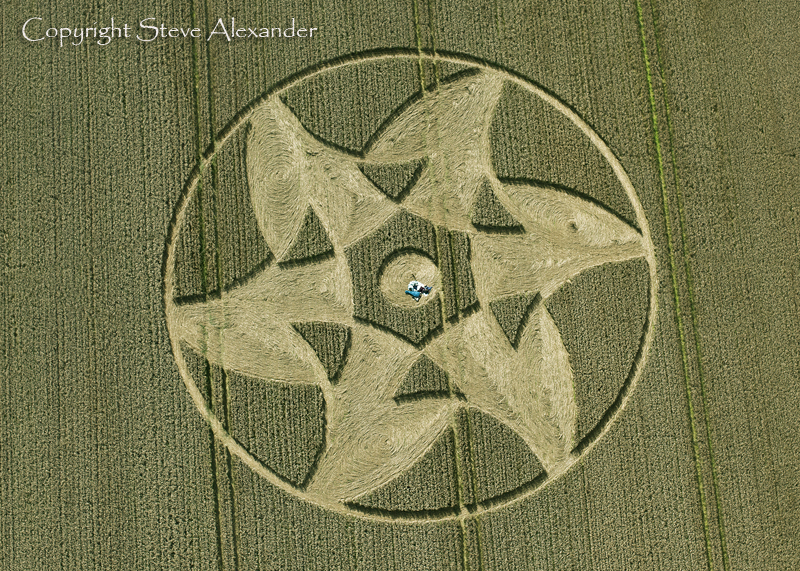 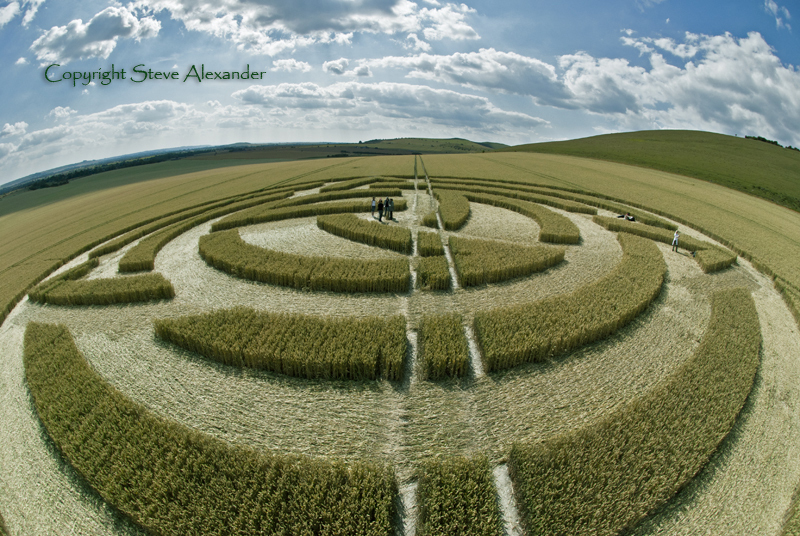 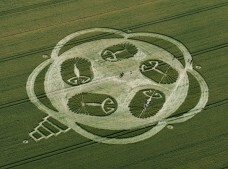 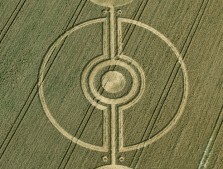 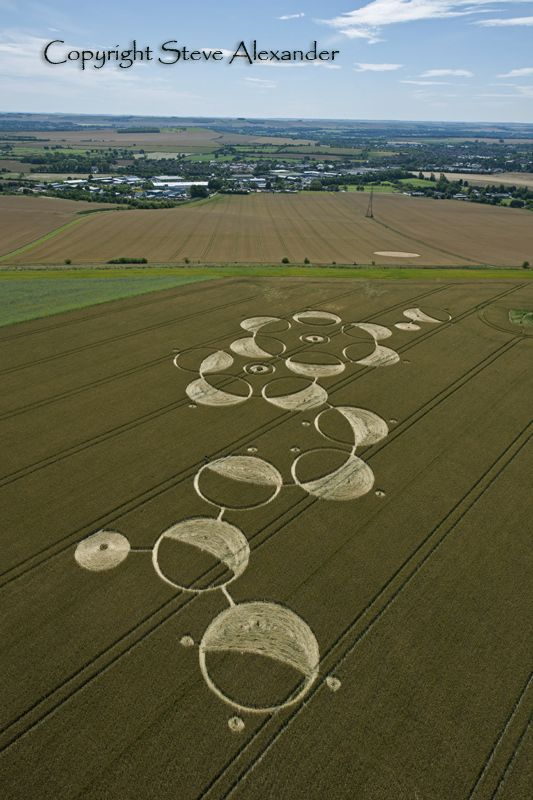 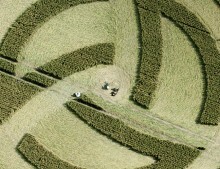 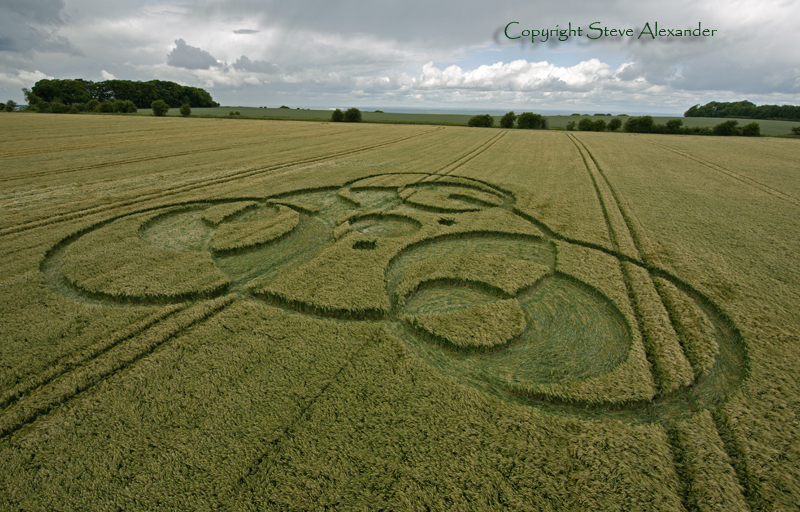 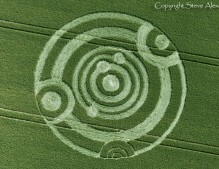 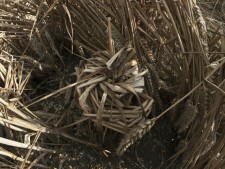 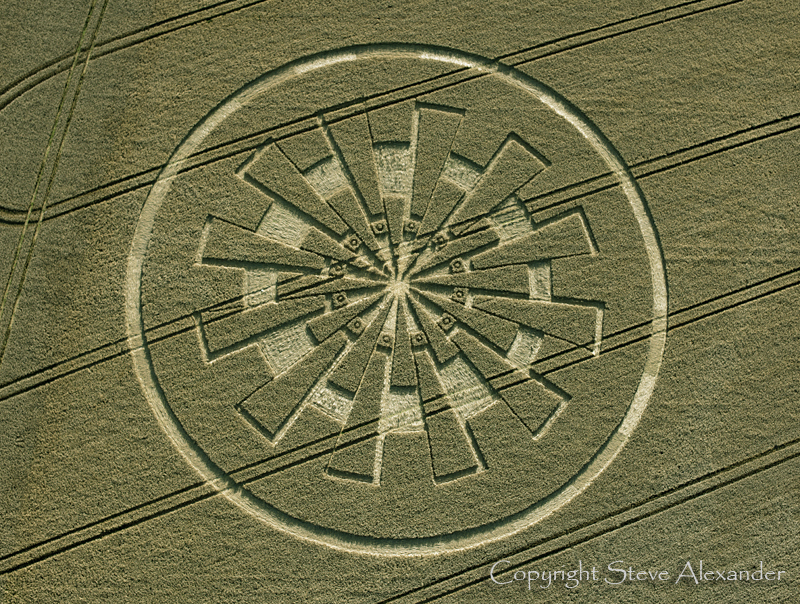 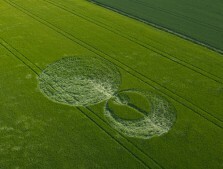 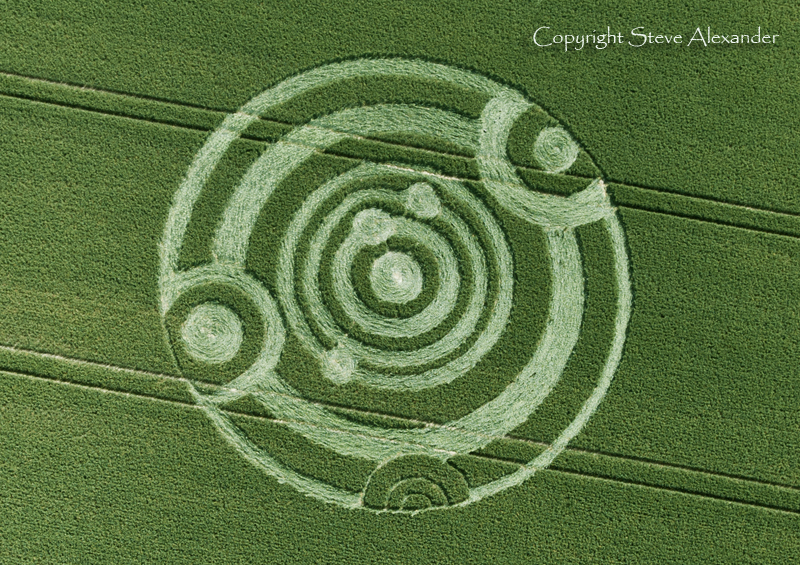 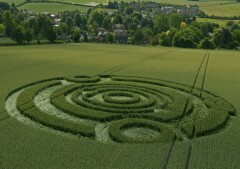 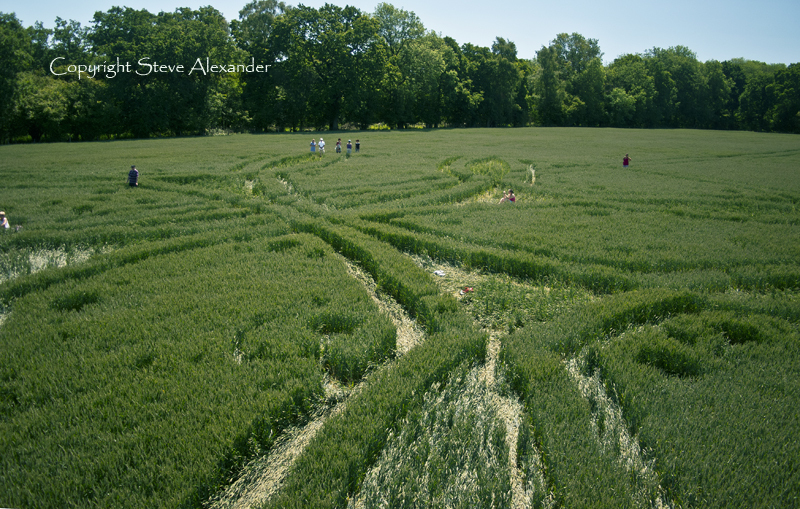 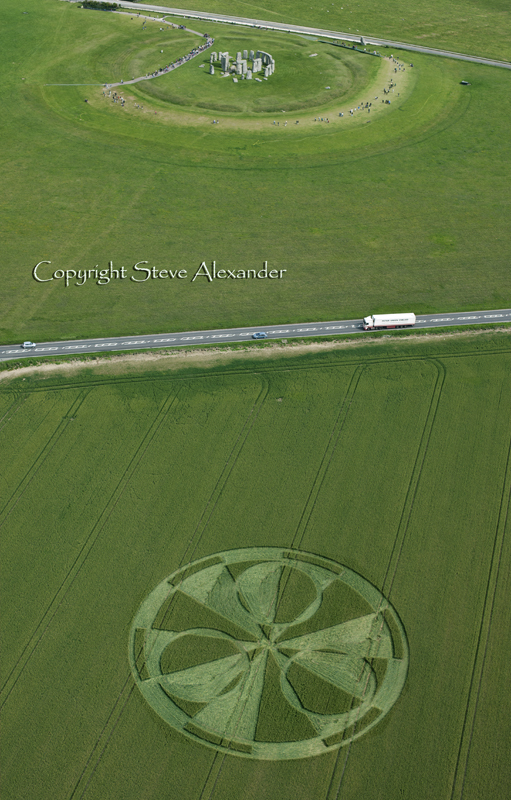 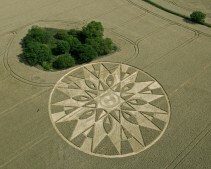 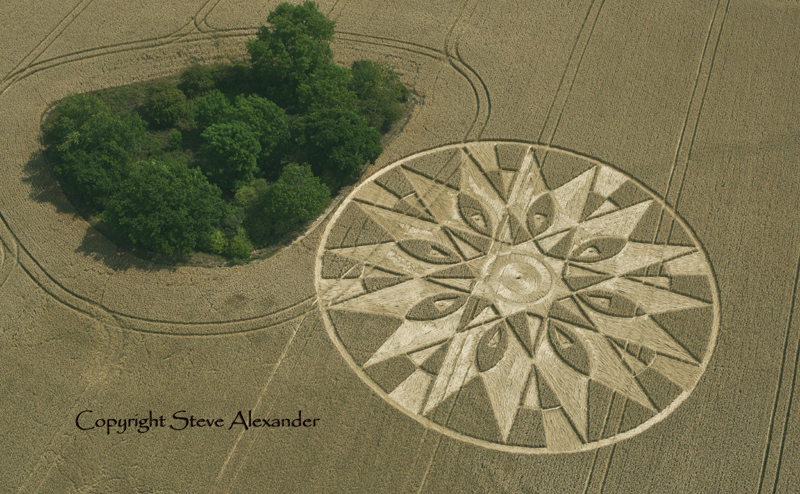 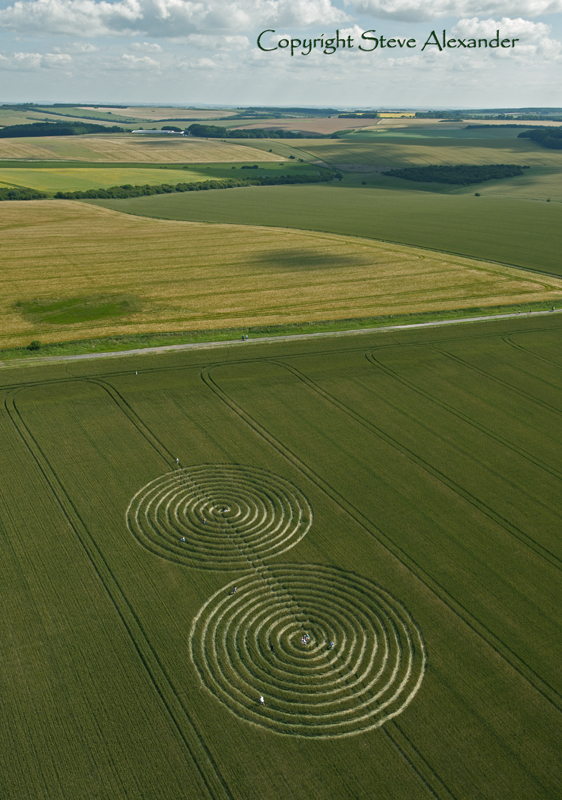 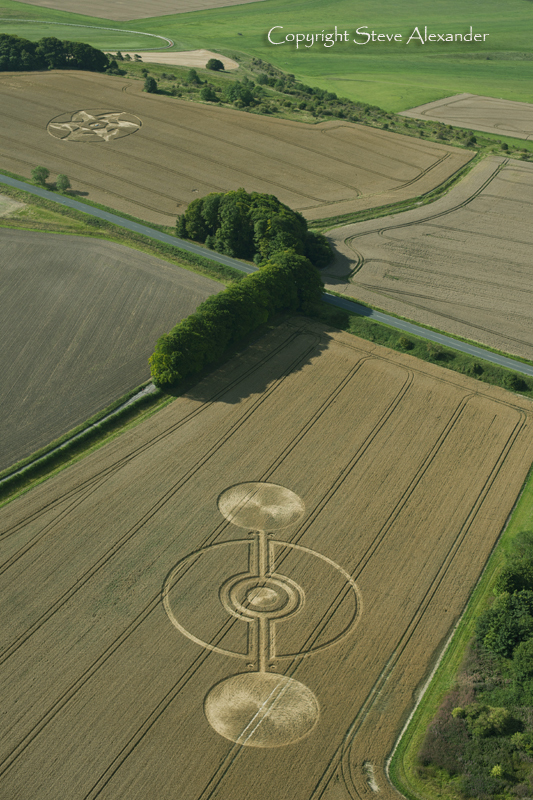 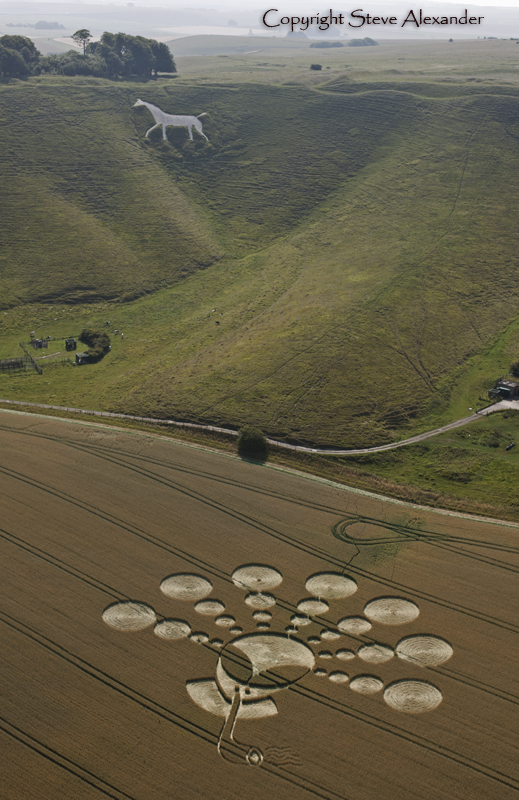 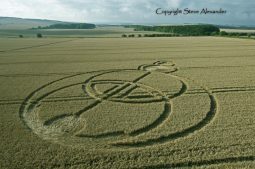 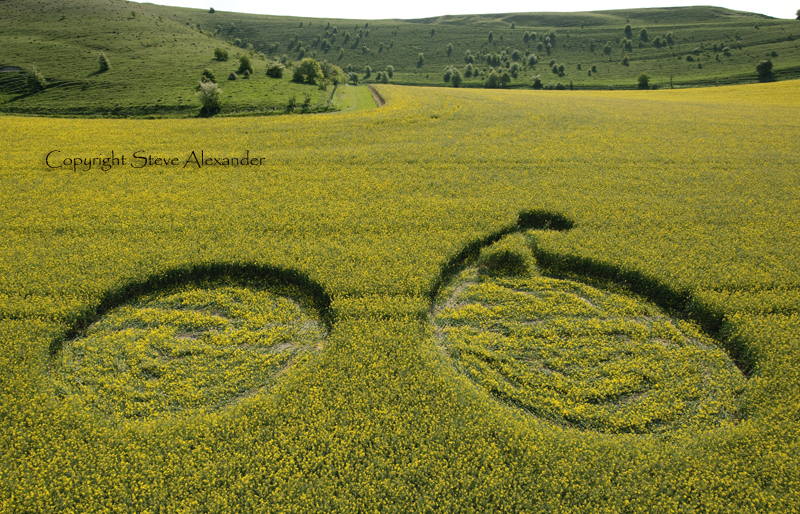 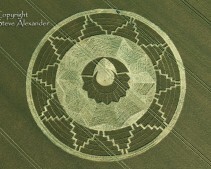 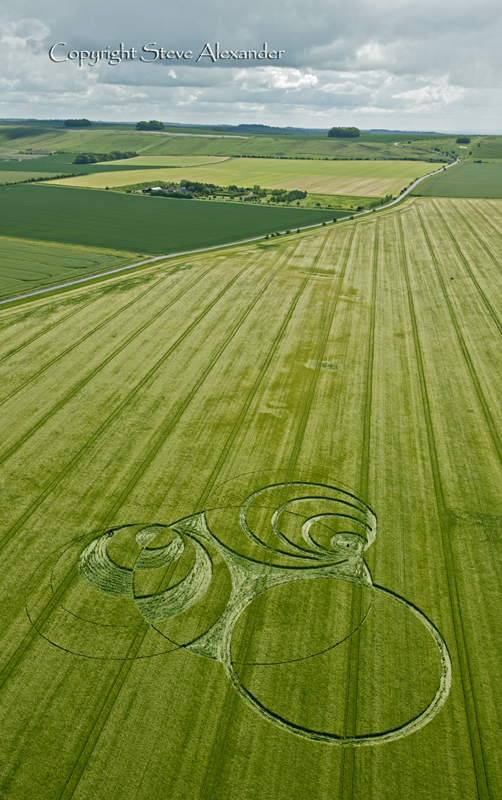 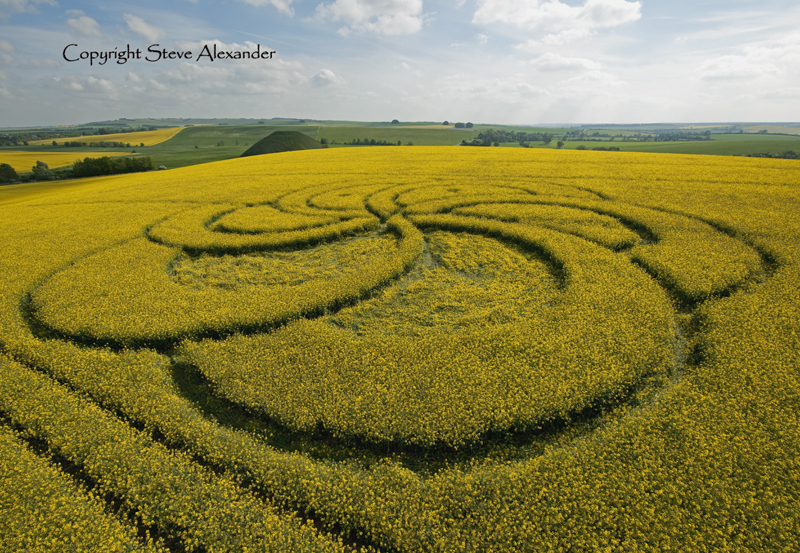 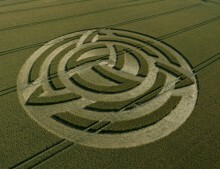 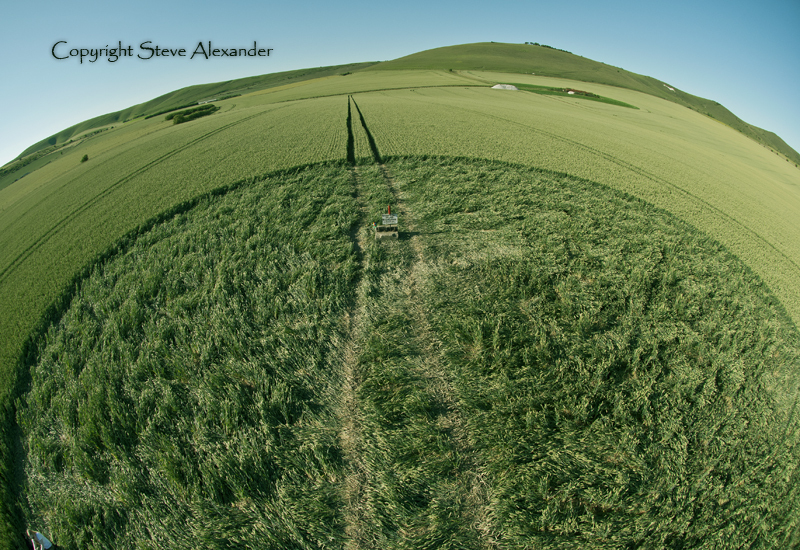 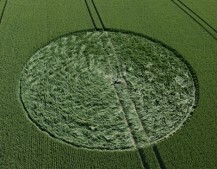 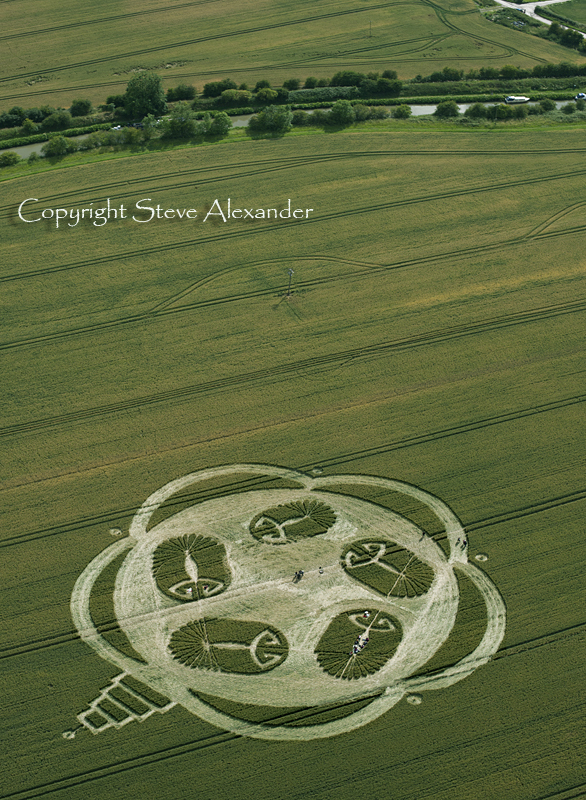 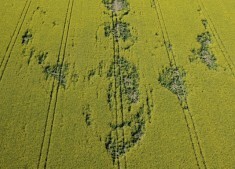 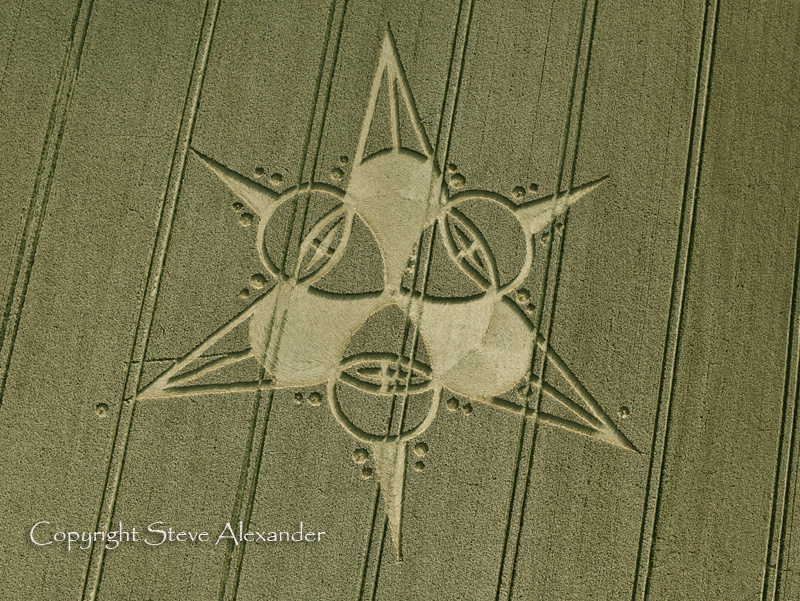 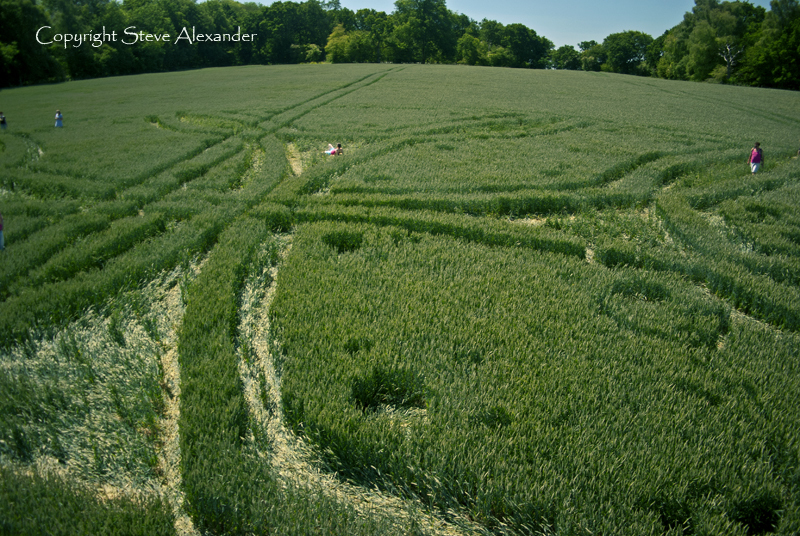 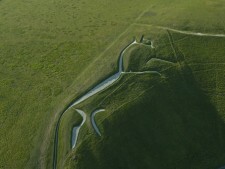 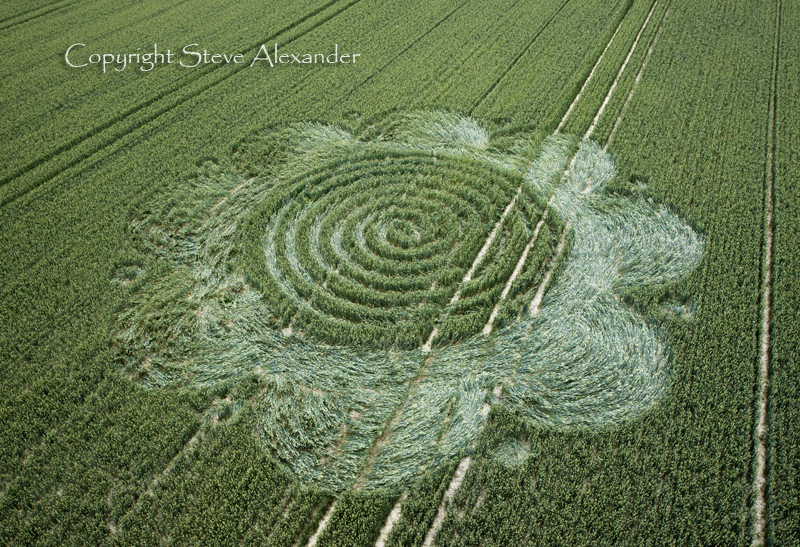 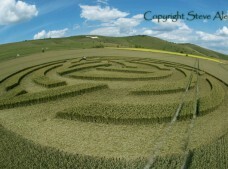 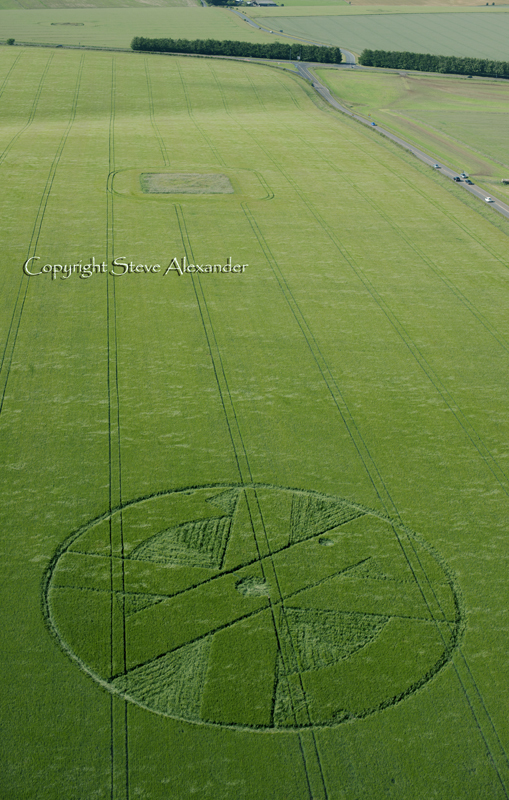 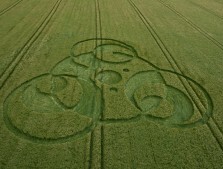 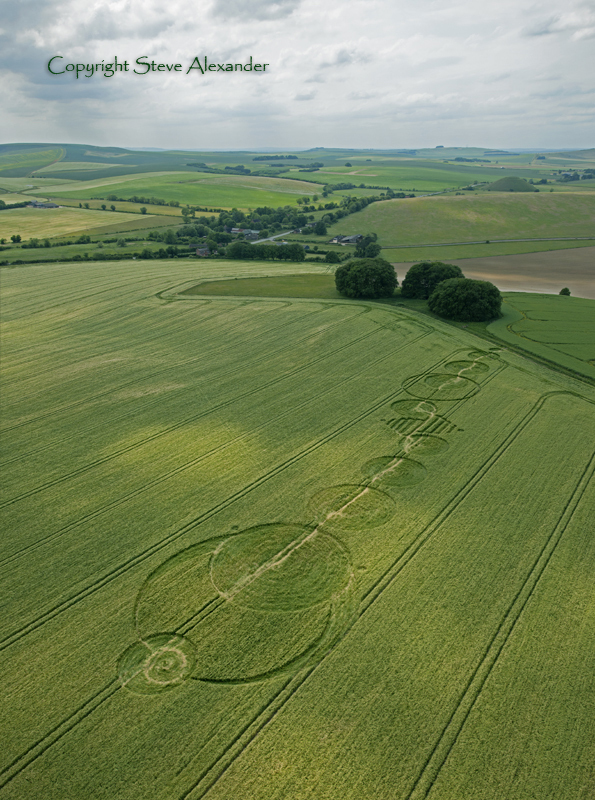 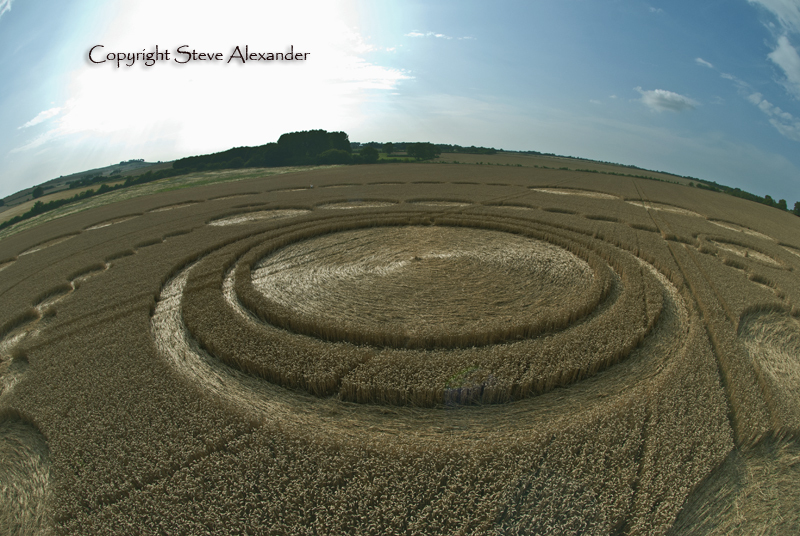 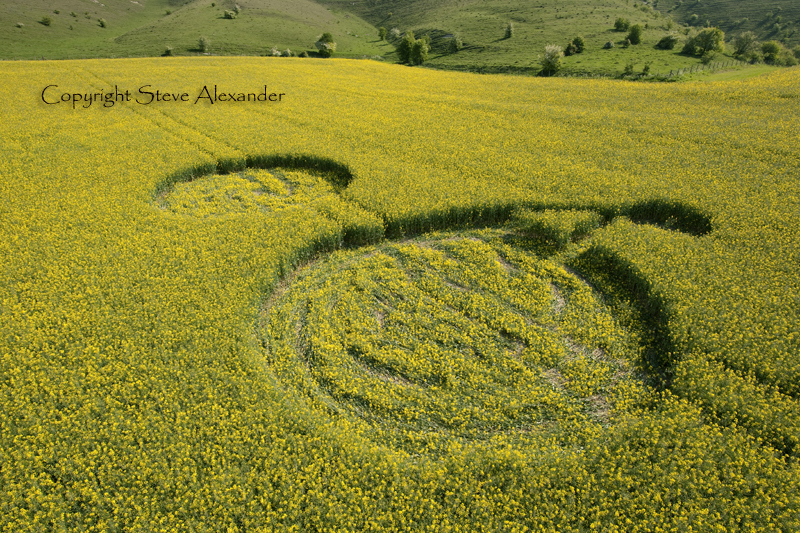 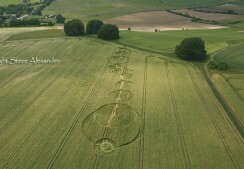 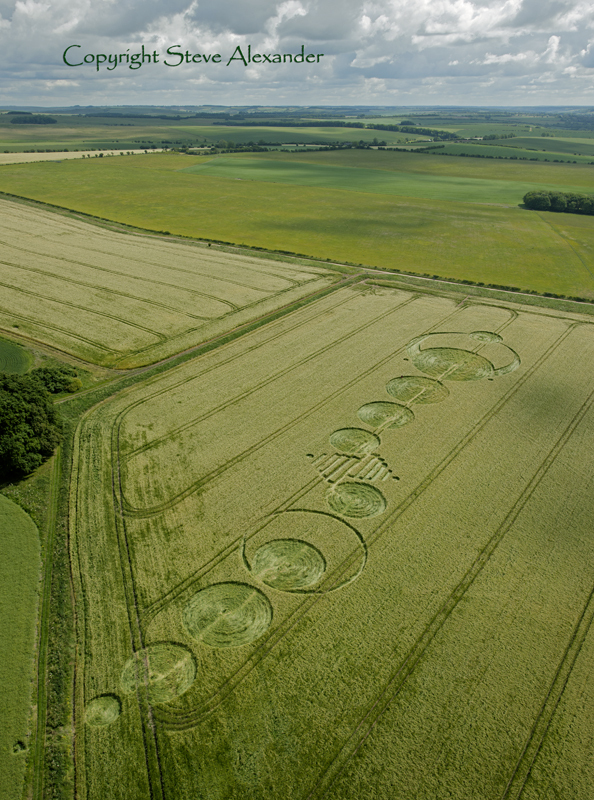 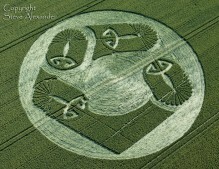 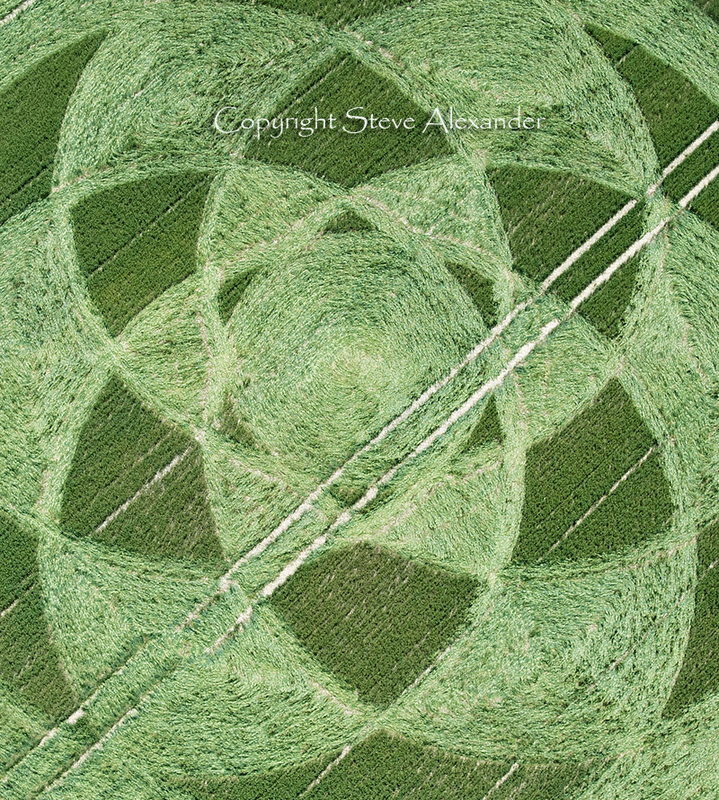 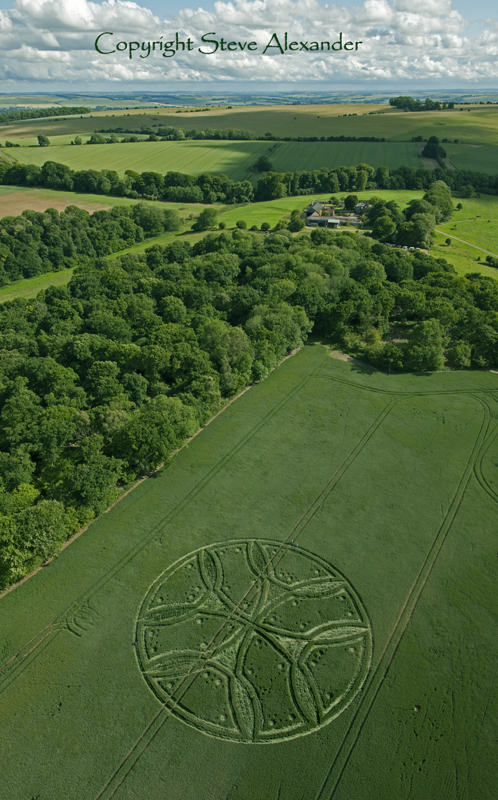 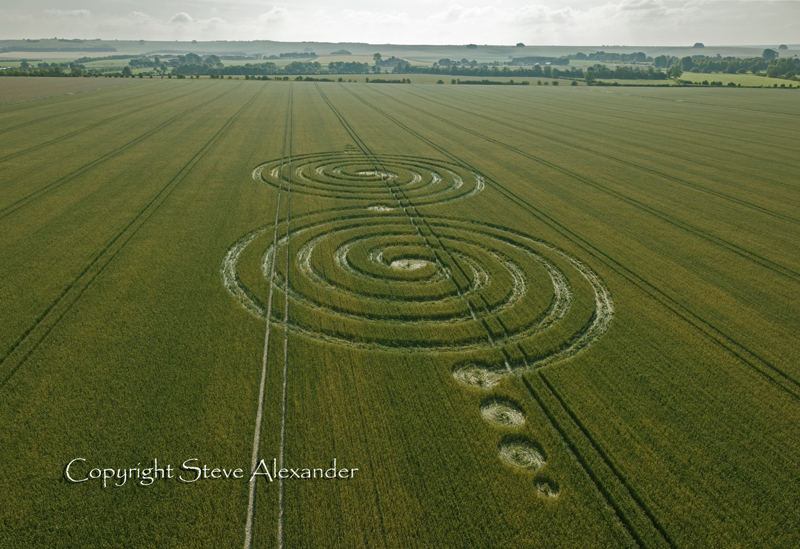 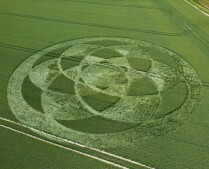 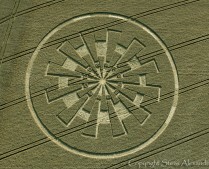 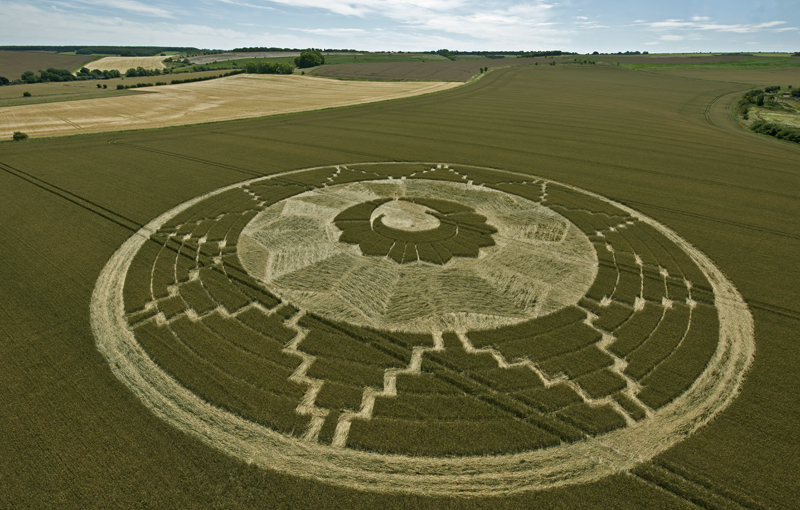 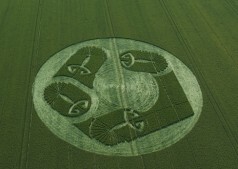 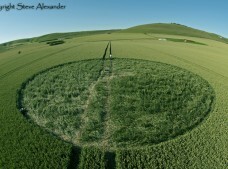 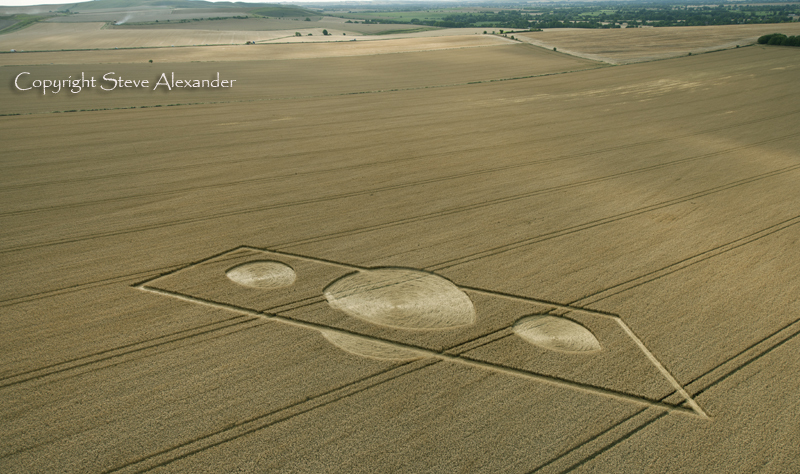 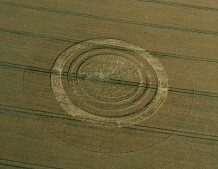 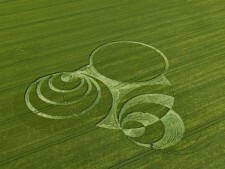 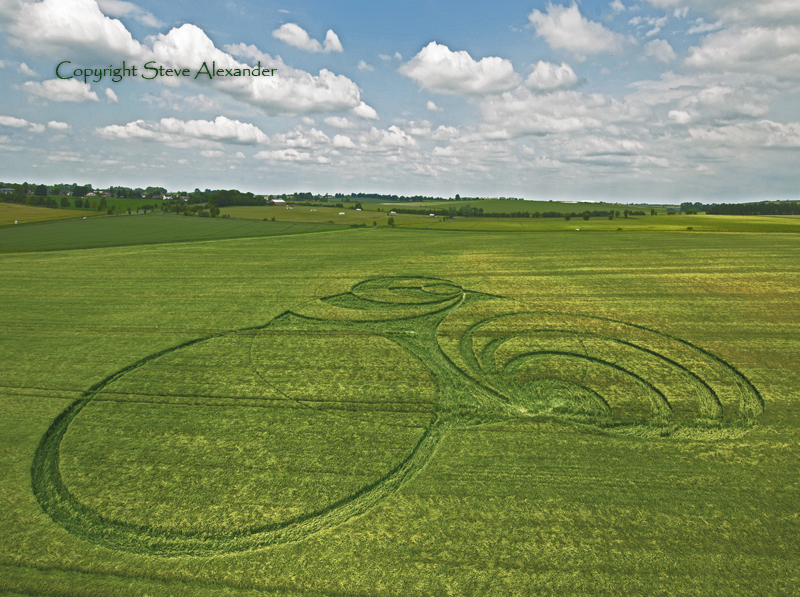 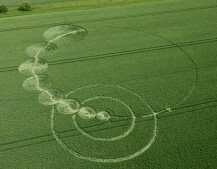 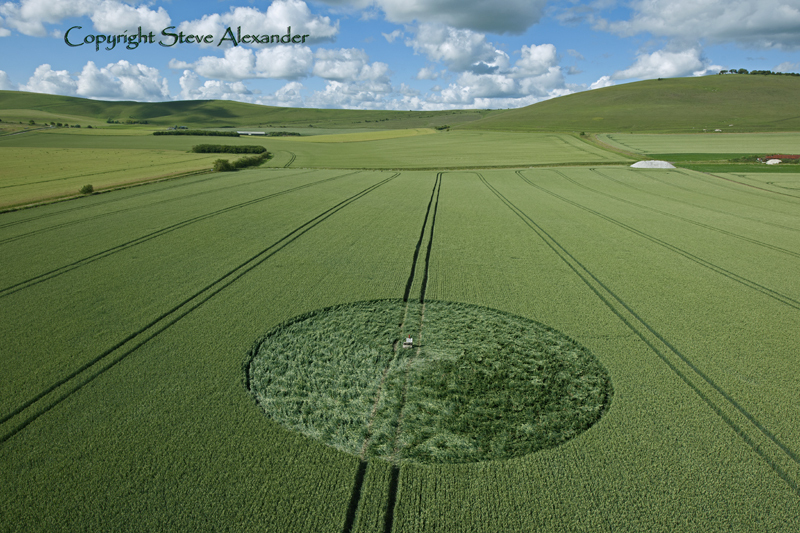 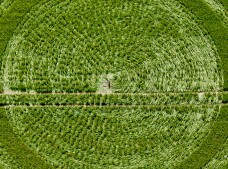 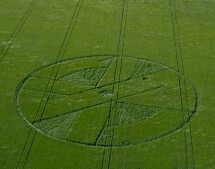 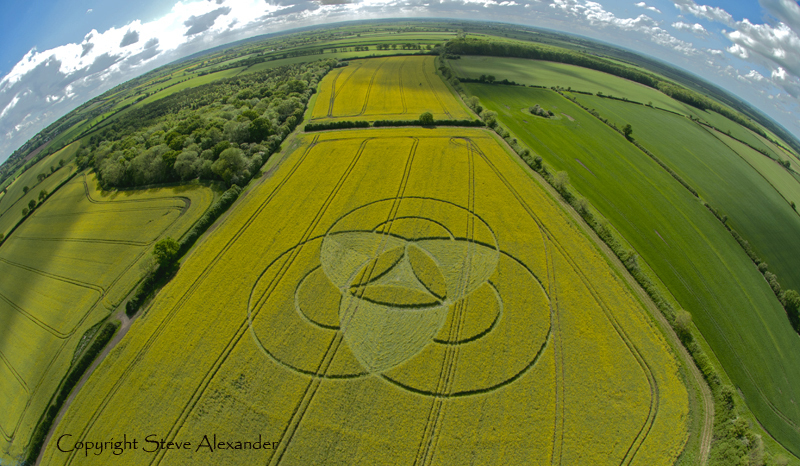 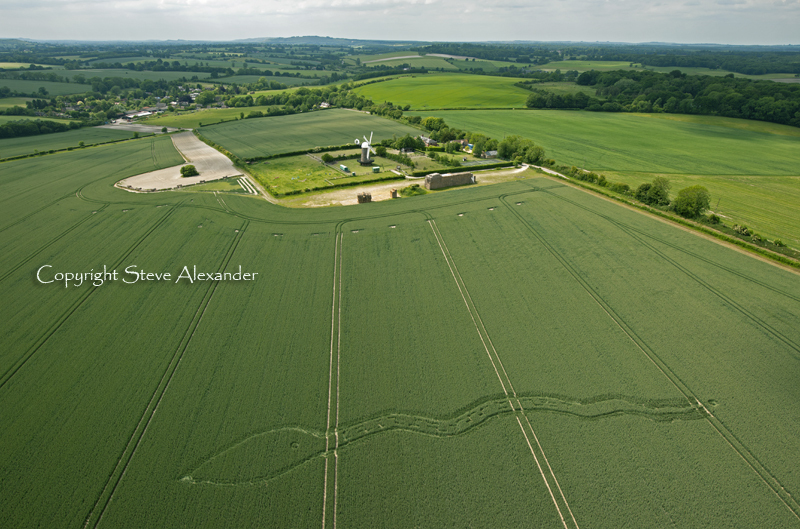 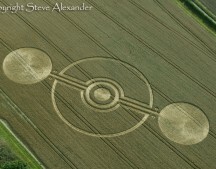 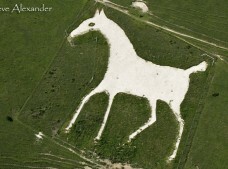 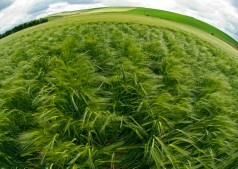 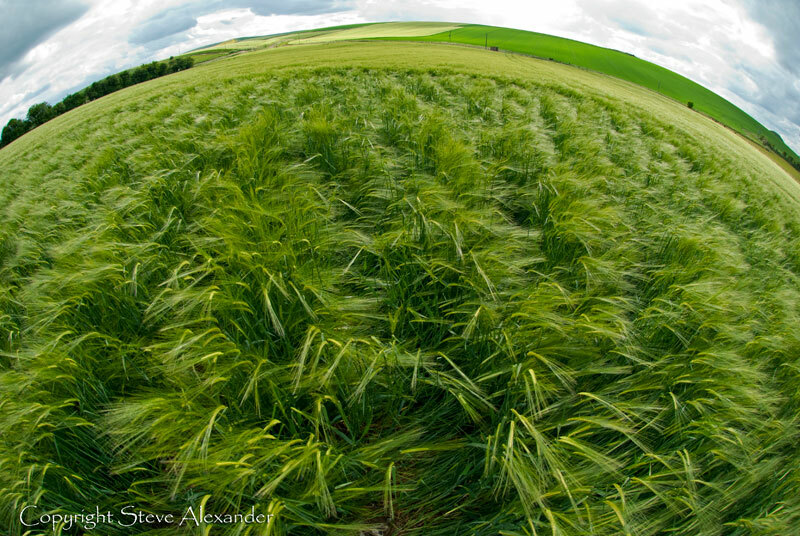 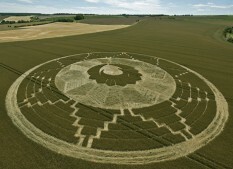 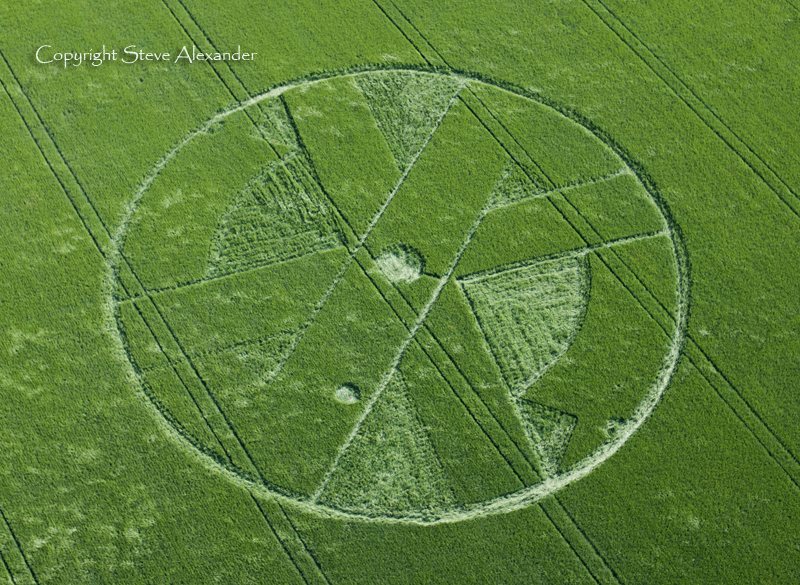 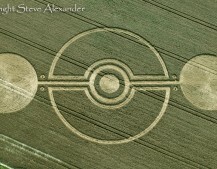 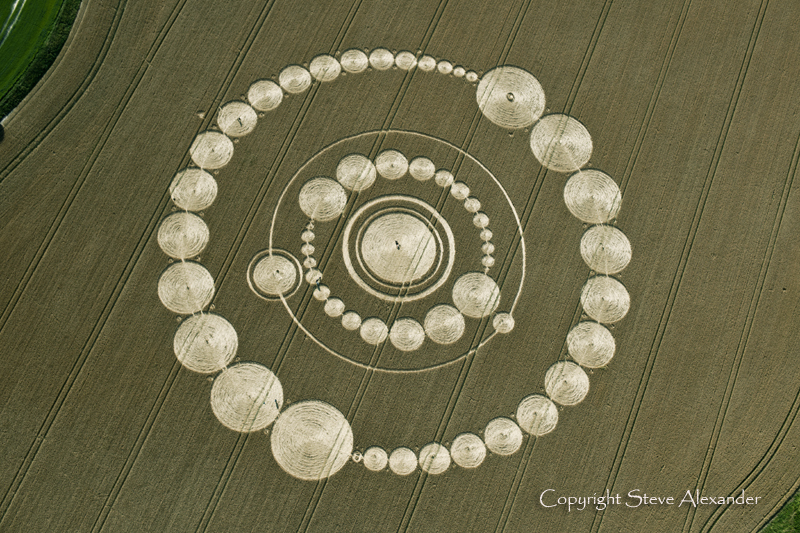 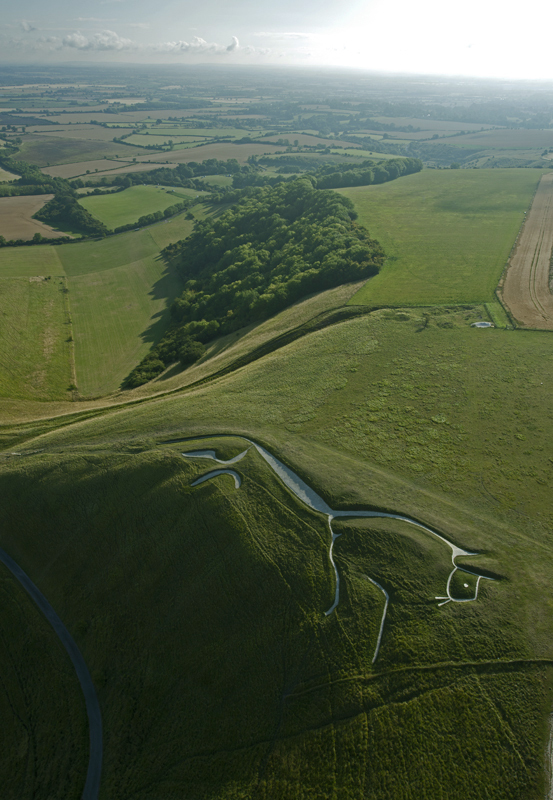 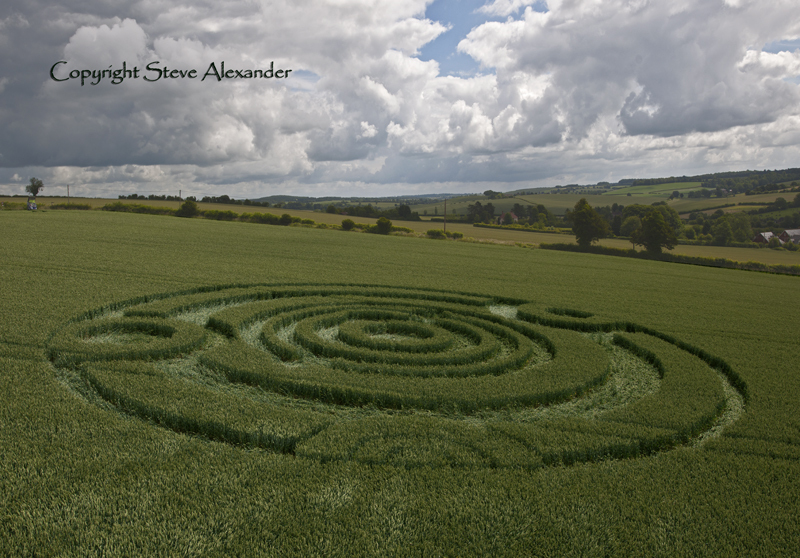 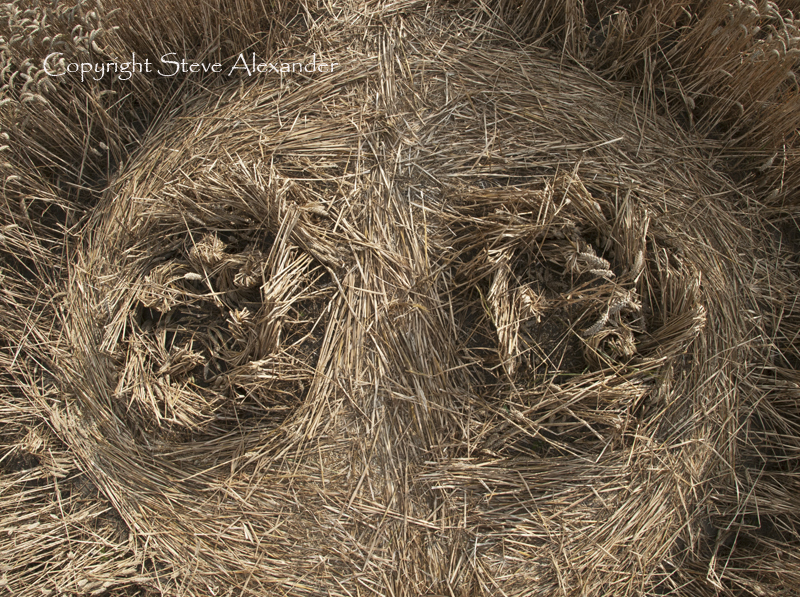 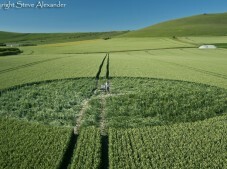 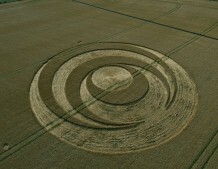 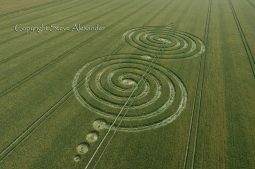 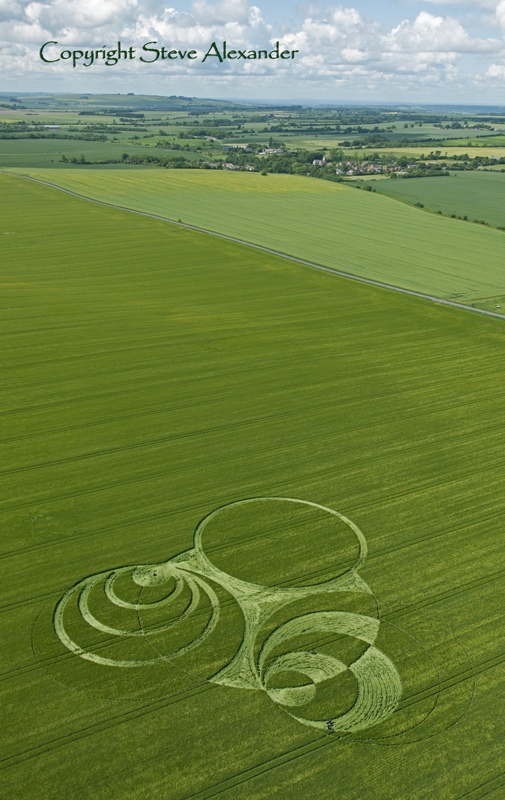 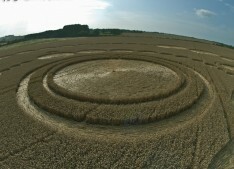 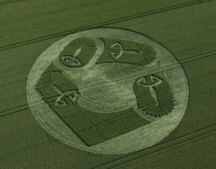 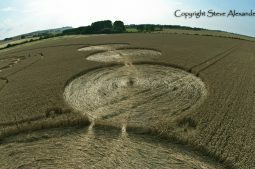 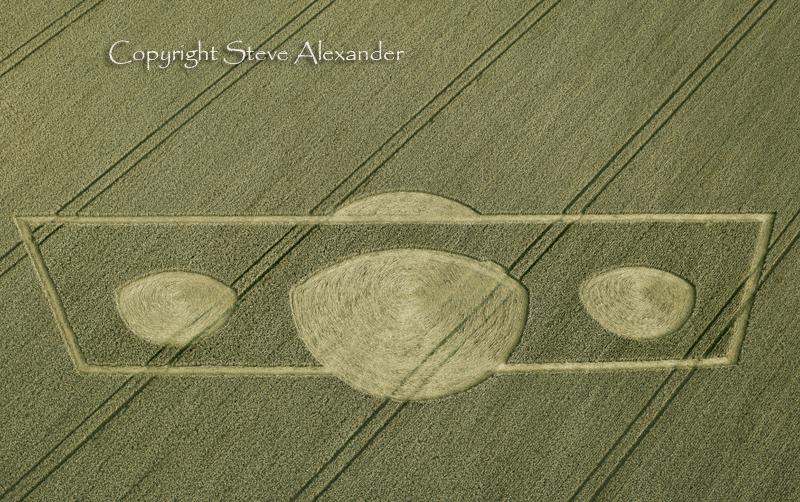 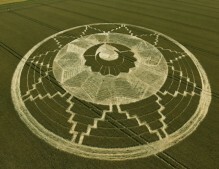 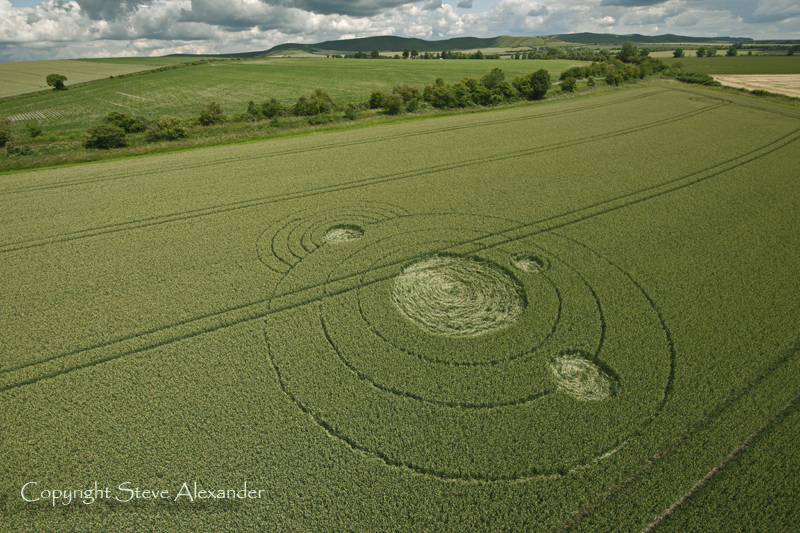 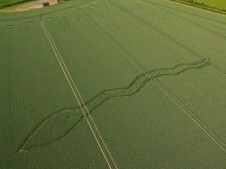 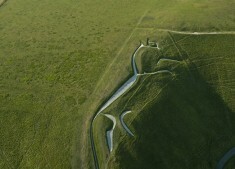 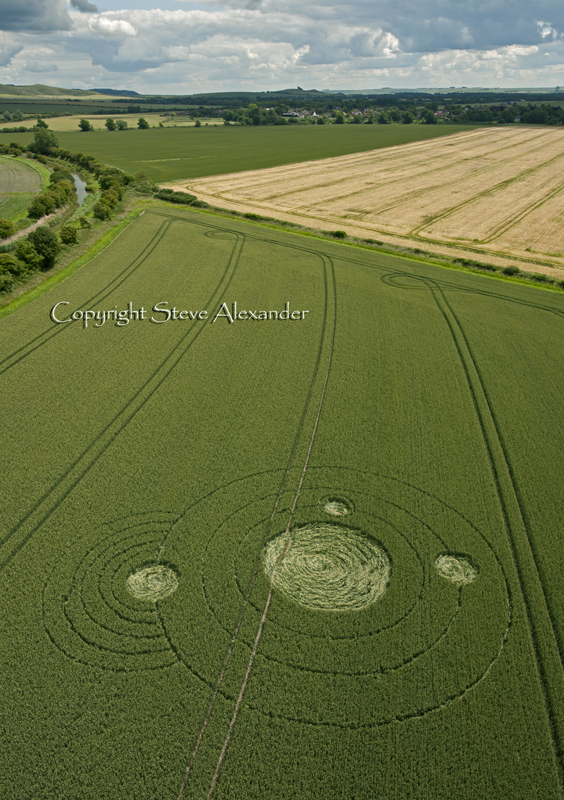 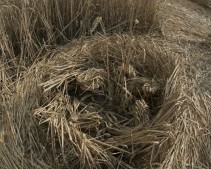 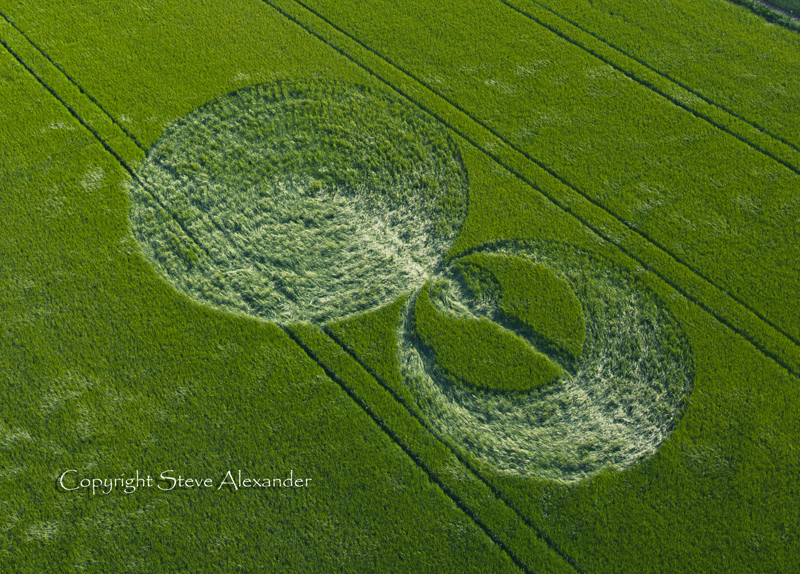 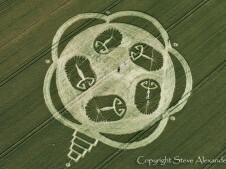 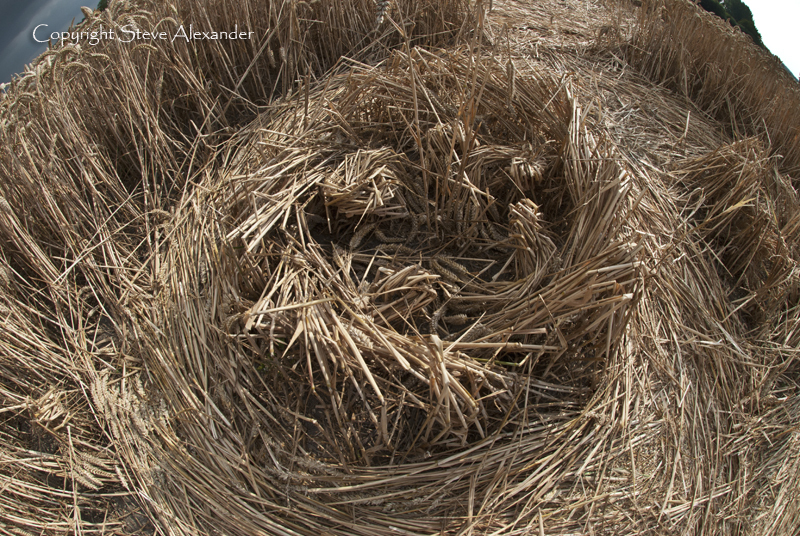 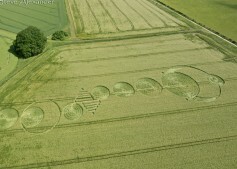 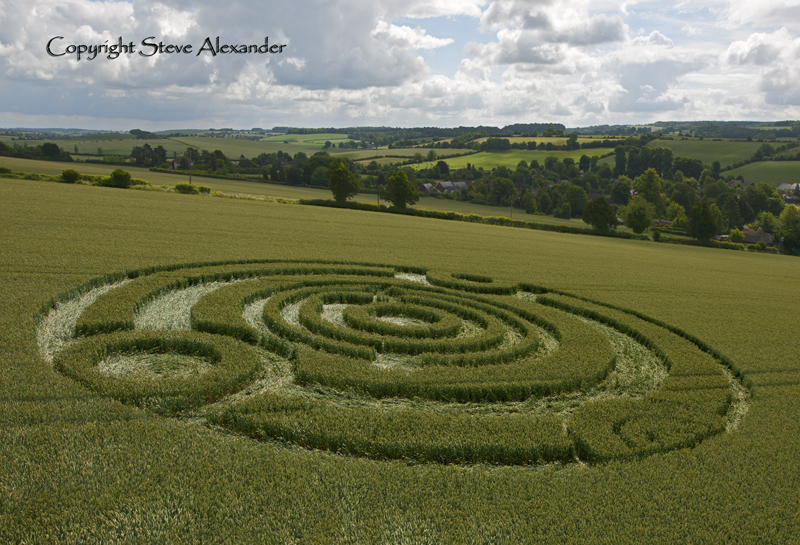 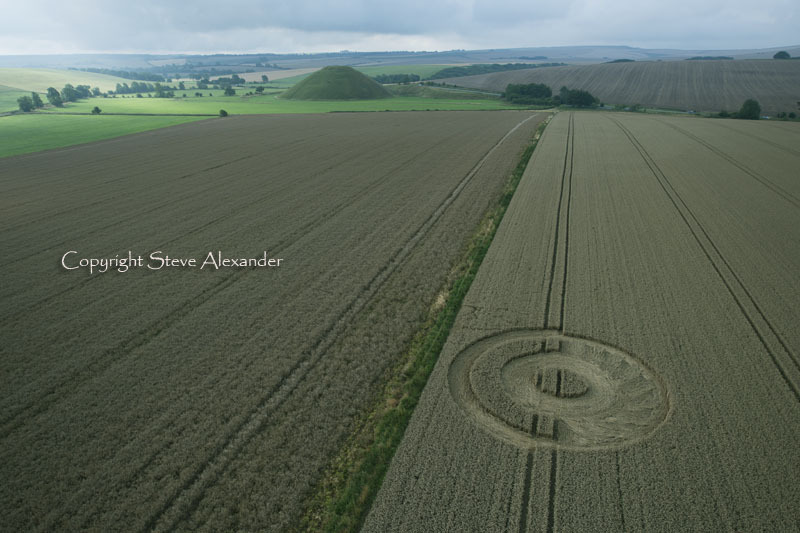 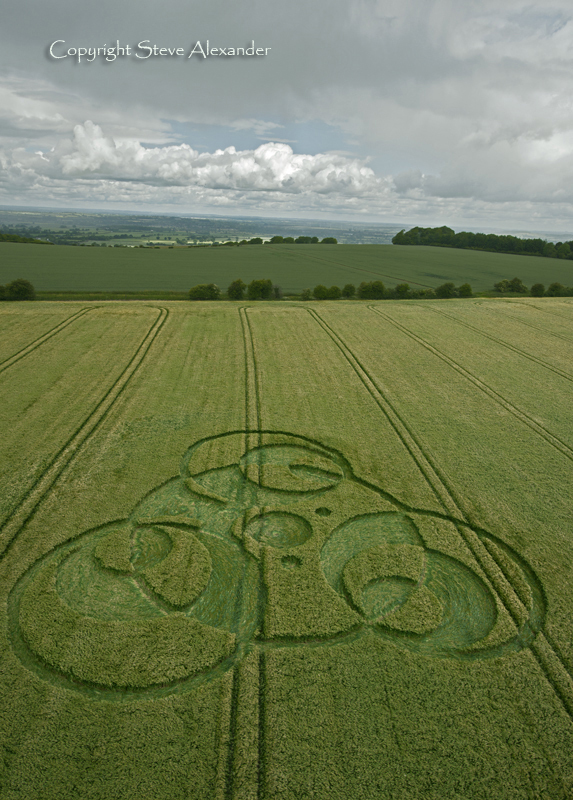 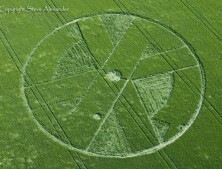 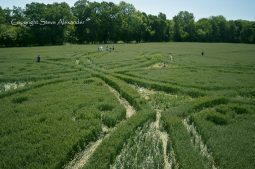 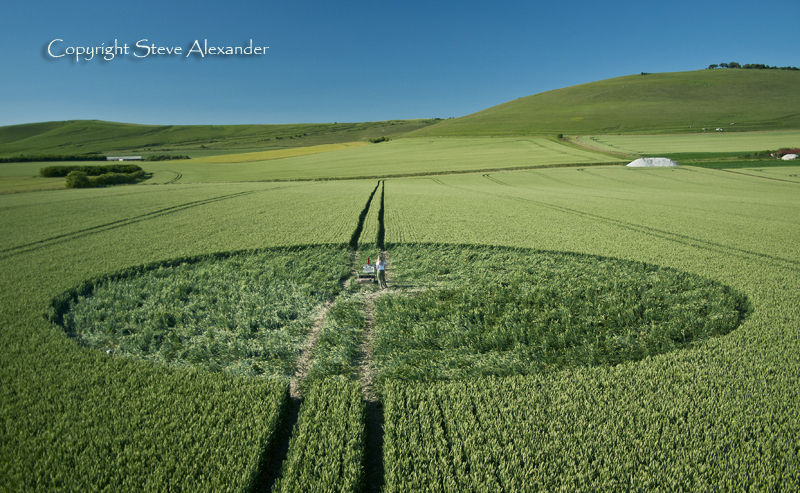 2011 saw a change of pace for the crop circle phenomenon, a slow down with smaller less complicated formations appearing early in the season. 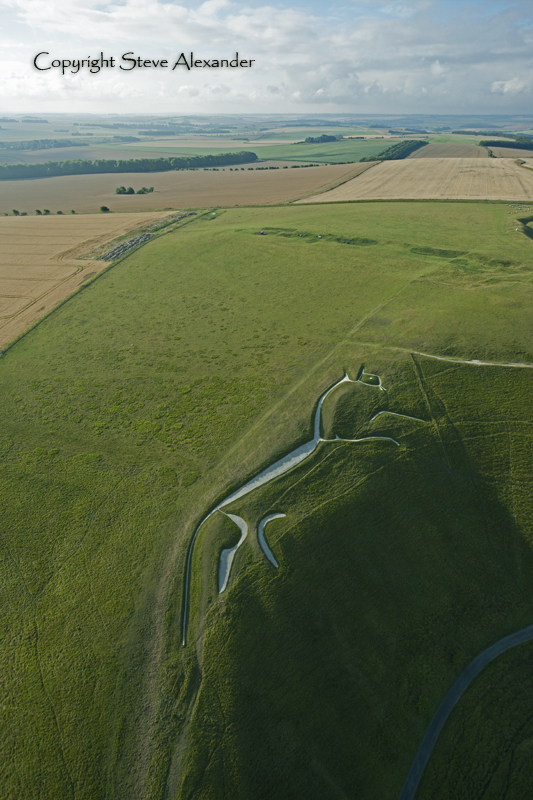 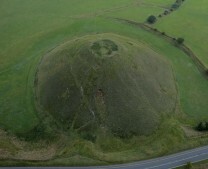 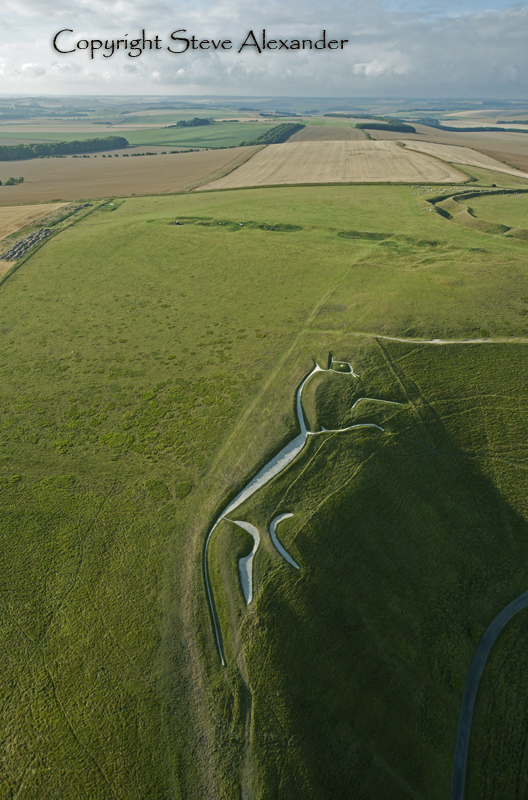 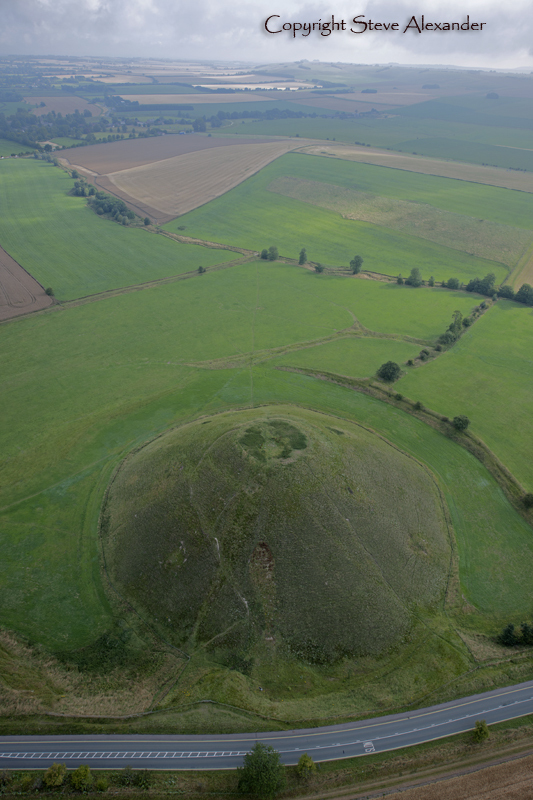 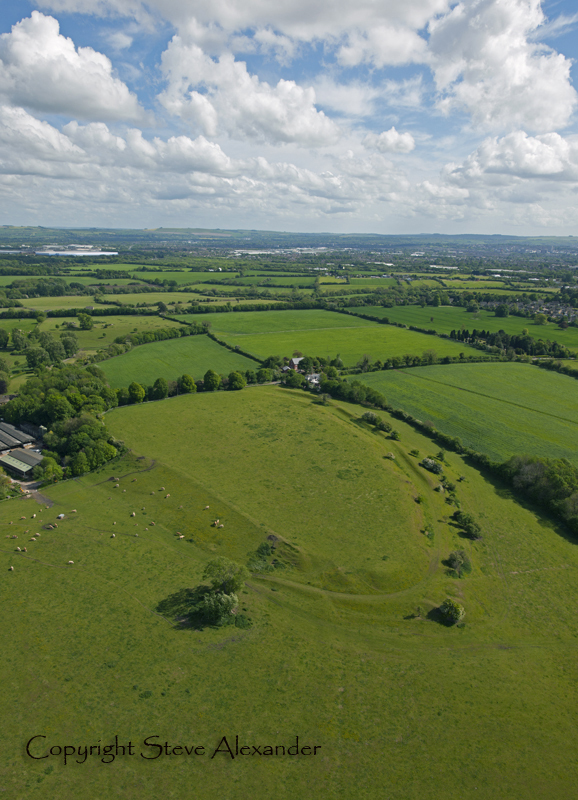 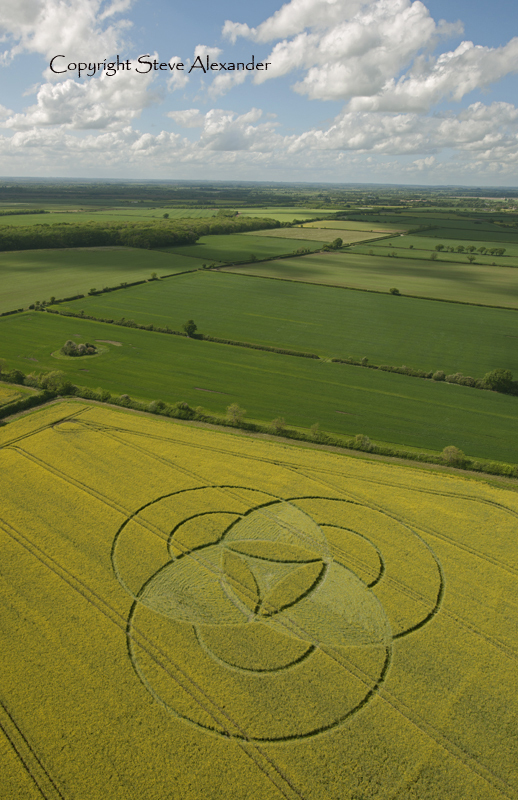 However, things were to pick up in the height of the summer with beautiful circles at Milk Hill, the Pyramidal City at East kennet and the Satined Glass Window at Temple Balsall. 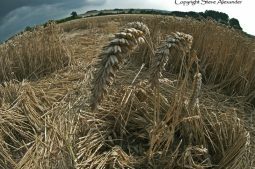 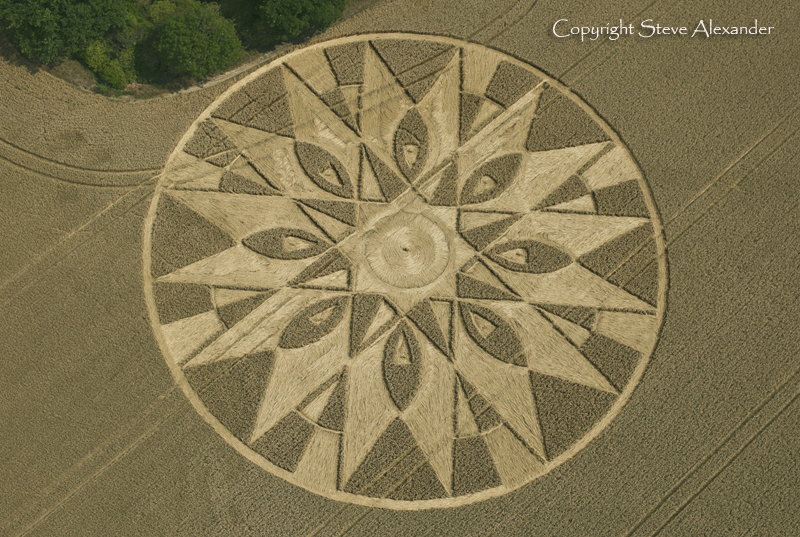 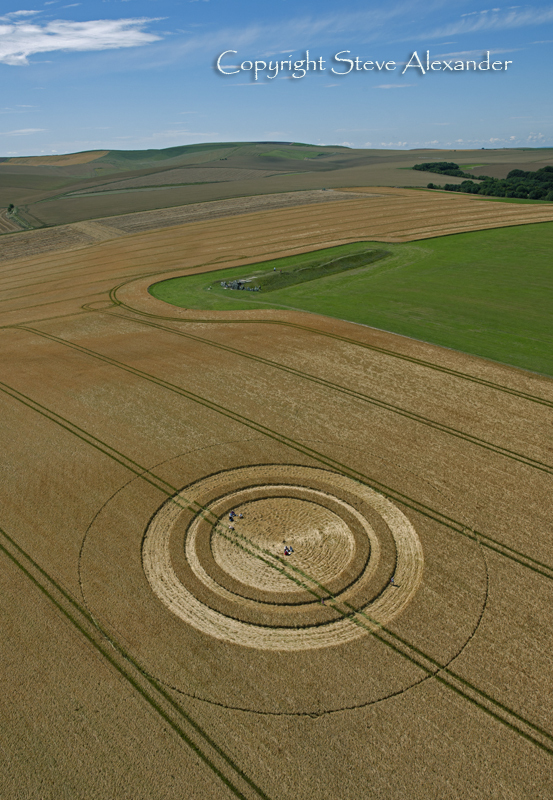 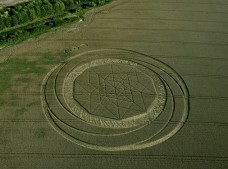 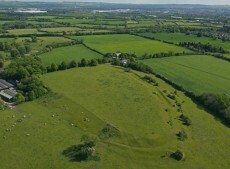 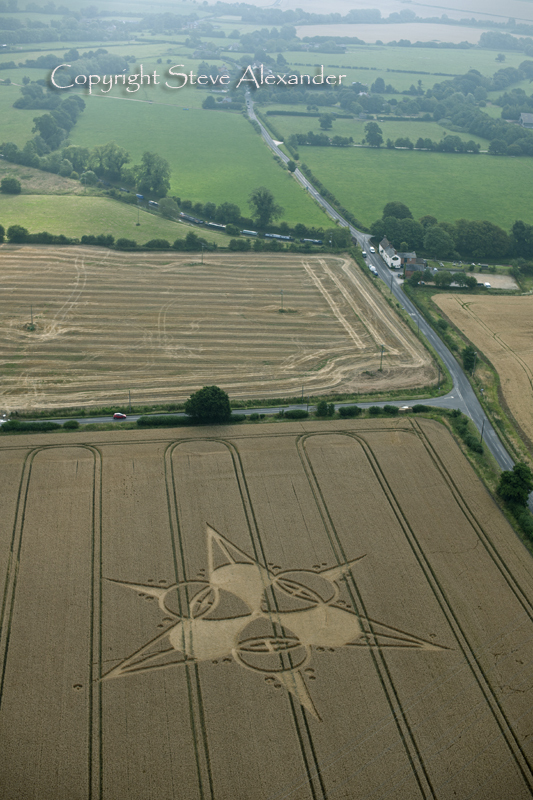 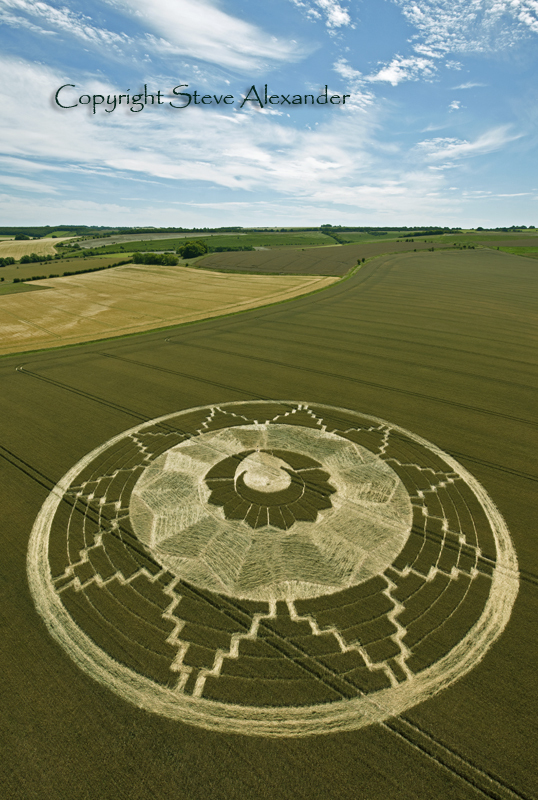 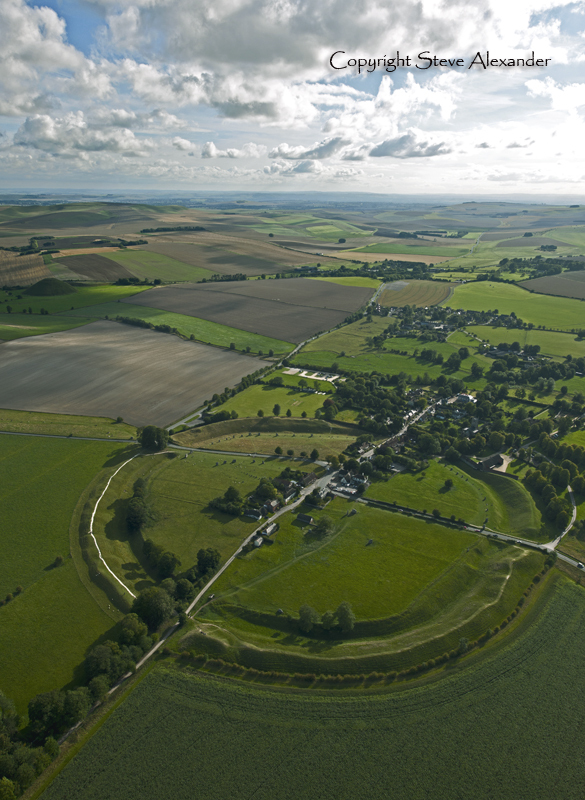 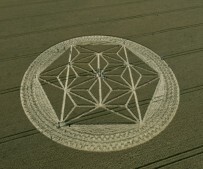 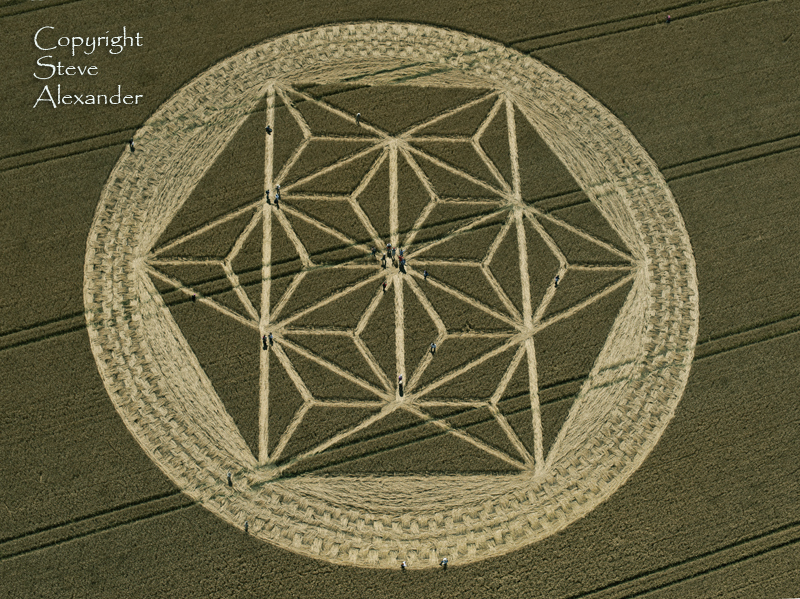 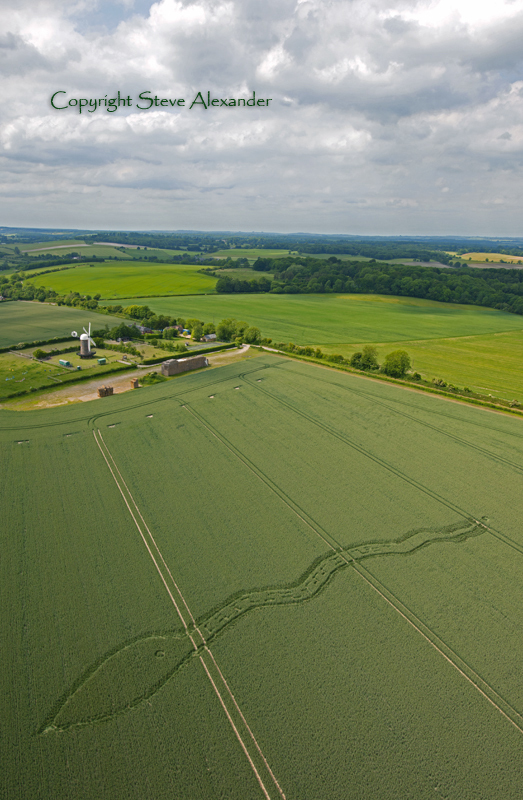 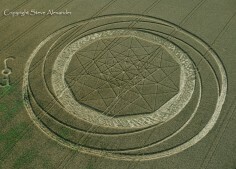 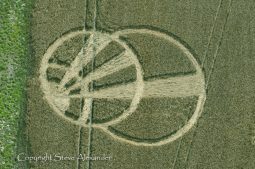 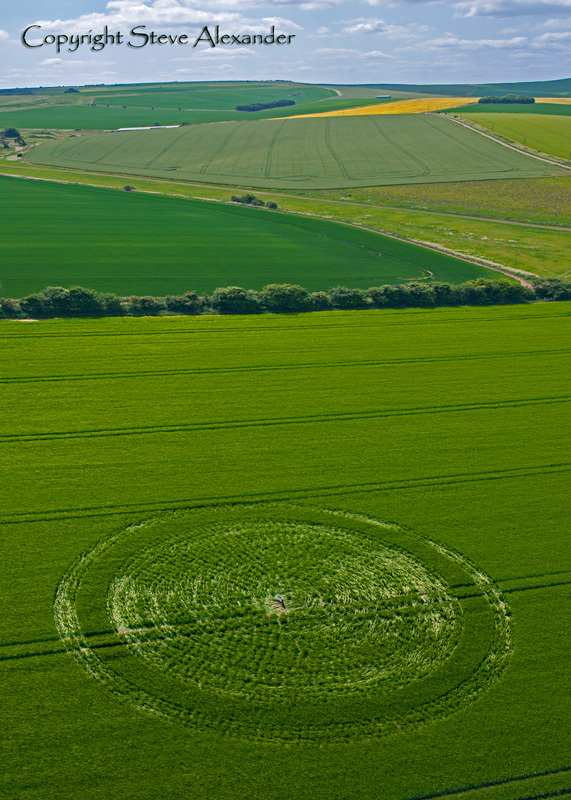 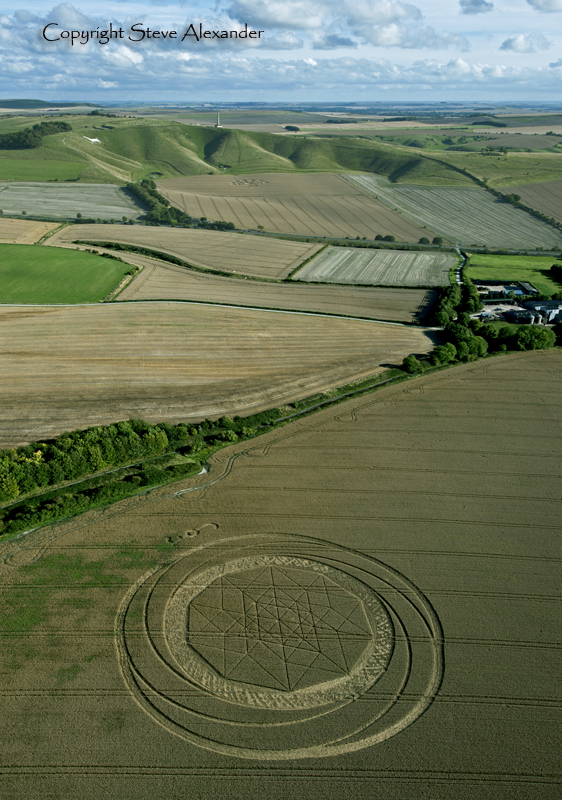 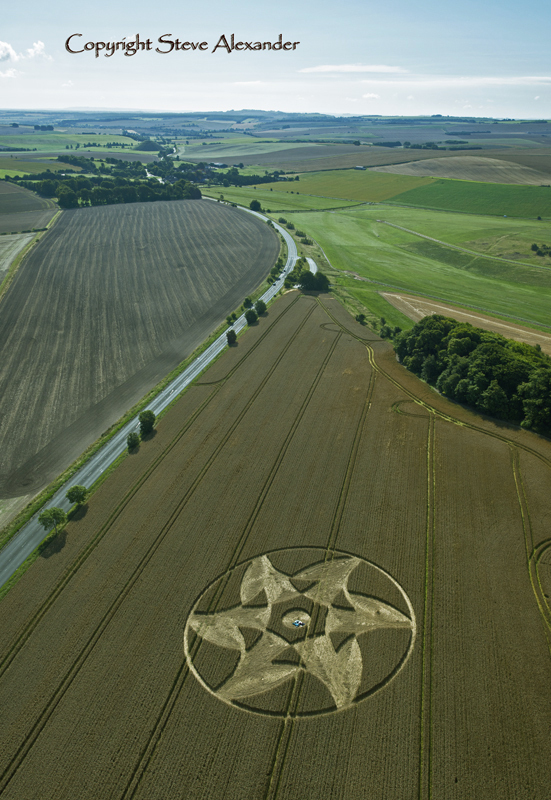 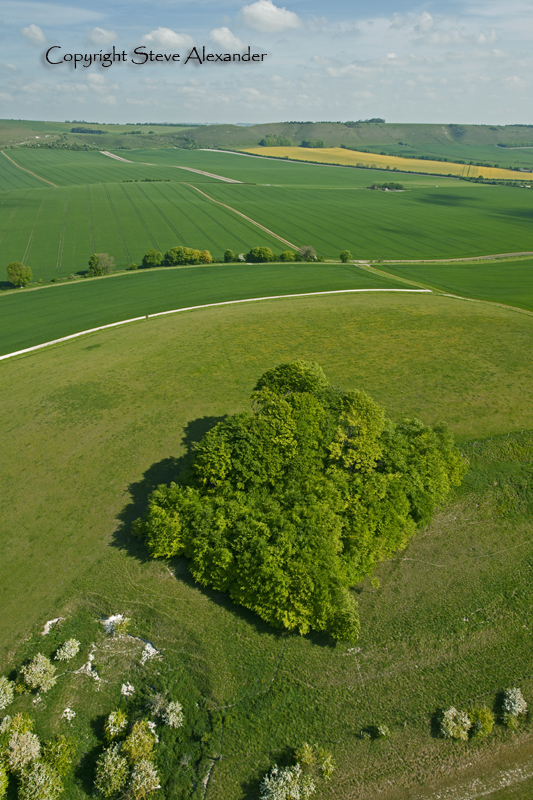 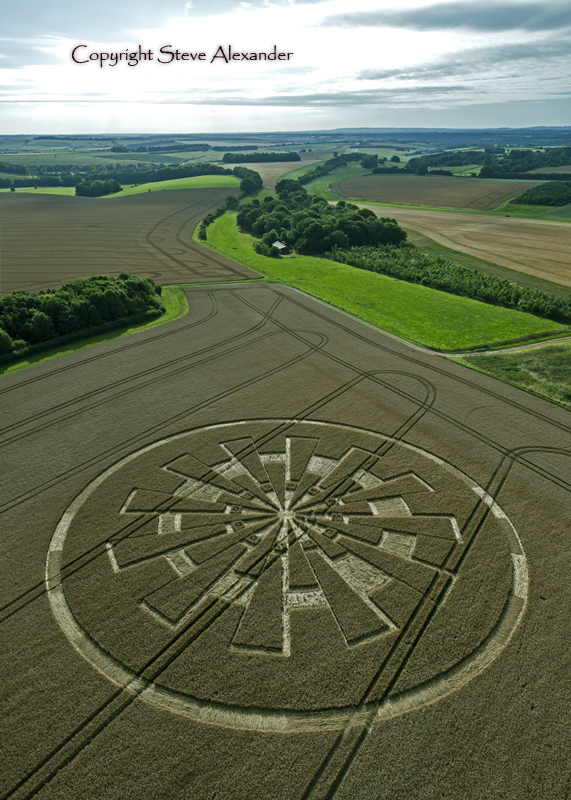 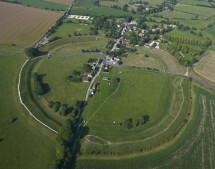 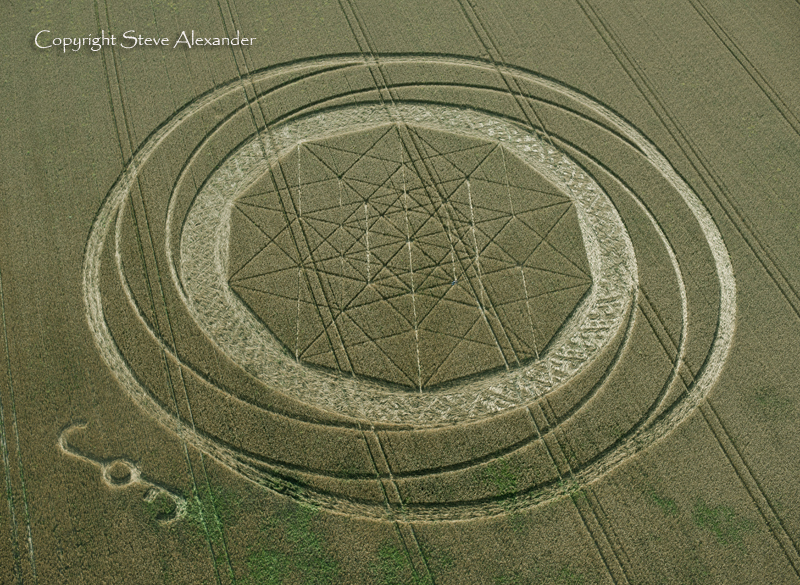 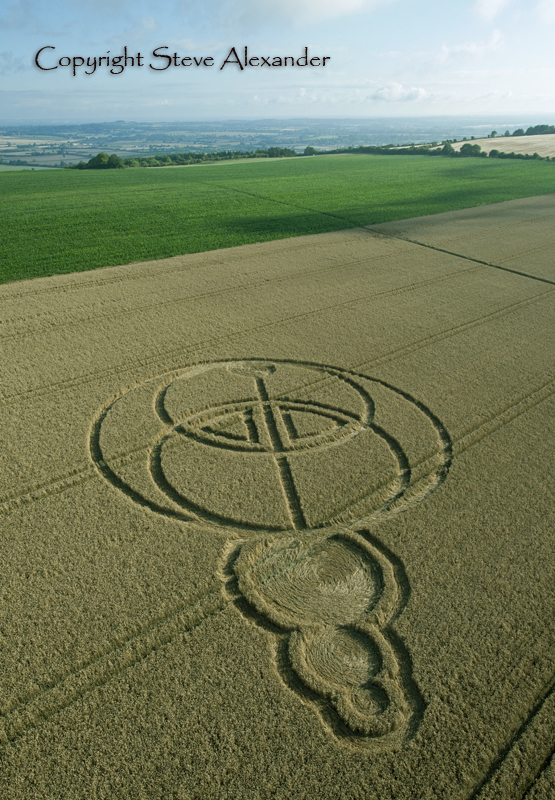 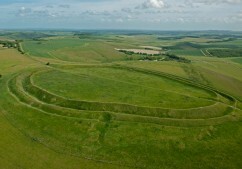 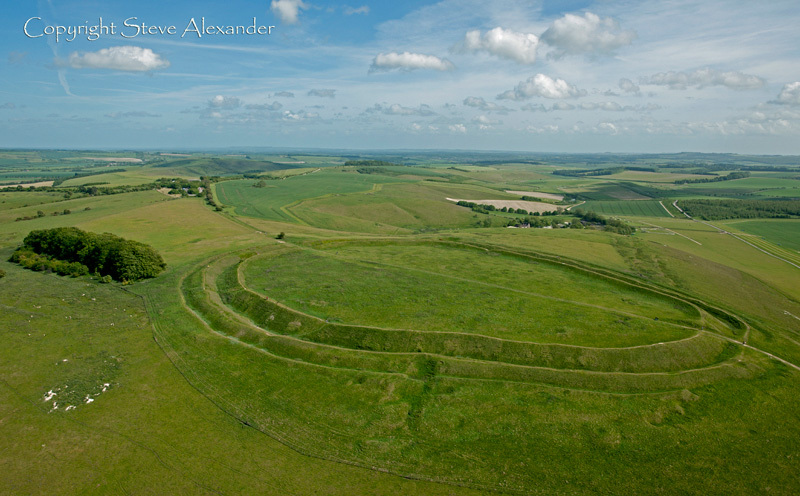 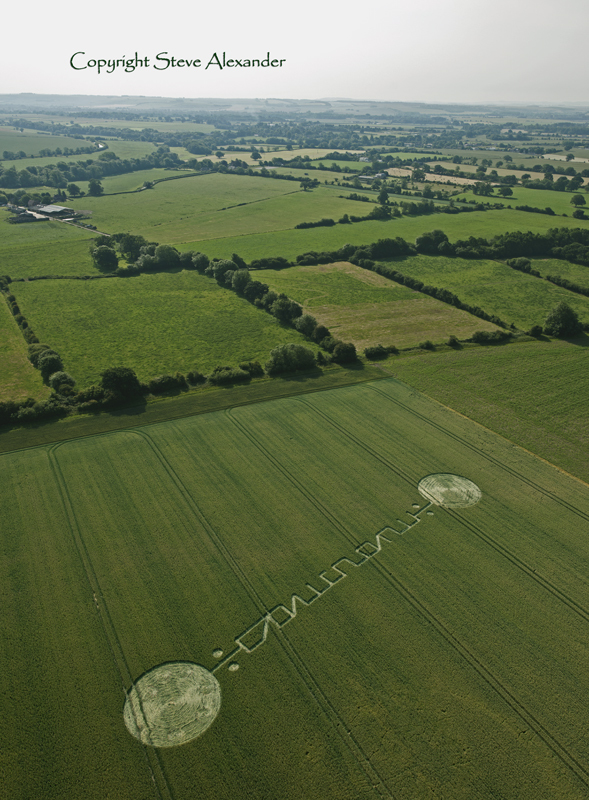 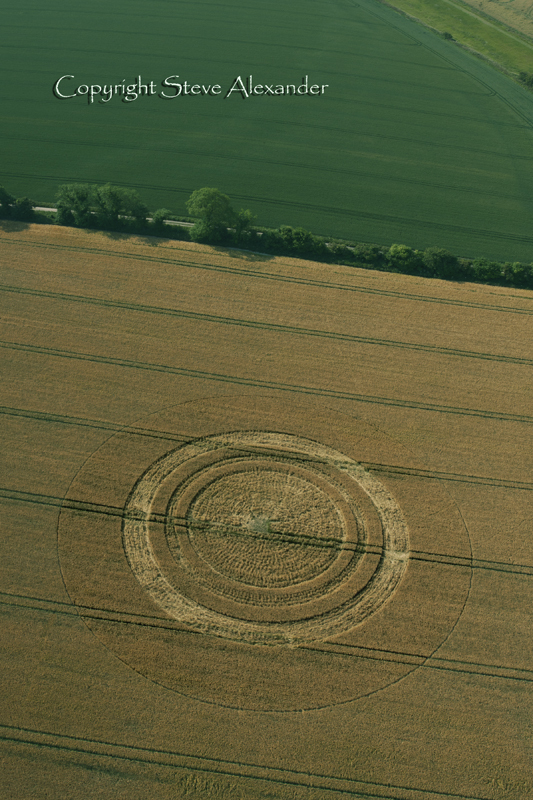 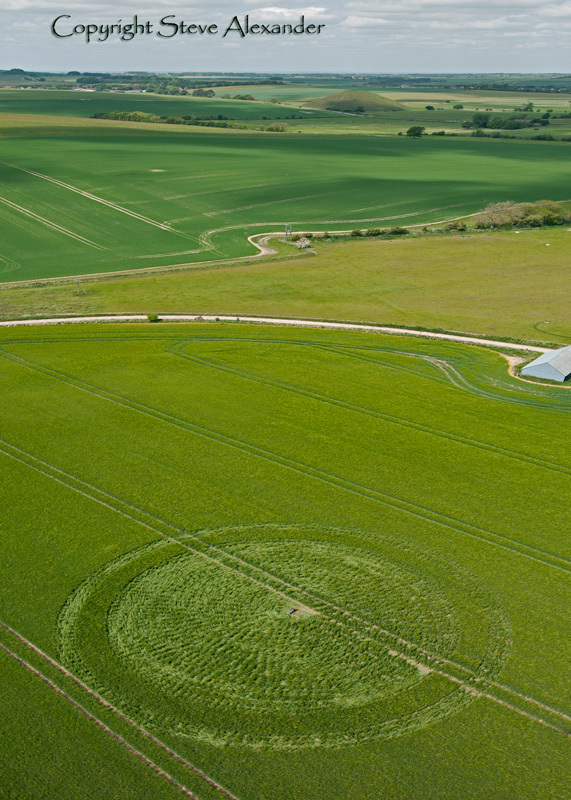 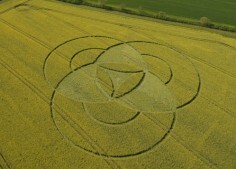 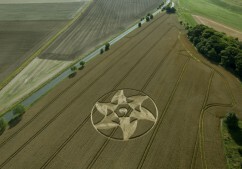 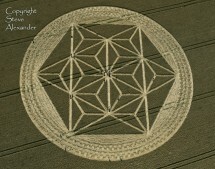 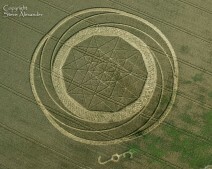 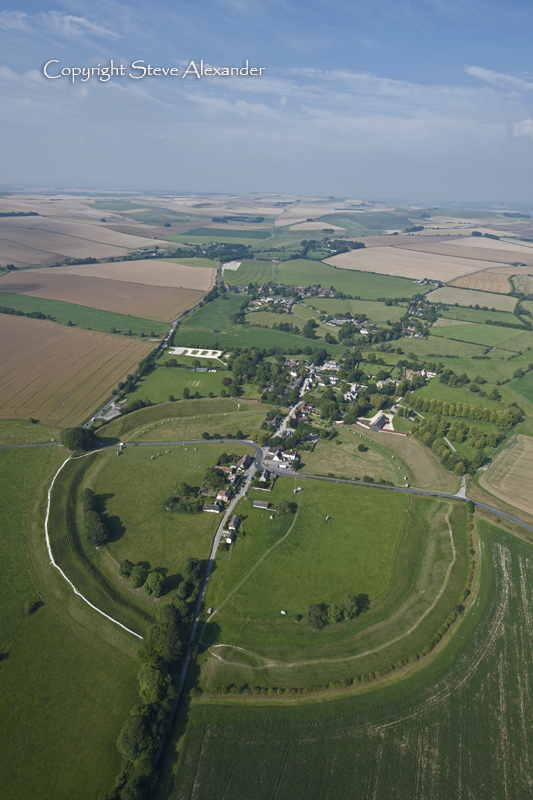 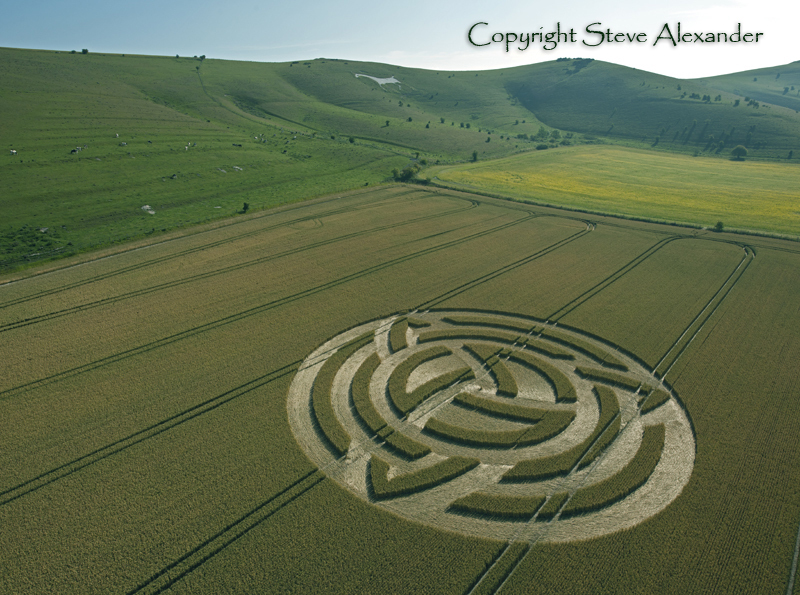 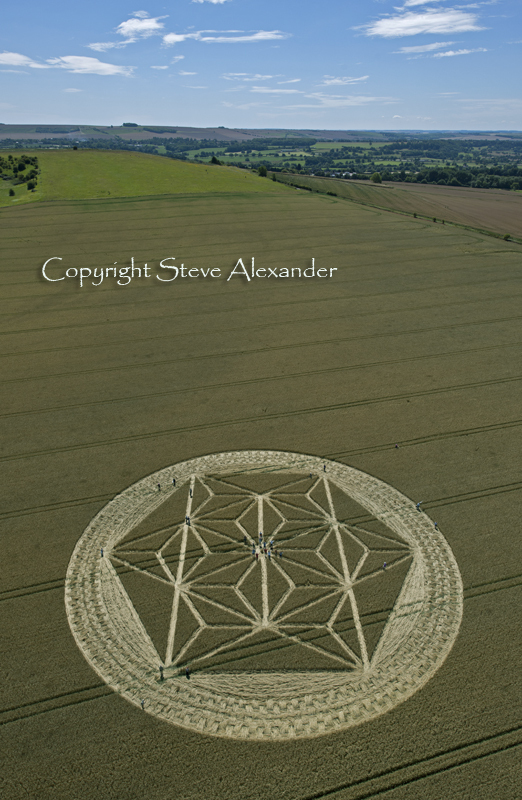 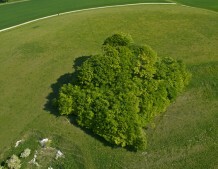 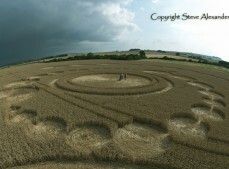 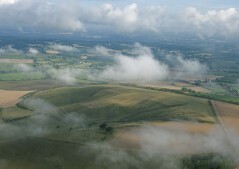 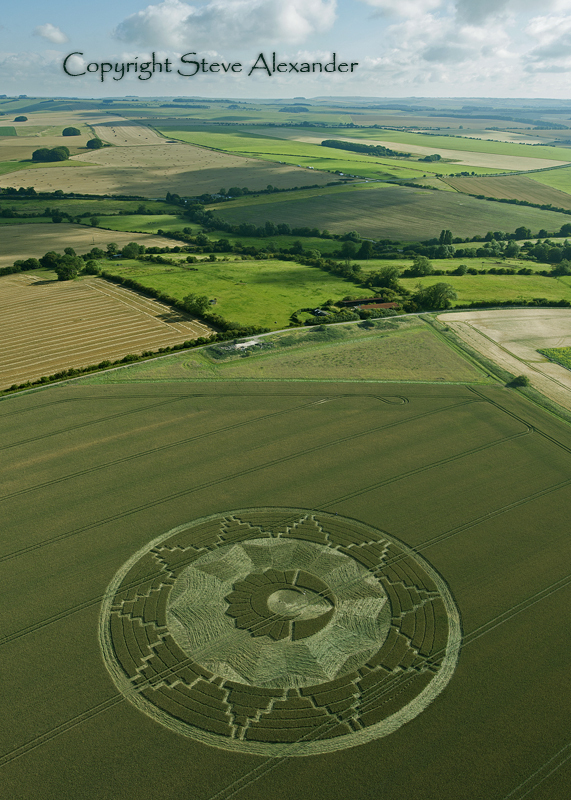 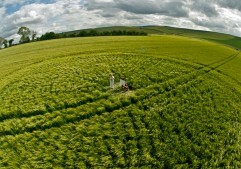 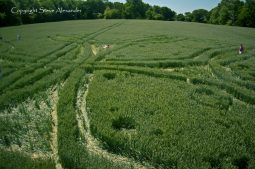 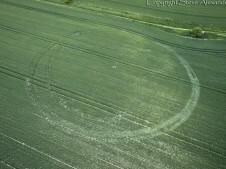 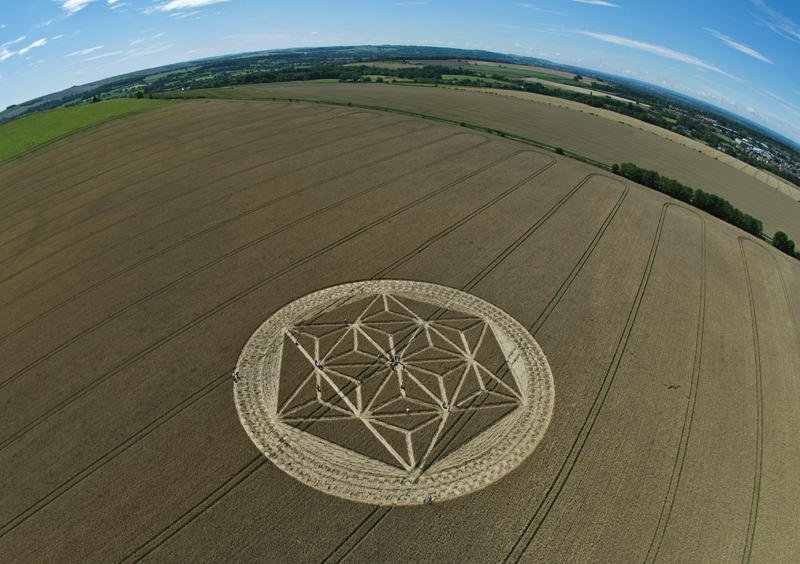 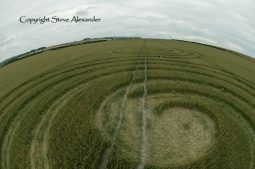 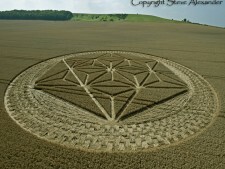 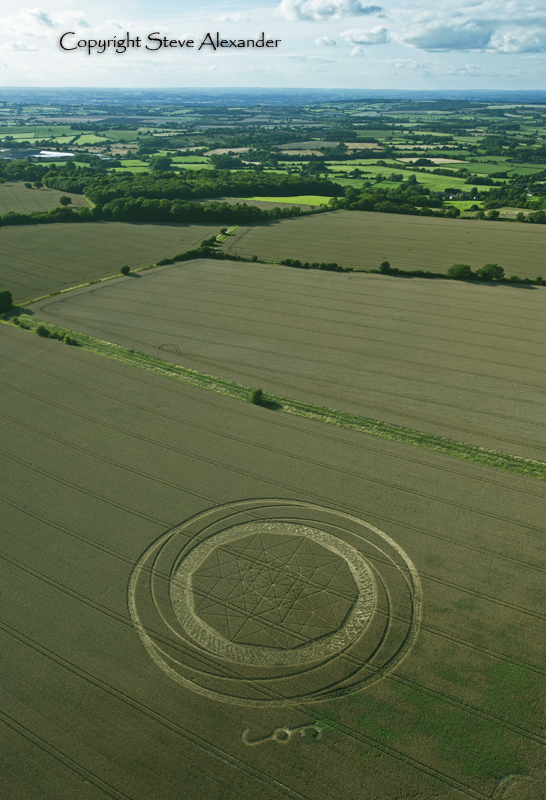 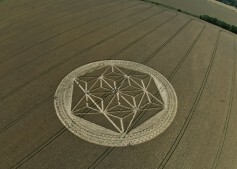 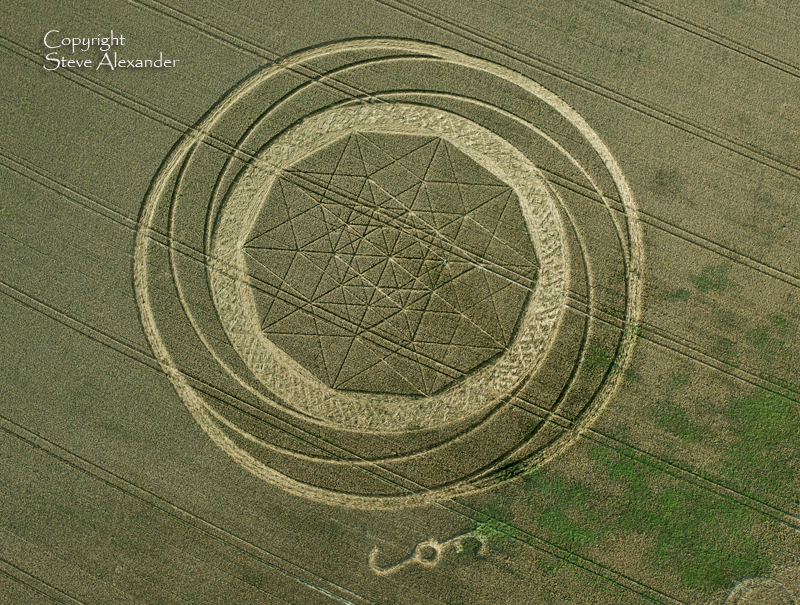 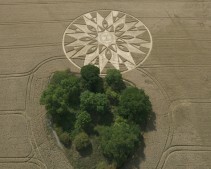 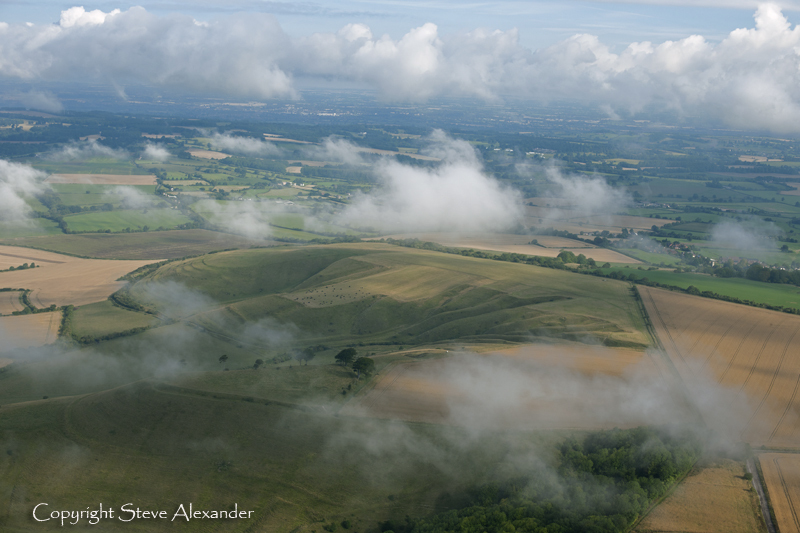 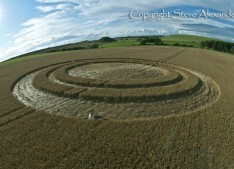 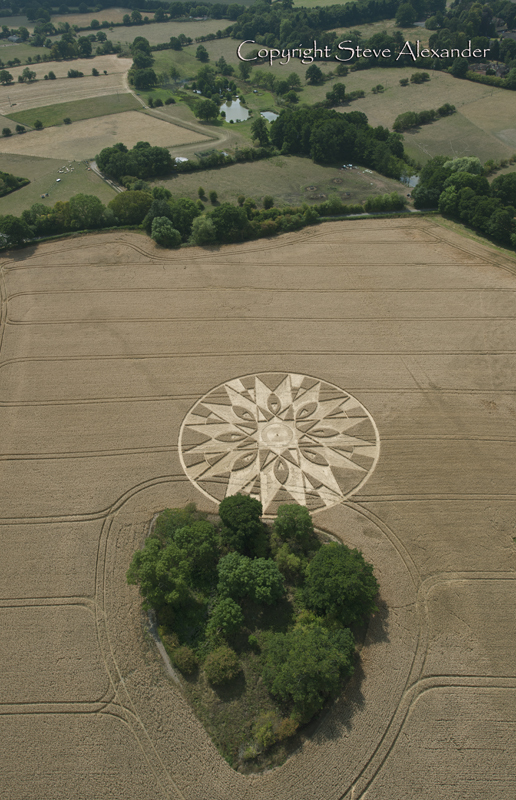 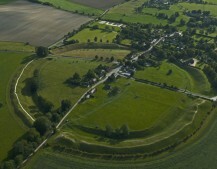 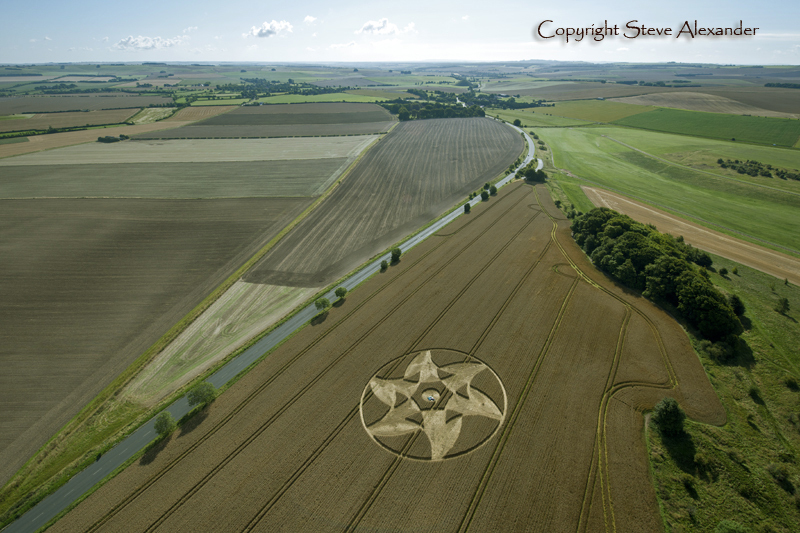 A huge circle at Etchilhampton in mid July was seen as a representation of Metatron’s Cube and was surrounded by a incredibly complex ring of woven crop like a basket weave. 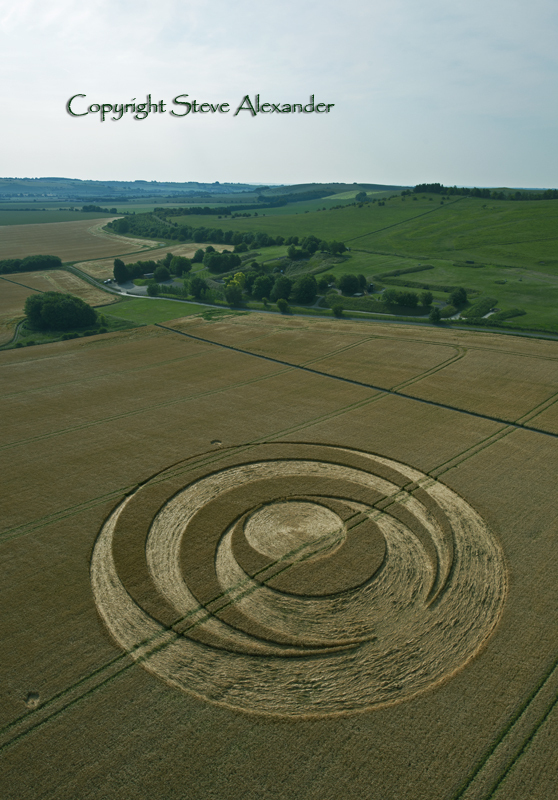 Later in July a formation at Windmill Hill contained a whole gallery of beautifully weaved and knotted centres in its many circles. 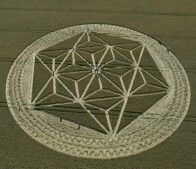 The year culminated with a magnificent Penteract – 5th dimensional Cube at Jubilee Plantation!